© 2002, © 2019 by Paul Freeman. Revised 2/27/19. A circa 1930 photo of a Vought FU-2 biplane (the 2-seat trainer version) from the USS Langley at Mare Island (courtesy of Dann Shively). 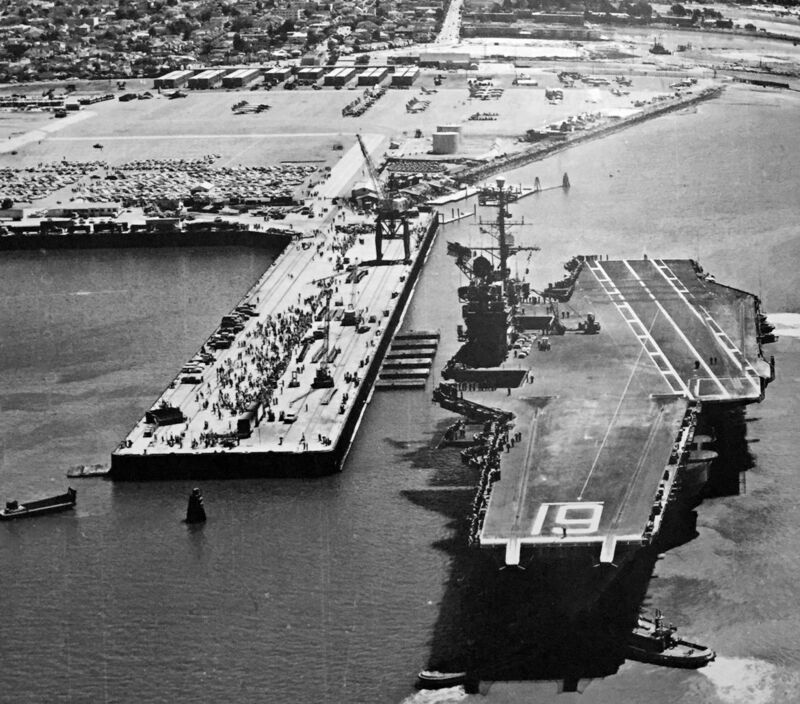 The Mare Island Naval Shipyard was established in 1853.
and became the Navy's first aircraft carrier, renamed the USS Langley. It served the fleet from 1922-36 helping to develop carrier aviation. From 1922-25, Mare Island was the site of an air station, or what local newspapers referred to as such. It was unpaved & unlighted; any air traffic was a rare event; not much of an air station. An undated photo of a Curtiss JN-4 Jenny biplane at Mare Island (courtesy of Dann Shively). An undated photo of a Curtiss JN-4 Jenny taking off in front of the Mare Island Marine Barracks (courtesy of Dann Shively). 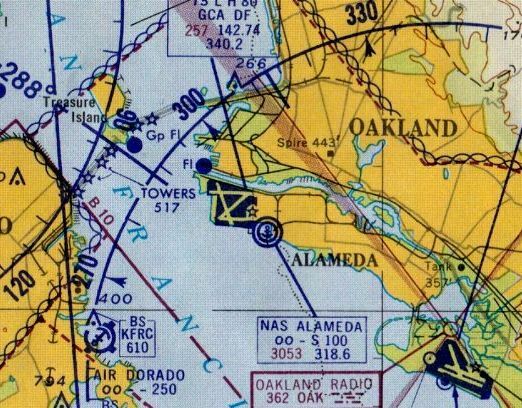 There is no indication of any further aviation use of the Mare Island airfield. 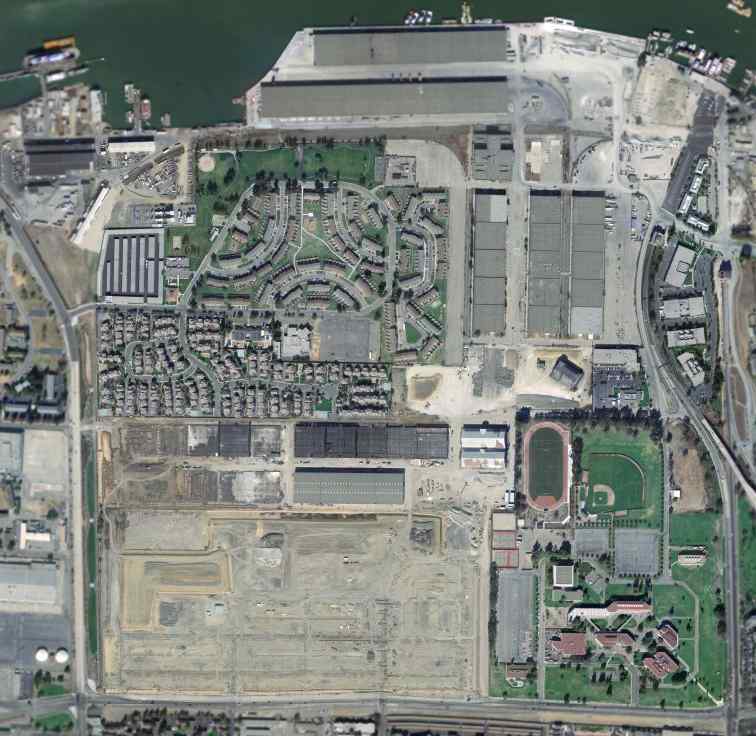 A 2014 aerial view of the general location of the Mare Island Airfield, centered on the former Marine Barracks located at 13th Street & Flagship Drive. 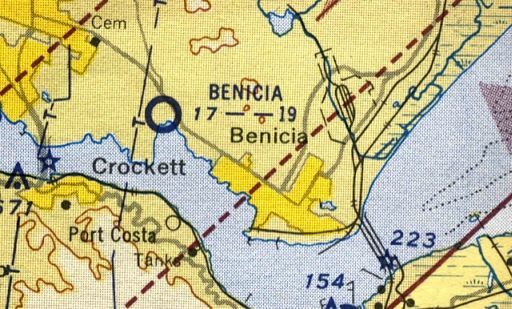 Benicia Airport, as depicted on the 1948 San Francisco Local Aeronautical Chart (courtesy of Tim Zukas). as it was not yet depicted on the 1946 Sectional Chart (courtesy of Dann Shively). It depicted Benicia Airport as having a 2,400' unpaved runway. with one small building along the east side. 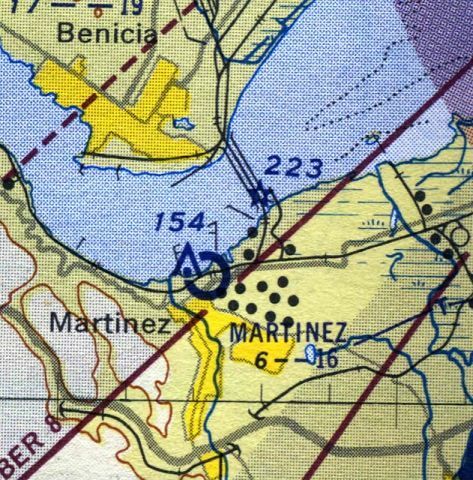 The last aeronautical chart depiction which has been located of Benicia Airport was on the 1954 Sectional Chart (courtesy of Dann Shively). 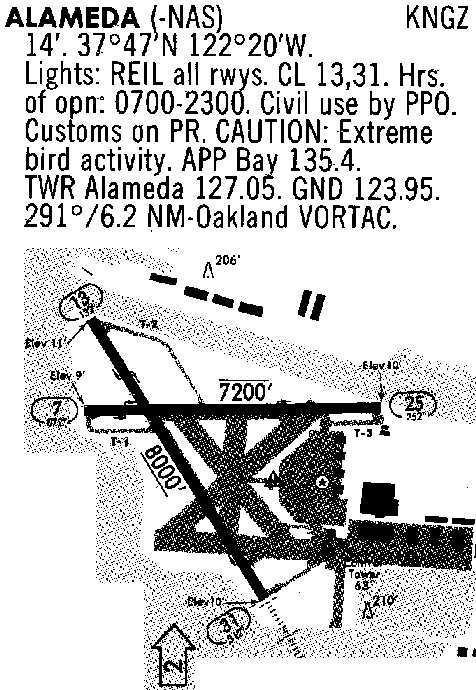 It depicted Benicia Airport as having a mere 1,900' runway. 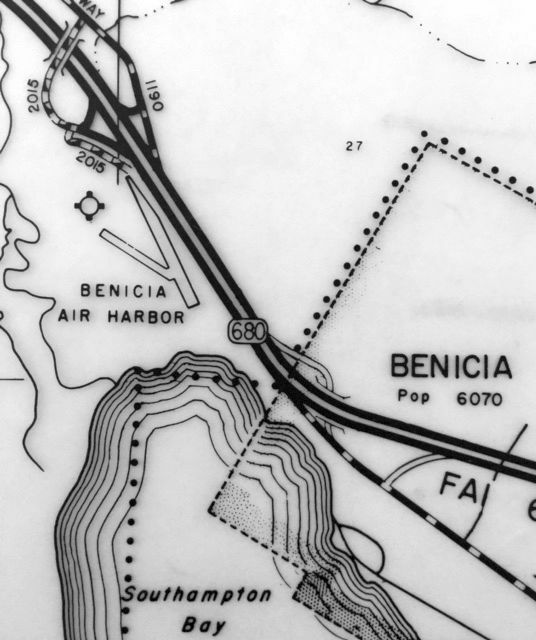 The 1955 CA Highways map (courtesy of Kevin Walsh) labeled the field as “Benicia Air Harbor”. 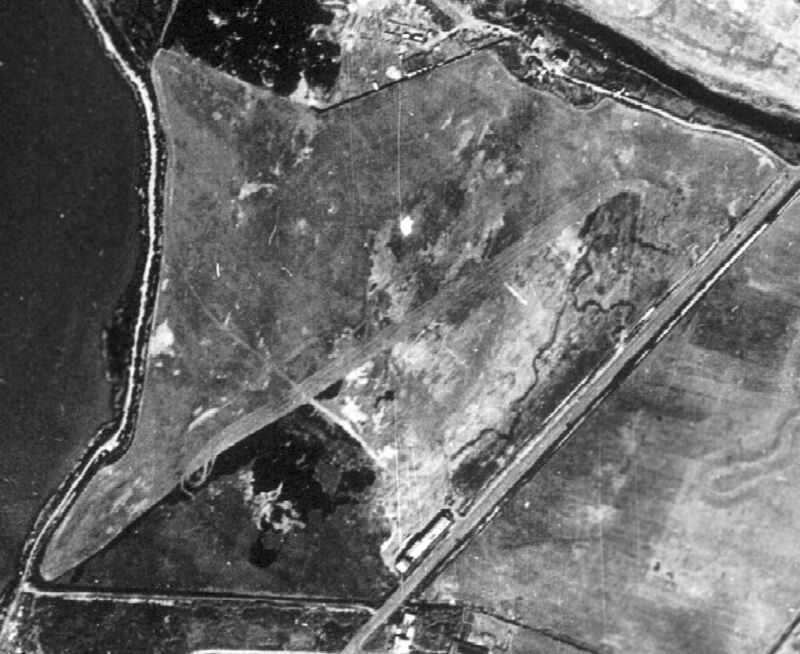 The earliest photo which has been located of Benicia Airport was a 1958 aerial view (from the UCSB Library, courtesy of Jonathan Westerling). It depicted Benicia Airport as having a single unpaved northwest/southeast runway, with a few small buildings along the east side. There was no sign of the previously-depicted crosswind runway. 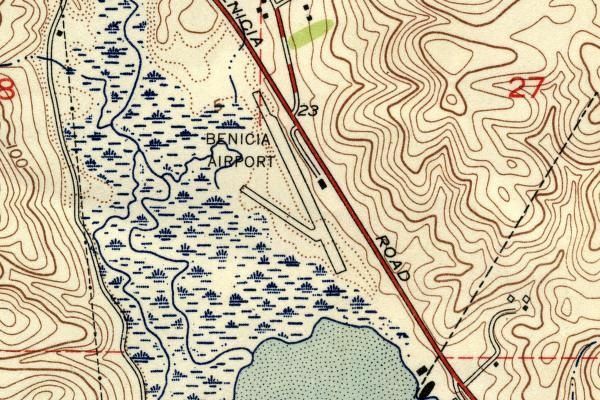 The last depiction which has been located of Benicia Airport was on the 1959 USGS topo map (courtesy of Dann Shively). 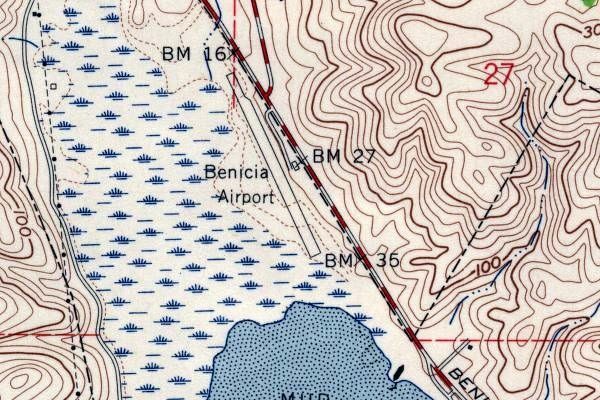 Benicia Airport was depicted in an unchanged fashion on the 1965 USGS topo map. with the runway still recognizable but deteriorated. nor on the 1969 USGS topo map. 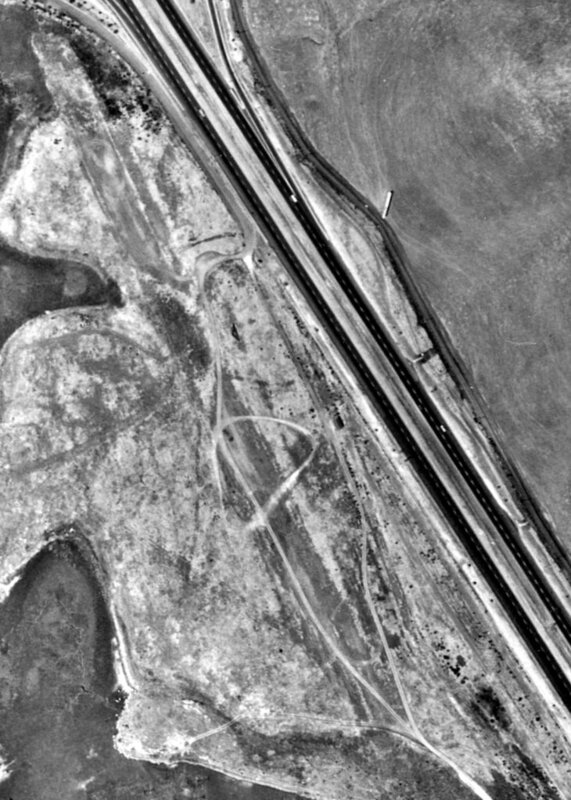 No trace of Benicia Airport was recognizable on a 5/22/72 USGS aerial photo. 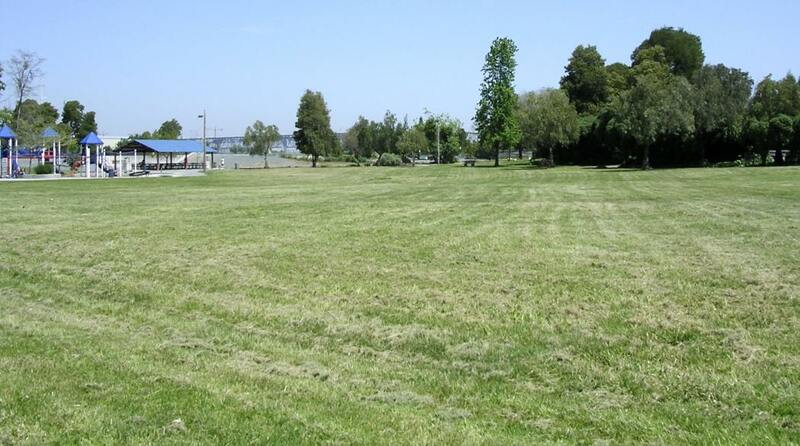 At some point after the closure of Benicia Airport, the site was reused as a park named Benicia State Recreation Area. 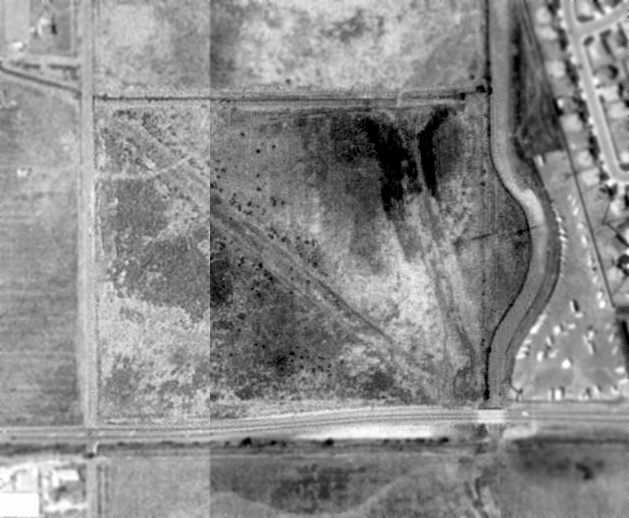 An undated aerial photo from a park map (courtesy of Dann Shively) depicted the northern portion of an abandoned runway at the site of Benicia Airport. 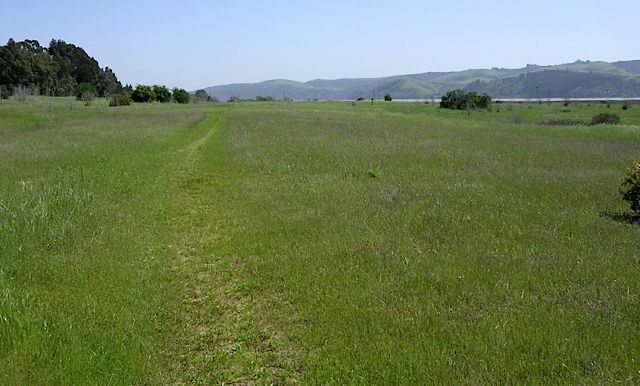 A 2006 photo by Dann Shively looking south at the Benicia State Recreation Area, showing no trace remaining of Benicia Airport. 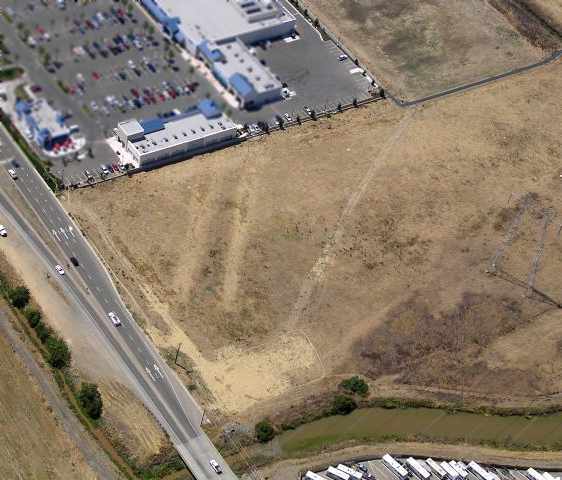 The site of Benicia Airport is located south of the intersection of Route 780 & Rose Drive. A 1937 photo of a hangar marked “Martinez Air Port”, with the radio mast visible in the background (courtesy of Dann Shively). 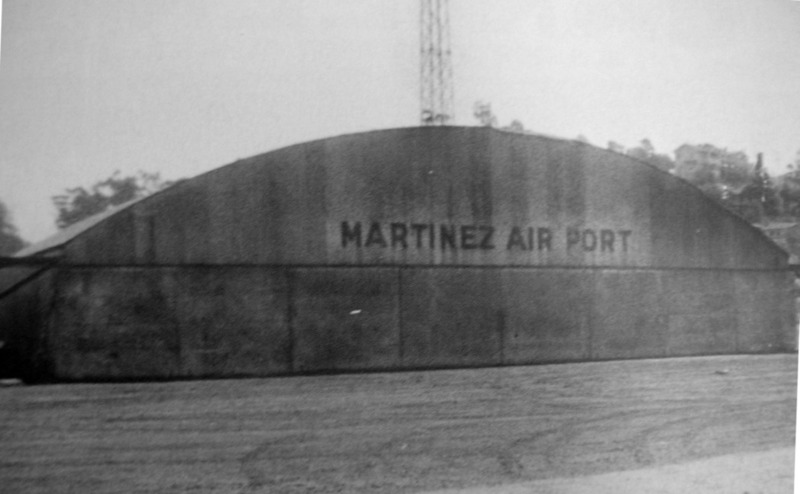 was a 1937 photo of a hangar marked “Martinez Air Port”, with the radio mast visible in the background (courtesy of Dann Shively). A 1937 aerial view (from the UCSB Library, courtesy of Jonathan Westerling) depicted Martinez Airport as having a single southwest/northeast runway with a few small buildings on the west side. 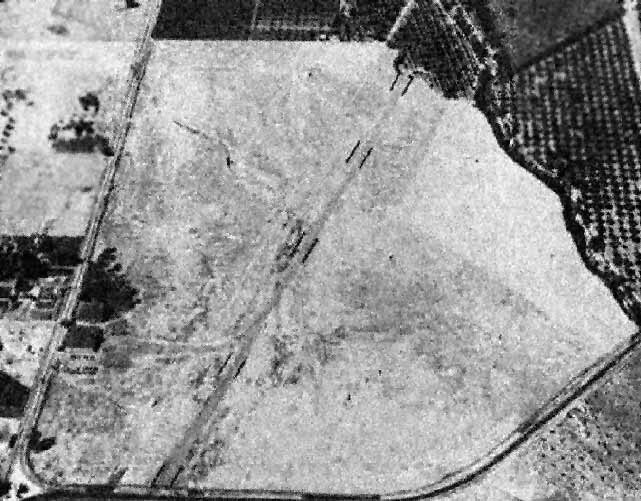 A 1939 aerial view looking southeast showed Martinez Airport to have a single east/west runway with a few small buildings on the west side. showed Martinez Airport to have a single east/west runway with a few small buildings on the west side. 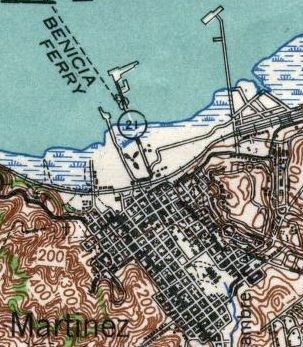 The 1940 USGS topo map (courtesy of Dann Shively) depicted Martinez Airport with the propeller symbol along the coast. as the 1946 Sectional Chart (courtesy of Dann Shively) depicted it as a commercial/municipal airport. William Ludwig recalled, “The runway was a dirt strip running east & west located on the north side of downtown of Martinez next to the bay. depicted Martinez Field as having a 2,000' unpaved runway. 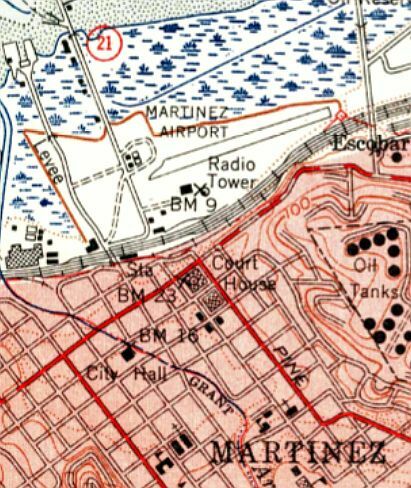 with a few small buildings on the west & southwest sides, and a radio tower on the south side. 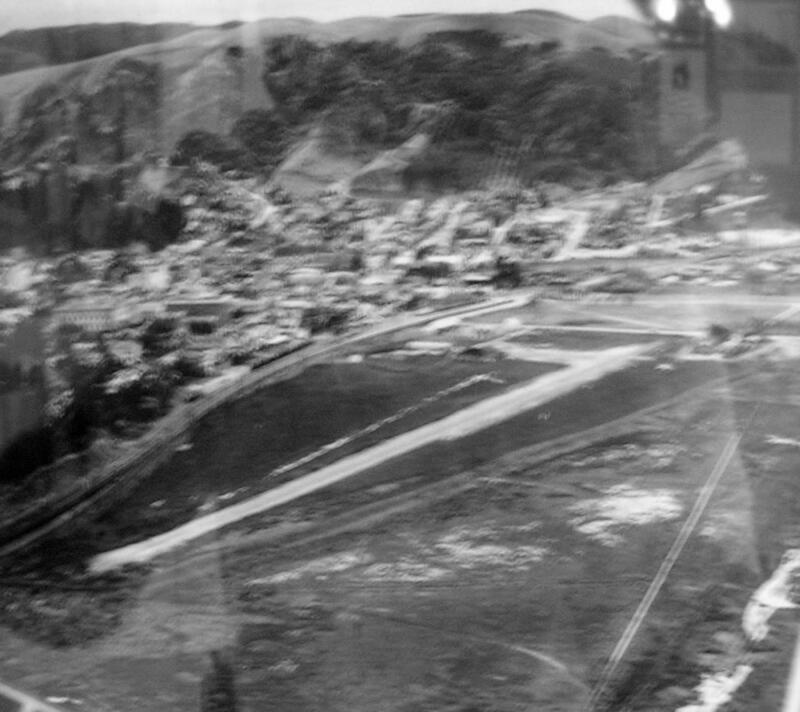 The last photo which has been located of Martinez Airport was a 1950 aerial view looking north (courtesy of Kevin Walsh). It depicted Martinez Airport as having an east/west runway with a hangar at the southwest corner. 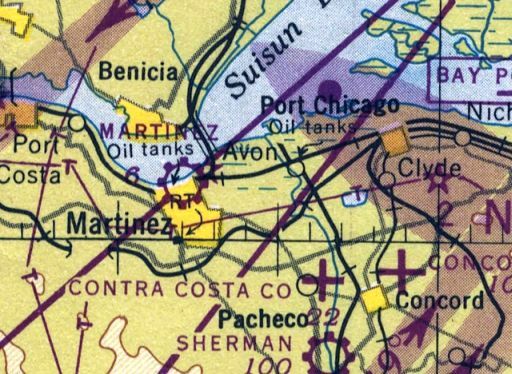 A 1953 street map simply labeled Martinez as “Municipal Airport” (courtesy of Kevin Walsh). 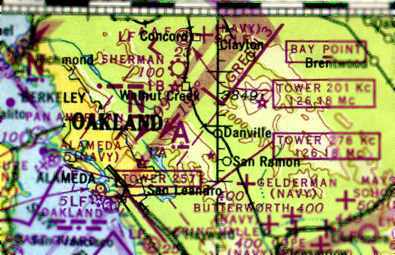 The last aeronautical chart depiction which has been located of Martinez Airport was on the 1954 Sectional Chart (courtesy of Dann Shively). It depicted Martinez Airport as having a mere 1,600' runway. 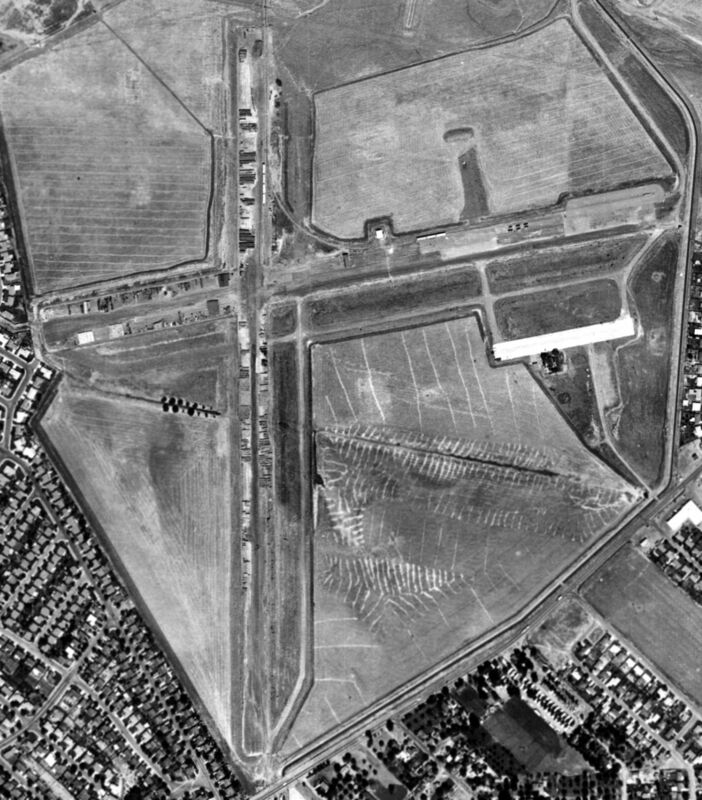 The last depiction which has been located of Martinez Airport was a 1957 aerial view (from the UCSB Library, courtesy of Jonathan Westerling). The runway & hangars appeared to remain intact, but there were no aircraft visible on the field, so it is not apparent if it was still in operation by that point. with only a taxiway & hangar remaining on the southwest side. A 2006 photo by Dann Shively looking east at Waterfront Park, not showing any trace of Martinez Airport. 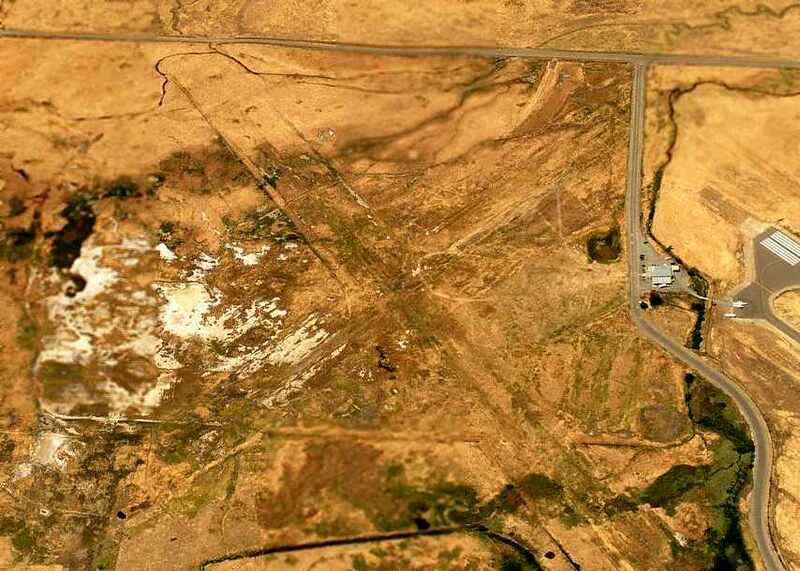 A 4/16/13 aerial view showed no trace remaining of Martinez Airport. As of 2014, street maps labeled the site of Martinez Airport as Martinez Waterfront Park. The site of Martinez Airport is located northeast of the intersection of Joe DiMaggio Drive & North Court Street. Thanks to Kenneth Wetherall for pointing out this airfield. depicted Byron Airpark as a private airfield having a 2,100' unpaved runway. 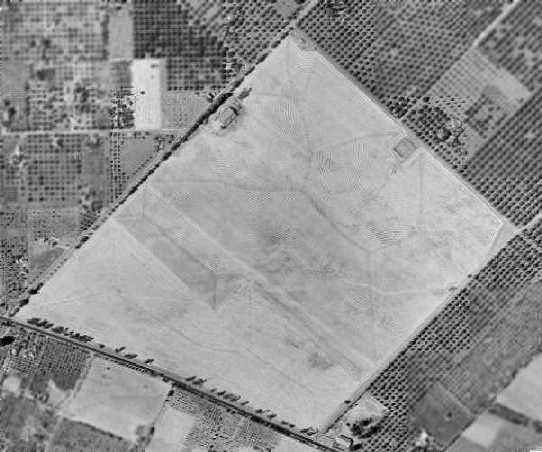 No airfield was yet depicted at this location on a 1938 aerial photos. (possibly to support Concord Field training) and to support the Byron Hot Springs, which is adjacent to the field. The Byron Hot Springs was a turn-of-the-century luxury resort that was used during WW2 as an interrogation facility for German and Japanese officers. (I have heard that there was an airfield on the property some time prior to WW2 & was used by the Hot Springs. 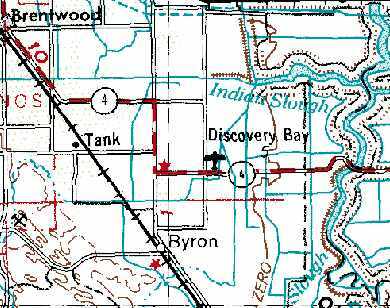 The Byron Airpark was not listed among active airfields in the 1945 AAF Airfield Directory (courtesy of Scott Murdock). 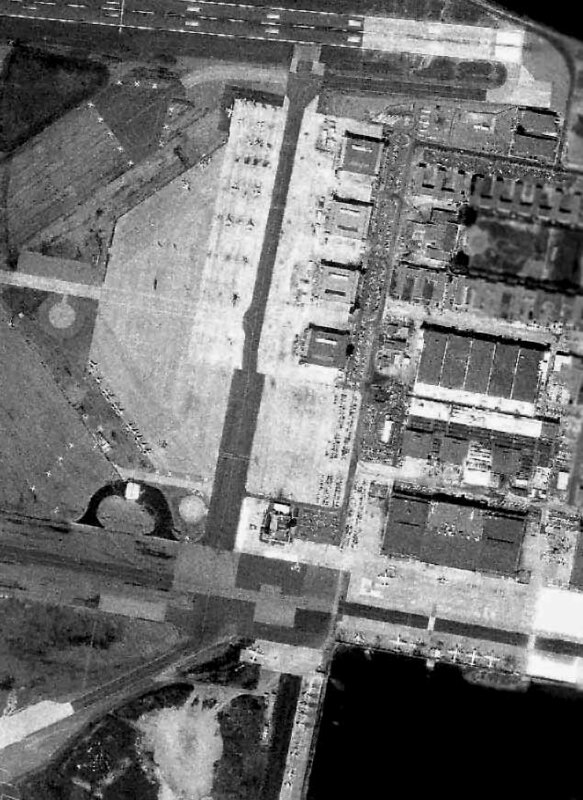 No airfield was depicted at this location on 1949 & 1959 aerial photos. 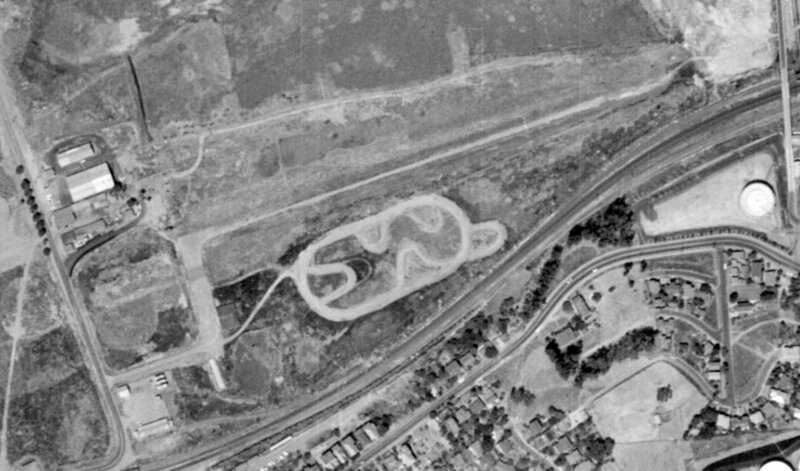 The earliest photo which has been located of the Byron Airpark was a 1966 aerial view. It depicted Byron as having 3 unpaved runways. 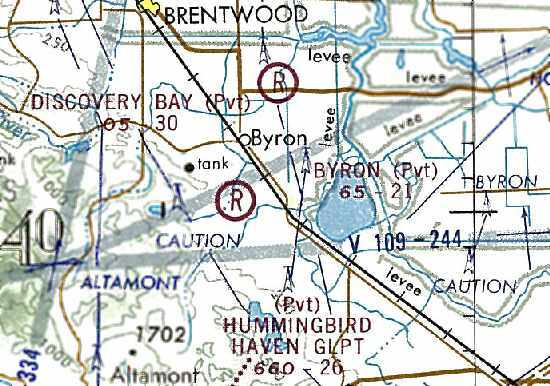 The Byron Airport was not yet depicted on the 1968 USGS topo map. was on the 1973 San Francisco Sectional Chart (courtesy of Jonathan Westerling). It depicted Byron as a private airfield having a 2,100' unpaved runway. 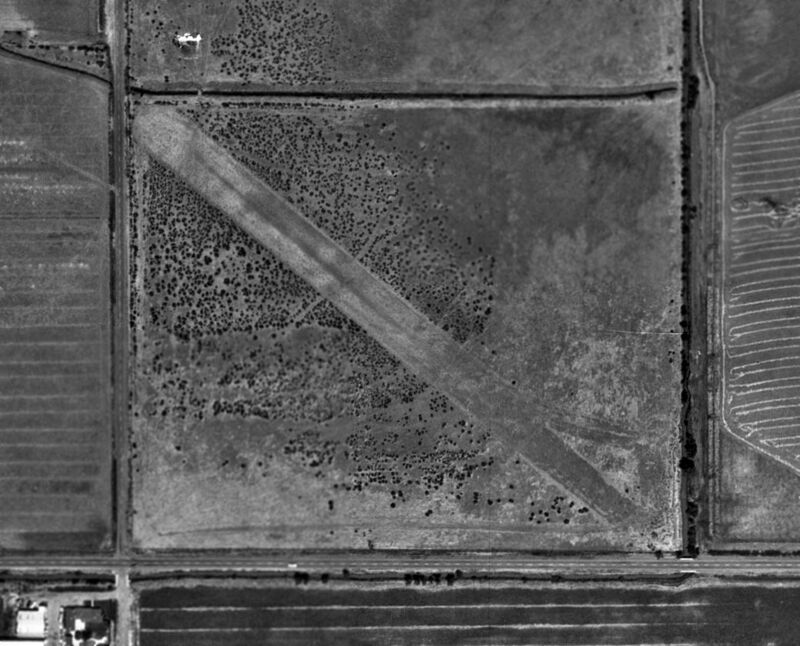 The earliest photo which has been located of the Byron Airpark was a 4/11/74 USGS aerial view. 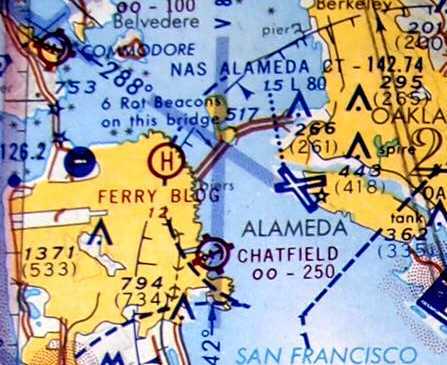 The 1975 San Francisco Terminal Chart depicted Byron Airoark as a private airfield with a 2,100' unpaved runway. as having 3 dirt runways, all 2,100': Runways 9/29, 4/22, and 14/32. According to Rich Harrison, “I was a member of the Concord chapter of the EAA (393) in the mid 1970s to late 1980s. One of the members was Bud. He & a couple of partners purchased the former airfield some time in the late 1970s. They asphalted 2 of the 3 original runways & opened it up. I flew out there in my Grumman Yankee many times for EAA activities, and to just stop in to say hi. Bud built a house adjacent to the airport. 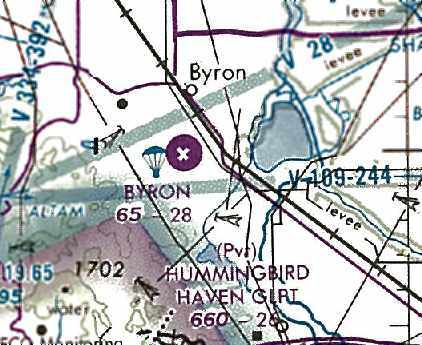 The 1979 AOPA Airports USA Directory (according to Jonathan Westerling) described Byron (4Q5) as a private airfield. 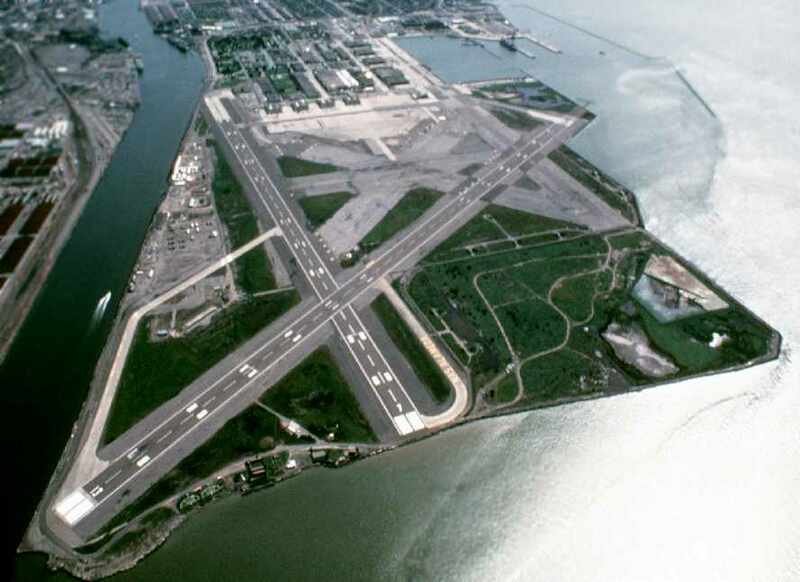 It was said to have 2 dirt runways in an 'X' pattern: 2,100' Runway 14/32 & 2,000' Runway 4/22. This included some student training, according to the NTSB Accident Database. depicted Byron as a private airfield having 2 paved runways, with the longest being 2,100'. According to Jonathan Westerling, Contra Costa County records stated that “The Byron Airpark was purchased in 1986.
described Byron Airpark as a public-use airport which conducted ultralight operations. It depicted the field as having a 2,800' paved Runway 14/32 & a 2,100' paved Runway 4/22. Several buildings were depicted on the east & northeast sides of the field. was on the 1989 San Francisco Sectional Chart (courtesy of Jonathan Westerling). and also showed that skydiving operations had commenced. 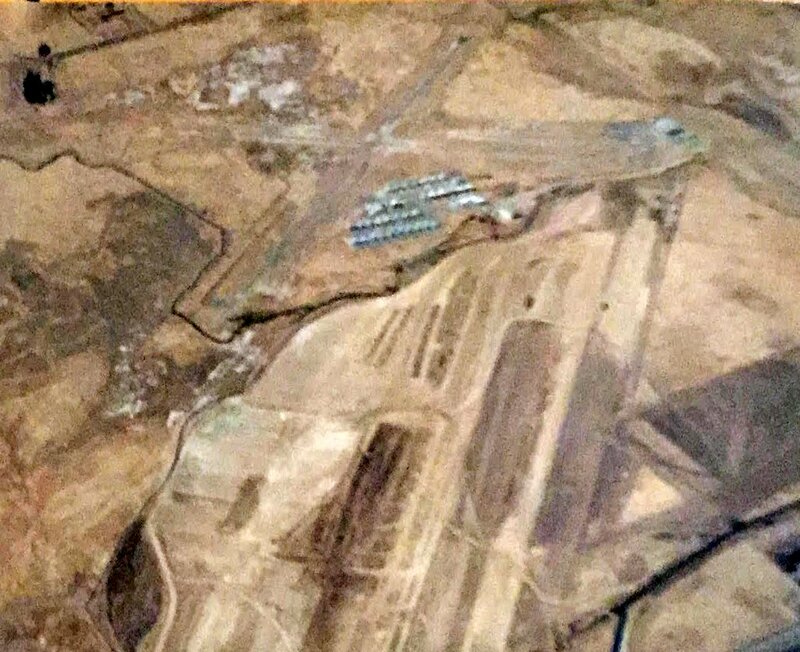 of what appeared to be individual T-hangars on the east side of the airfield with 2 paved runways. also showing the new Byron Airport under construction (bottom of photo). Presumably the old Byron Airpark was closed around the same time the new airfield opened. 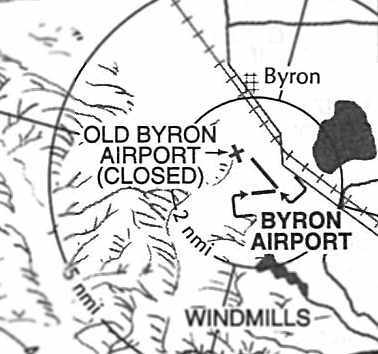 still depicted the “Old Byron Airport (Closed)” adjacent to the new Byron Airport. showed that all of the pavement of the 2 former runways had been removed, along with all of the buildings. Note the runway of the new Byron Airport on the right edge of the photo. 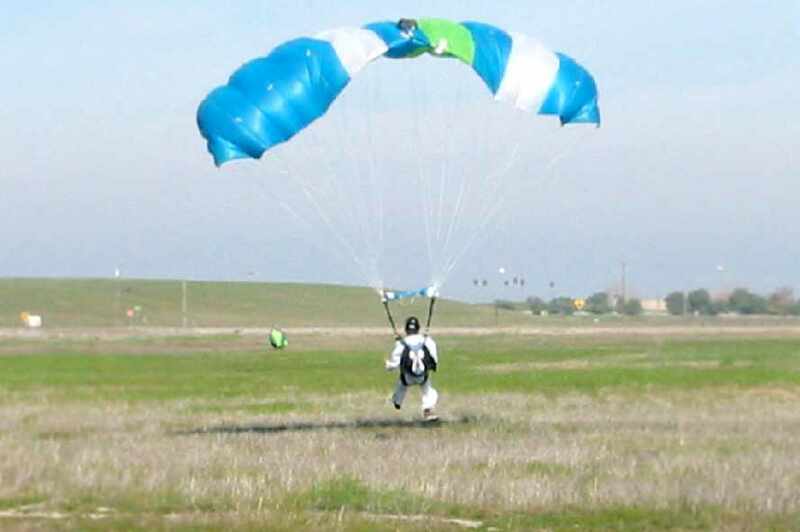 A February 2008 photo by Jonathan Westerling of a skydiver touching down on what used to be Byron Airpark's Runway 22.
as the property is the Drop Zone for Bay Area Sky Diving. A call to their receptionist revealed that they were well aware of the property’s prior use as an airfield. She mentioned that they are sometimes removing bits of the old runway which poke up out of the ground. A February 2008 photo by Jonathan Westerling of the windsock at the old Byron Airpark. 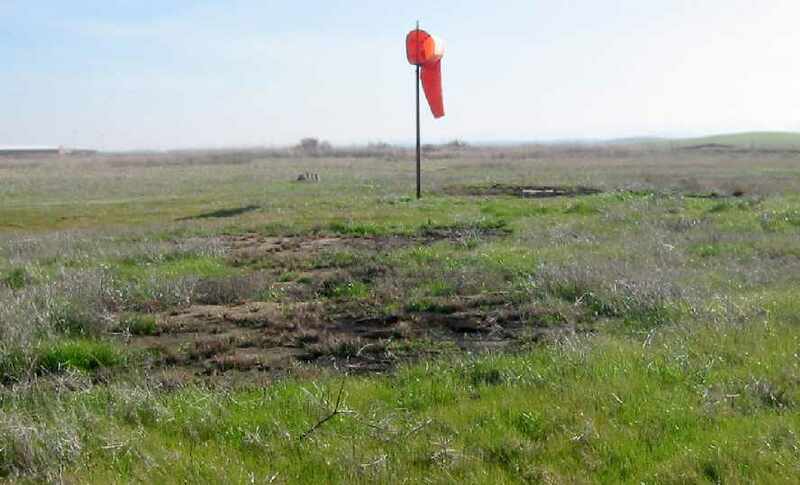 According to Jonathan, the windsock “has been restored by Bay Area Skydiving to indicate the wind direction on their drop zone. out of a hundred or more white steel-belted tires which were burned in a recent grass fire. A February 2008 photo by Jonathan Westerling of “All that remains of a building near the hangars of the old Byron Airpark. 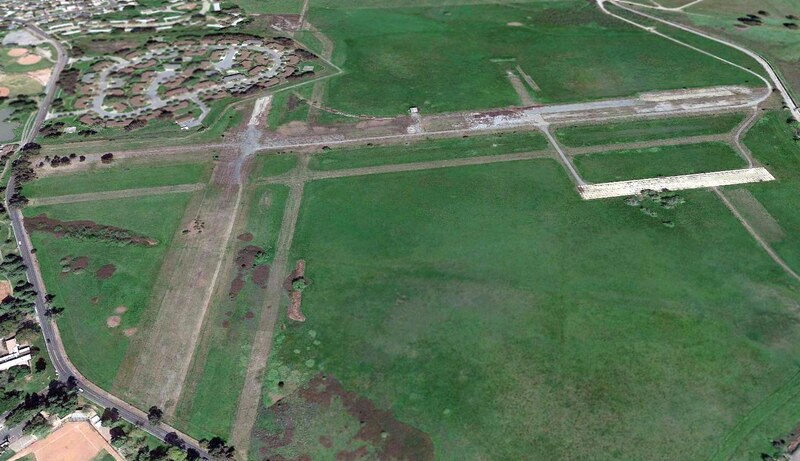 A February 2008 photo by Jonathan Westerling, “Looking up the remains of Runway 32 at the Byron Airpark. but a parachutist target symbol was still plainly apparent in the center of the site. adjacent to the west side of the current-day Byron Airport. A 5/28/65 aerial photo of the Discovery Bay Airfield (from the UCSB Library). 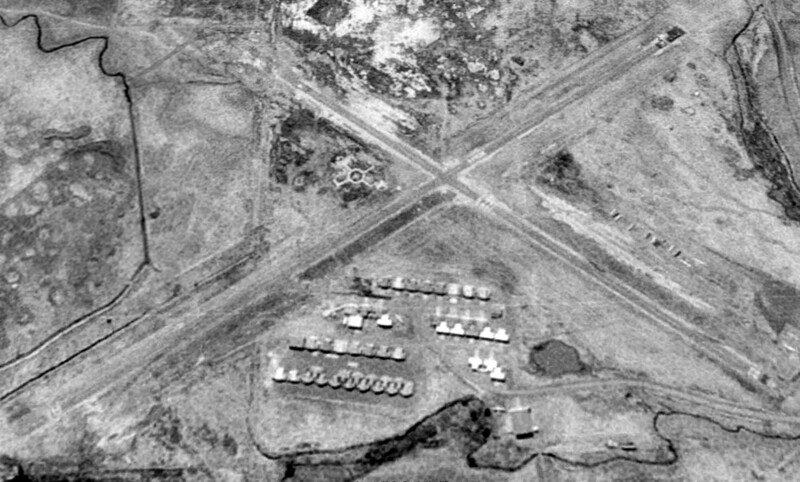 This short-lived private airfield may have been related to the construction of the adjacent housing development. 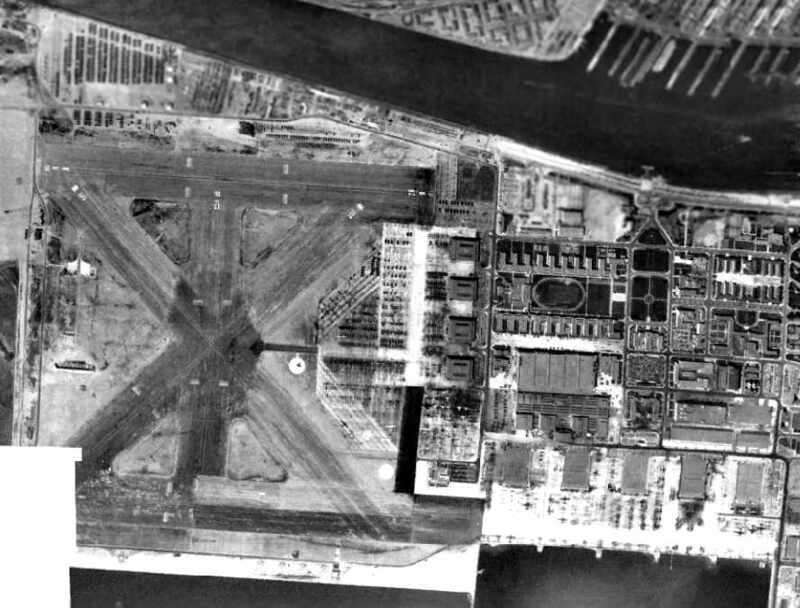 as it was not yet depicted at all on a 1959 aerial photo. 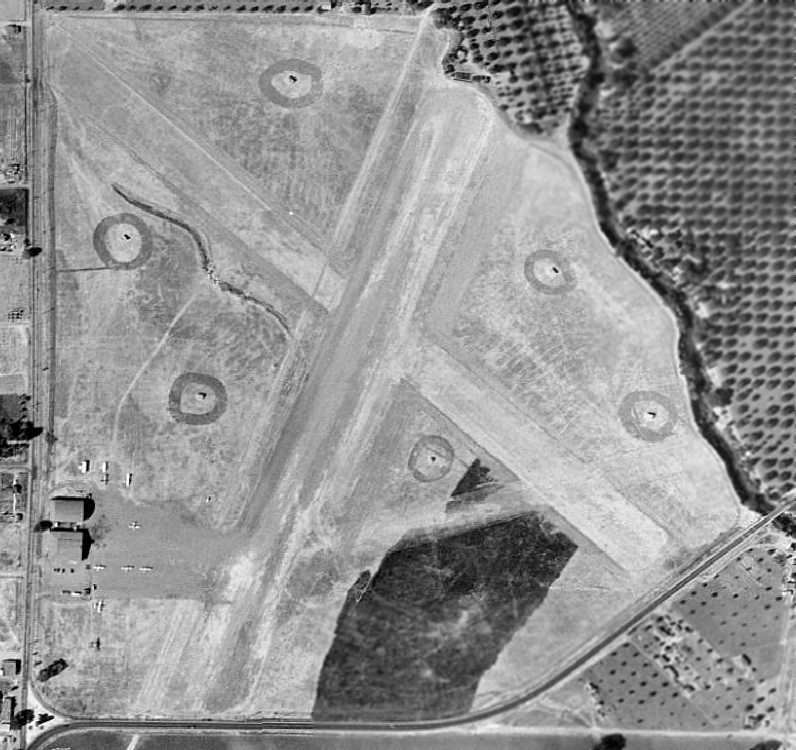 The earliest depiction of the airfield which has been located was a 5/28/65 aerial photo (from the UCSB Library). but did not depict any buildings or other improvements. 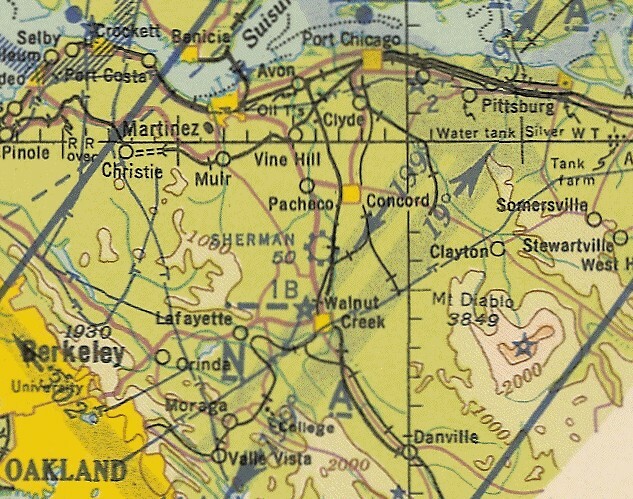 Discovery Bay was not yet depicted at all on the 1966 San Francisco Sectional Chart (according to Chris Kennedy). 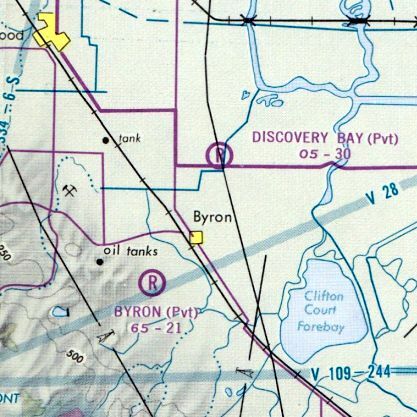 Discovery Bay Airport, as depicted on the 1969 USGS topo map. was on the 1970 San Francisco Sectional Chart (courtesy of Dann Shively). 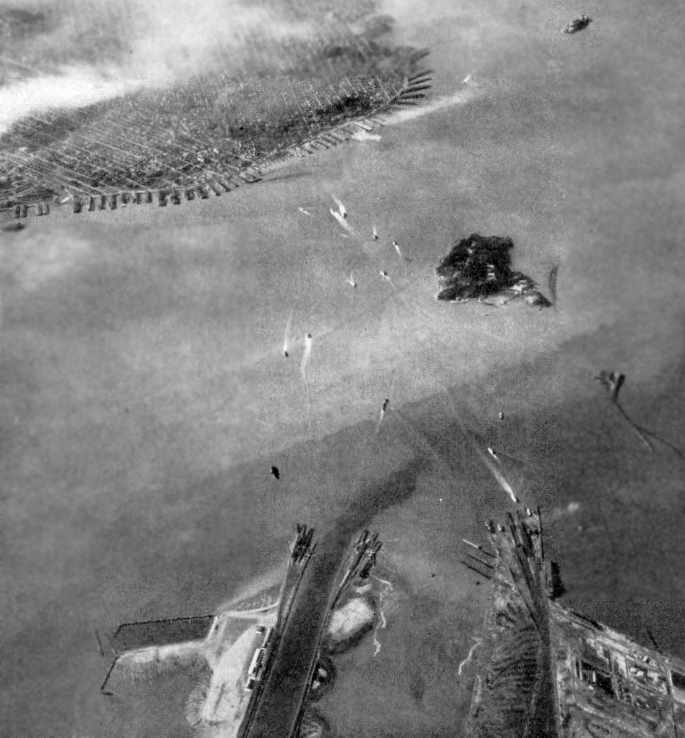 It depicted Discovery Bay as a private airfield with a 3,000' unpaved runway. Dann Shively recalled, “When I first started flying in 1972 I tried to explore my local area from the air as much as possible. I noticed a small strip on my Sectional Chart called Discovery Bay. Although I never landed there, I flew over it from time to time in the early 1970s. Nearby is the Discovery Bay development. It's a man-made series of waterways with all houses having direct water access. It started small in the 1970s and has grown over the years into a city with more & more waterways being added. On the southwest corner of the development sat the small dirt or grass field. was on the 1975 San Francisco Terminal Chart. was in the 1976 AOPA Airports USA Directory (according to Chris Kennedy). nor on the 1976 USGS topo map (although it did depict the 1st stages of the adjacent housing development). 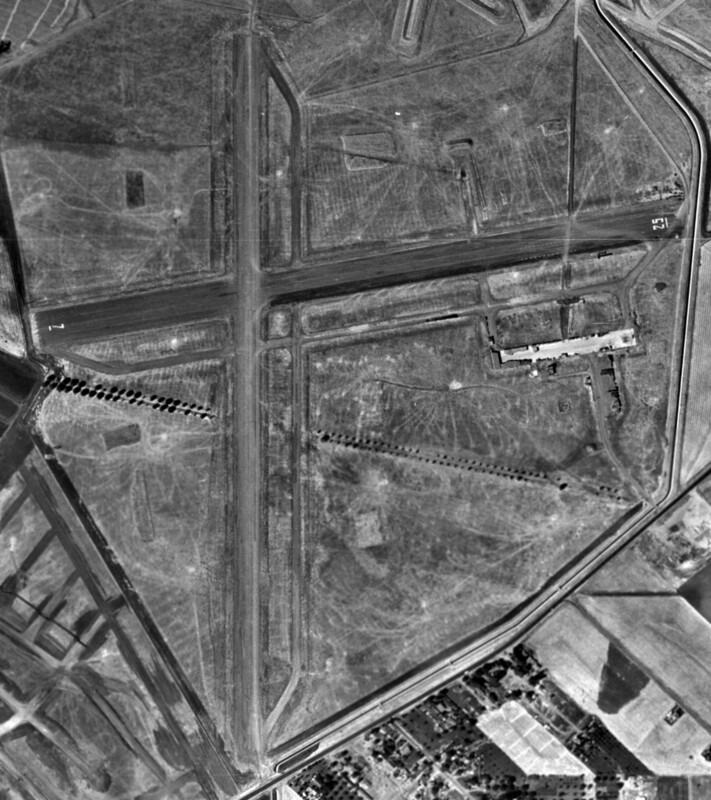 A 1979 aerial photo depicted the airfield in basically the same state as that seen in 1966.
showed the remaining outline of 2 runways (oriented northwest/southeast & north/south). There was no sign of any buildings having been at the airport site. 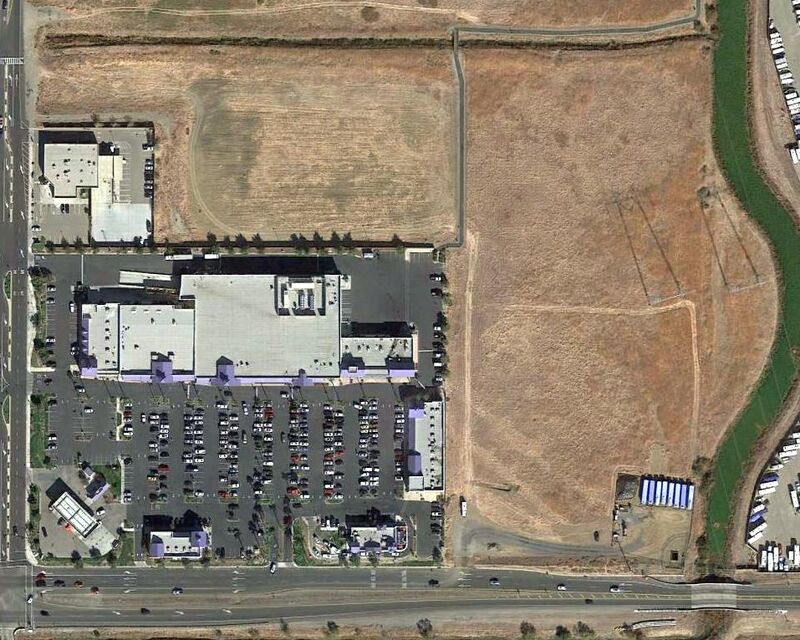 Dann Shively reported in 2005, “In the last year or so a shopping center has been built on part of the property. I flew over it today & you can still see part of the runway on the east side. 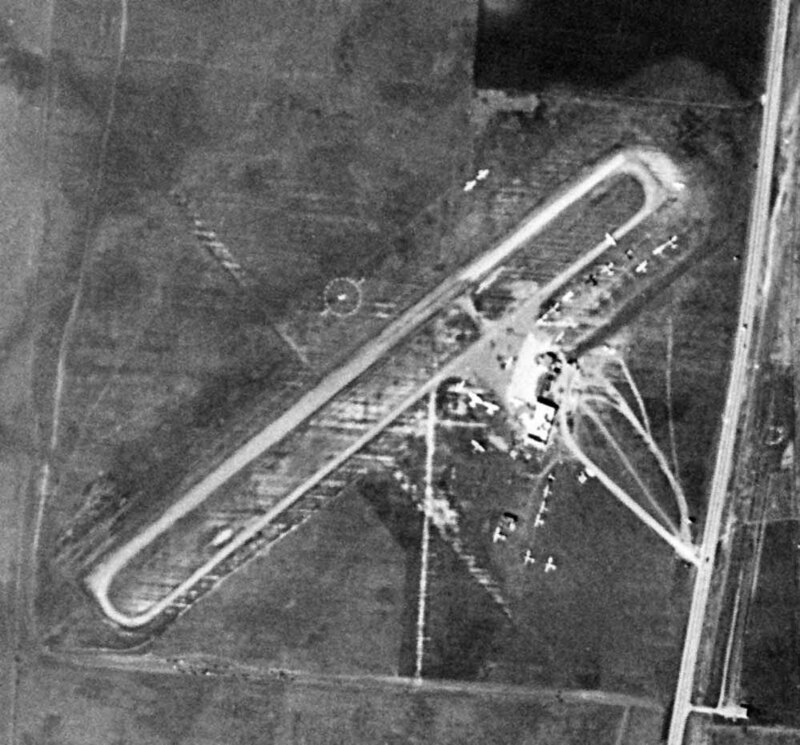 with the remains of the southeast portion of the runway still recognizable. A 2005 aerial photo by Dann Shively looking northwest at the remains of the runway at Discovery Bay Airport. A 2015 aerial view showed that a short portion of the southeast end of the Discovery Bay Airport runway remained barely recognizable. The site of Discovery Bay Airport is located on the northwest corner of Route 4 & Bixler Road. A circa 1936 photo by George Low of his International F-17 at Knight's Airport. This little airport was known under several names throughout its history. 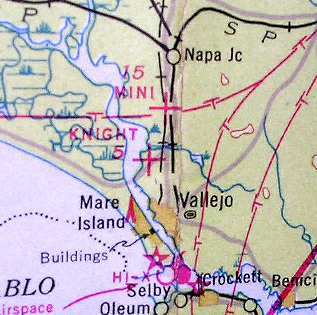 It was originally known as Vallejo Airport. and established a flight school at Vallejo Airport. The airport may have been renamed "Knight" Airport by 1936.
was a circa 1936 photo by George Low of his International F-17 biplane. 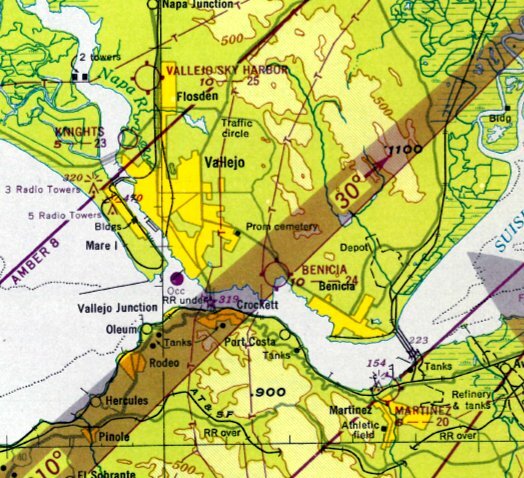 described Vallejo Airport as being located "2 miles northwest" of the town of Vallejo. with the longest being a 2,500' northeast/southwest strip. A hangar on the southeast side of the field was described as having "Vallejo" painted on the roof. The earliest aerial photo which has been located of Knights Airport was a 10/9/37 aerial view (from the UCSB Library). It depicted Knights Airport as having an unpaved northeast/southwest runway, with a small building on the south side. 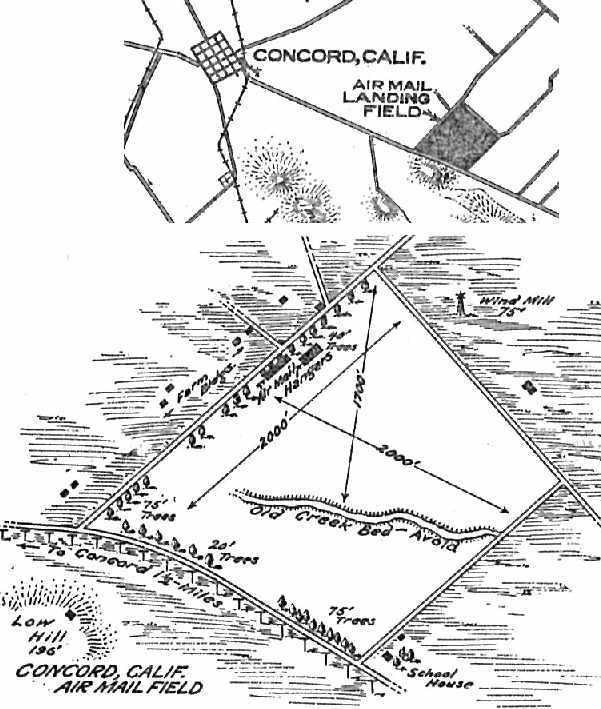 depicted "Knight" Airport as an auxiliary field. but did not label the airport. which was how it was depicted on the 1946 Sectional Chart (courtesy of Dann Shively). Bill McClinton recalled, “During WW2 as a kid I lived at 34 McNair Street, a couple of blocks from Stan's Airpark. We called it Knight's I think. I went there frequently, made friends with a WW2 pilot who had a surplus BT-13. he had what I believe was a Stearman with clipped wings & a type R985 engine of 400 or 450 hp. I remember the Mobil gas station either being built or being refurbished shortly after the war ended. An undated (circa 1946-48) business card for Stan's Airpark (courtesy of Stan Woodman). Stanley Glenn Woodman recalled, “I was born the son of Stanley Clarence Woodman. My father either owned or leased & operated the subject airport in the years immediately after World War II. He named it 'Stan's Airpark' after his own name. He offered flight instruction & charter services. In 1945 my father took over the airport variously known as Stan's Airpark & Knight's Airport. 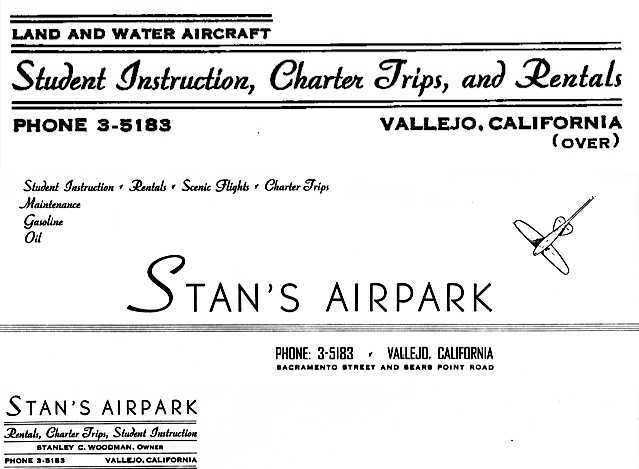 I had always assumed that my father had built the airfield known to me as Stan's Airpark. and clear memories that I have of my father framing buildings on the site. He was building either the hangar, or the burger & beer joint next to the airport (named Faoro's). Burgers, beer, and shuffle board. I hung around there as a kid - great hamburgers, but don't know about the beer as I was too young. Another reason is that I had a photo of him (or a worker) on a bulldozer grading the crosswind runway. Stanley continued, “I have memories of my father taking me flying from the airport on its dirt strips. Even after my parents separated, I hung around the hangar there. There were always biplanes & other rag-wing aircraft of the era in the hangar, under various states of repair & being repainted. and whenever I am in a hobby shop & smell model airplane dope, it transports me back to those times. I recall a number of derelict aircraft on the field, including a couple of Texan AT-6s. I used to climb around in them & envision myself fighting the enemy in aerial combat. I also recall once an air show held at the field. My mother sometimes talked of a wingwalker, who parachuted from the wing of a biplane at the air show. An undated (circa 1946-48) photo of the Mobil Oil service station, burger joint, and hangar at Stan's Airpark (courtesy of Stan Woodman). 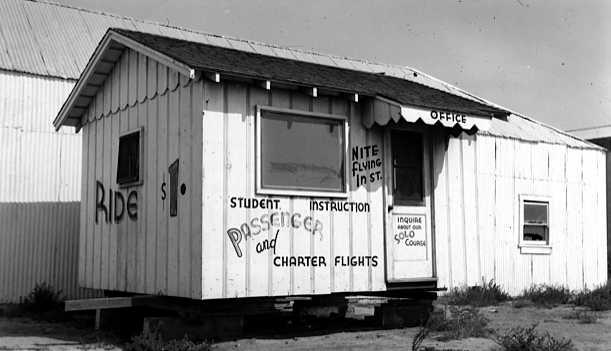 An undated (circa 1946-48) photo of the Stan's Airpark office (courtesy of Stan Woodman). Stanley Woodman continued, “I believed that the airport was bought by a man named Knight after my father left it. then perhaps he had merely leased the property, rather than own it. Dann Shively recalled, “It was known as Knight's as long as I knew it growing up. In fact there was a large painted sign on the hangar facing the road that read 'Knight's' airport." as that is now it was labeled on the February 1948 San Francisco Local Aeronautical Chart (courtesy of Tim Zukas). Al Shively (who had just soloed after just 1.5 hours of instruction), and Russ Moody (Al's instructor). Dann Shively recalled, "Growing up in Vallejo, I remember as a child when Knight's Airport was still in operation. My dad, in 1948, as a publicity stunt, soloed an Ercoupe there after only an hour & a half of instruction." 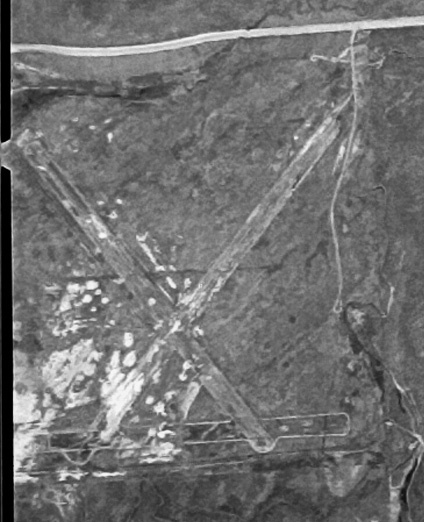 The last photo which has been located showing aircraft at Knights Airport was a 4/18/48 USGS aerial view. with a dozen light aircraft parked around a few small buildings on the south side. with the longest being an 1,800' northeast/southwest strip. “the airfield as having 4 strips... I have difficulty accepting that, as there simply was not enough room in that area to support 3 parallel runways & a crosswind. As a young boy I used to hike, explore, and hunt that area. It wasn't very expansive & was very marshy, being part of the Napa River delta. 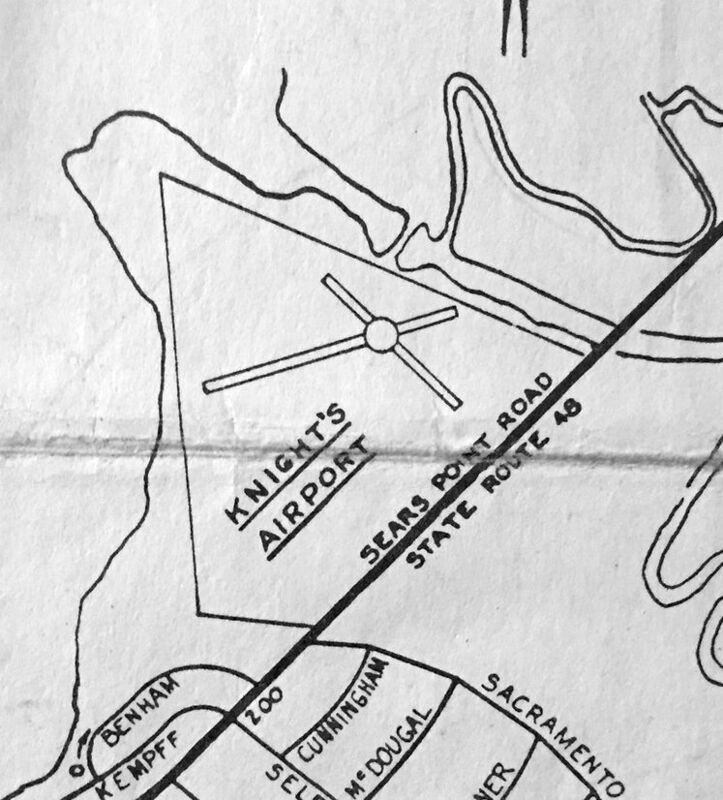 A November 1953 Vallejo Chamber of Commerce map (courtesy of Kevin Walsh) depicted Knight's Airport as having a 2 runways. was on the 1954 Sectional Chart (courtesy of Dann Shively). It described Knights as having a 2,200' unpaved runway. it was not apparent if the field was still operating. The 2 runways were still evident, but deteriorated. The hangars remained intact, but there were no aircraft visible on the field. as it was no longer depicted on the June 1965 Sacramento Sectional Chart (courtesy of Ron Kunse). A 1965 aerial view (from the Alexandria Digital Library @ UC Santa Barbara, courtesy of Jonathan Westerling) depicted Knights Airport after its closure. The 2 runways were further deteriorated. The southwest hangars had been removed at some point between 1957-65, but the southeast hangar remained intact. 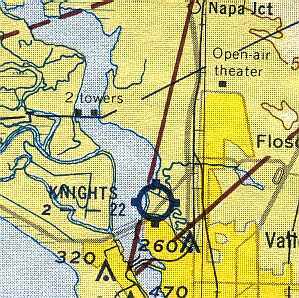 Knights Airport was no longer depicted on the 1968 USGS topo map. still showed the remnants of the runways & what appeared to be a hangar still standing of the east side of the field. after I had become pilot out of Oakland International Airport, I often overflew the old airfield. of a heavy rainstorm, strong winds and extra high tides that caused a permanent breach in the levee. The 1993 USGS aerial photo showed that the waters of the Napa River had risen over the site of Knights Airport. Dann Shively reported in 2003, "I watched it slowly deteriorate over the years. The office & hangar disappeared, and the runways were taken over by swamp grass until a levee broke & the whole area was under water. Currently the stretch of Sears Point Road (Highway 37, now known as Marine World Parkway) that was next to the field, is being widened. Shortly, what was the airport will be under a new roadway." A 2003 panoramic composite photo by Dann Shively, looking east at the site of Knight's Airport. Dann visited the site of Knight's Airport in 2003. "Highway 37 / Sears Point Road / Marine World Parkway is being widened adjacent to the old Knight's Airport in Vallejo. There's also an interchange being built just to the west. I climbed up on what's built so far of the interchange & got a nice shot of the former airport. I actually stitched 2 shots together for a panorama. The shot is looking east. That's the Napa River on the left & the highway on the right. You can see the new section of the highway which isn't opened yet. That new section partially or wholly covers what was one of the runways that ran along the existing 2 lane road. As mentioned before it's a wetlands area with marsh grass & tules. 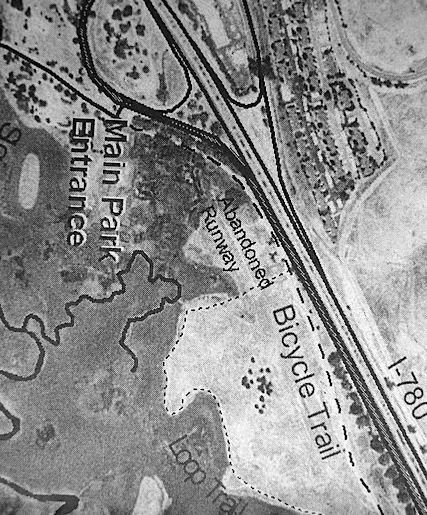 Running along the bottom of the photo is a drainage canal & levee that's evident in your old topo map of the airport." 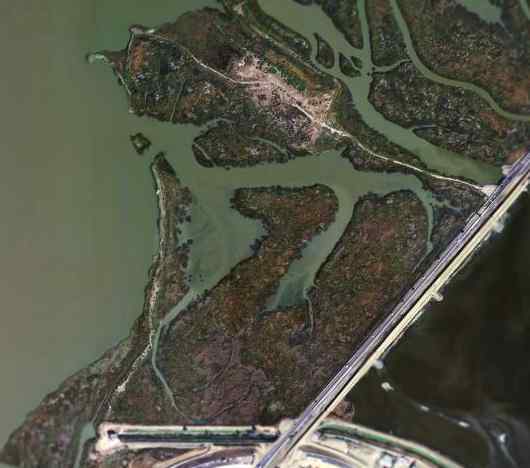 As seen in a February 2004 USGS aerial photo, the site of Knight's Airport was still submerged under the waters of the Napa River. is apparently at a slightly higher elevation than the surrounding terrain, as it was still above water. 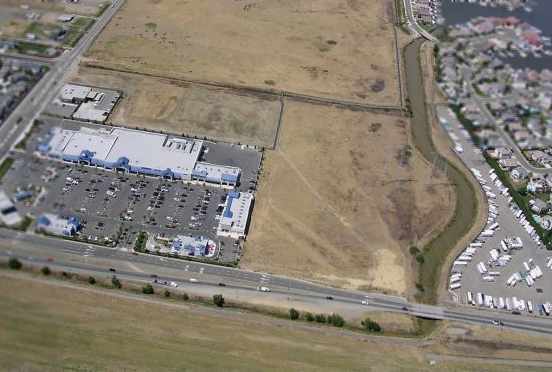 The site of Knights Airport is located north of the intersection of Marine World Parkway & Sacramento Street. A circa 1936 photo by George Low of a friend in front of George's International F-17 at Mini Field. 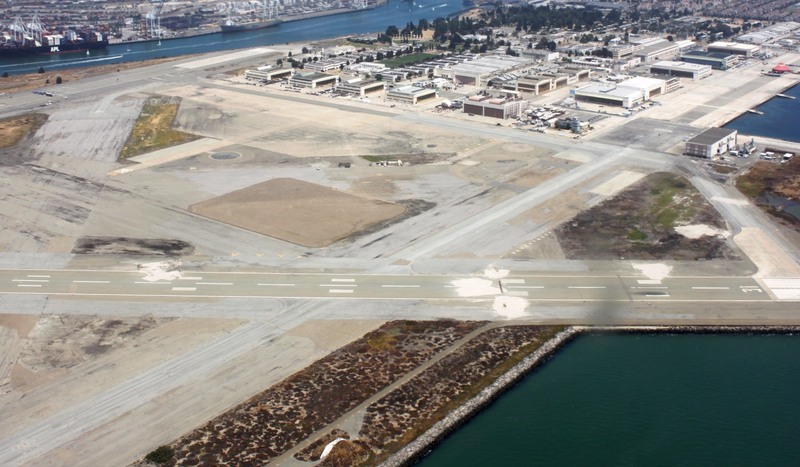 The date of construction of Vallejo Airport has not been determined. 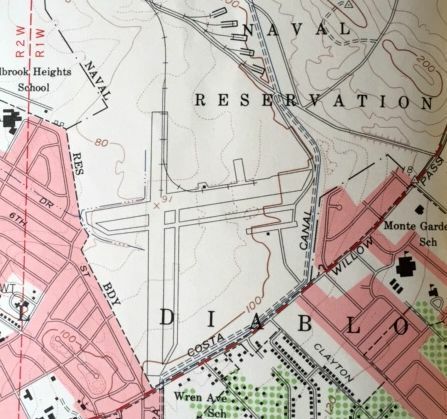 as a "Vallejo" Commercial Airport was listed as being located "3 miles due north of Vallejo"
in the Standard Oil Company's 1929 "Airplane Landing Fields of the Pacific West" (courtesy of Chris Kennedy). and the "main highway to Sacramento" was said to border the east side of the field. That description seems to match later map depictions of what eventually became Vallejo Sky Harbor Airport. By 1936, the airport had apparently been renamed "Mini" Airport. was a circa 1936 photo by George Low of a friend in front of George's International F-17 at Mini Field. Dann Shively recalled, "The Mini family owned most of the property in that area. In fact, the site of the airport is near what is now Mini Drive." 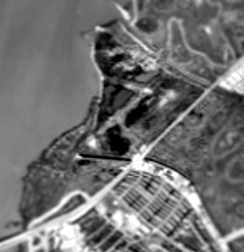 However a 1937 aerial photo (according to Jonathan Westerling) did not show traces of an airport at the eventual site of Vallejo Airport. A circa 1938 photo of several aviators including some famous pilots in front of an unidentified biplane at Mini Airport (courtesy of Gary Cullen, via Dann Shively). Dann Shively reported, “Standing in front is Douglas ('Wrongway') Corrigan, the man who claimed he accidentally flew from New York to Ireland instead of flying west to California. Standing next to him is Beryl Markham, the first woman to fly solo across the Atlantic non-stop from east to west. 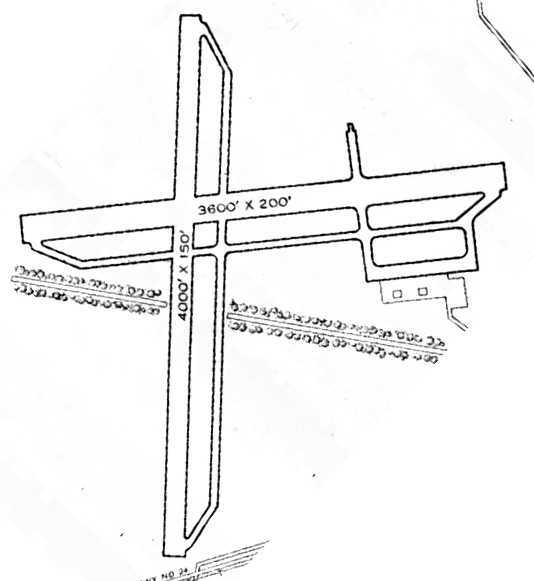 The 1939 Sectional Chart (courtesy of Dann Shively) depicted “Mini" Airport as an auxiliary airfield. 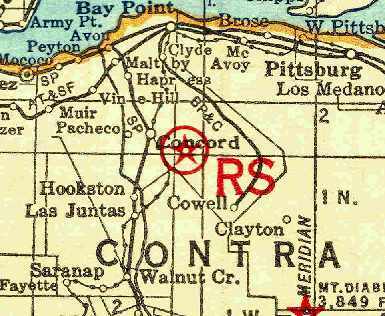 as it was depicted as "Sky Harbor" on the 1946 Sectional Chart (courtesy of Dann Shively). According to Joe D’Agosta's obituary (courtesy of Dann Shively), after WW2 he built & operated Sky Harbor Airport. depicted "Vallejo Sky Harbor" Airport as having a 2,500' unpaved runway. 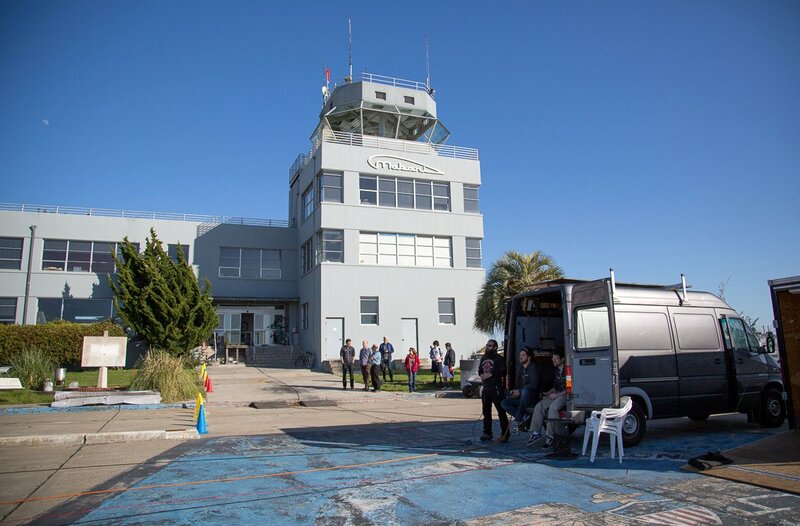 showing 17 light single-engine aircraft, the airport office, and a hangar. 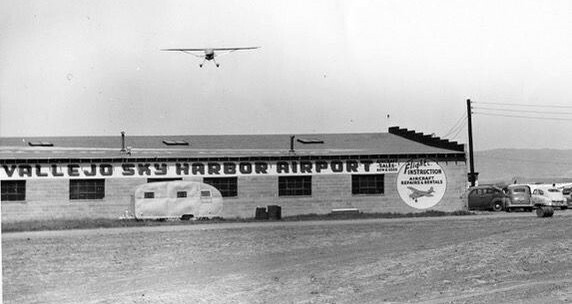 A circa late 1940s photo of a plane overflying a hangar marked “Vallejo Sky Harbor Airport” (courtesy of Dann Shively). 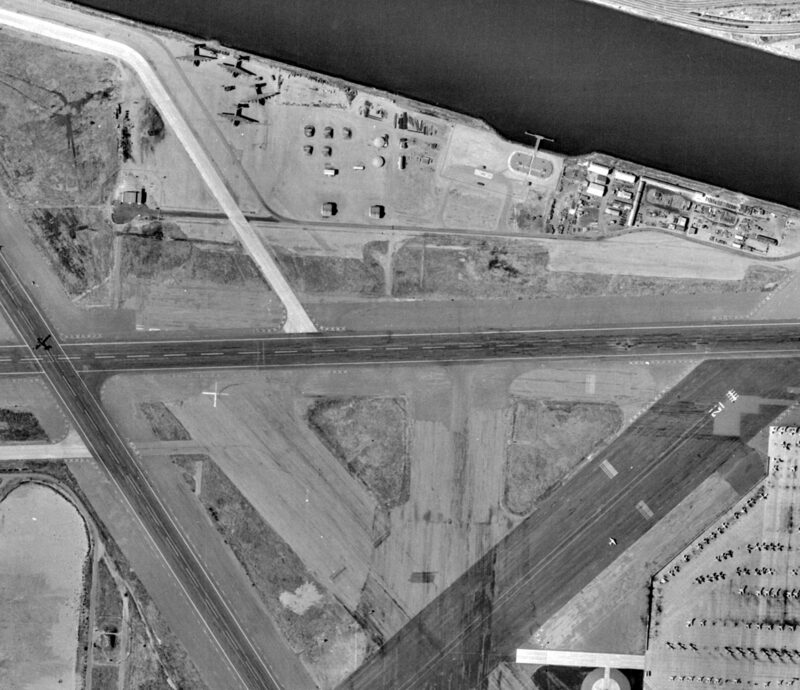 The last photo which has been located of Vallejo Sky Harbor Airport was a 3/3/48 USGS aerial view. Over a dozen single-engine aircraft a few small buildings were visible on the east side. which depicted the field as having a total of four 1,800' runways or taxiways. 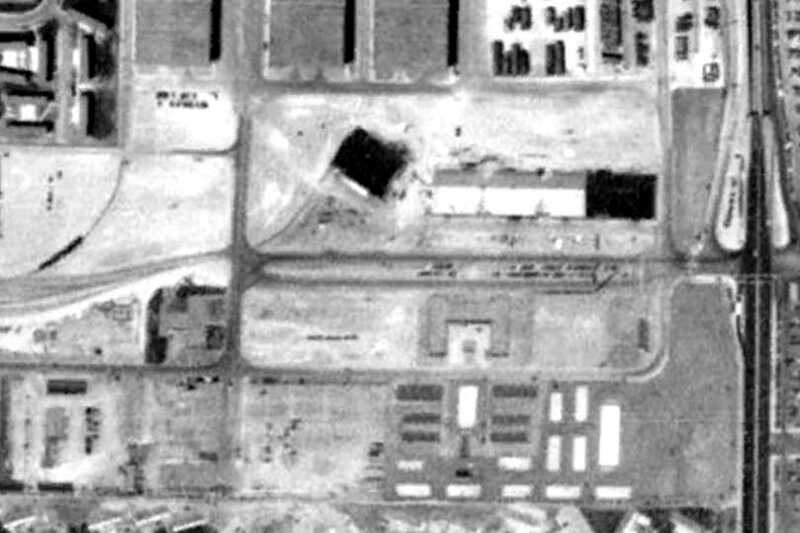 Two buildings or hangars appear to have been located east of the runway intersection. A propeller decal, undated, from Vallejo Sky Harbor Airport (courtesy of Dann Shively). was on the 1949 Sectional Chart (according to Dann Shively). as it was no longer depicted at all on the 1954 Sectional Chart (courtesy of Dann Shively). Dann Shively recalled, "I grew up in Vallejo & have been flying around the area as a broadcast news pilot for nearly 30 years. When I was 11, in 1957, we moved to a house that was within a mile or so of the Sky Harbor Airport site. Of course it was long gone by then & was covered by tract houses built in the 1950s. We've lost a lot of airports!" with traces of 2 different runway configurations still visible on the west, north, and east side of the houses. 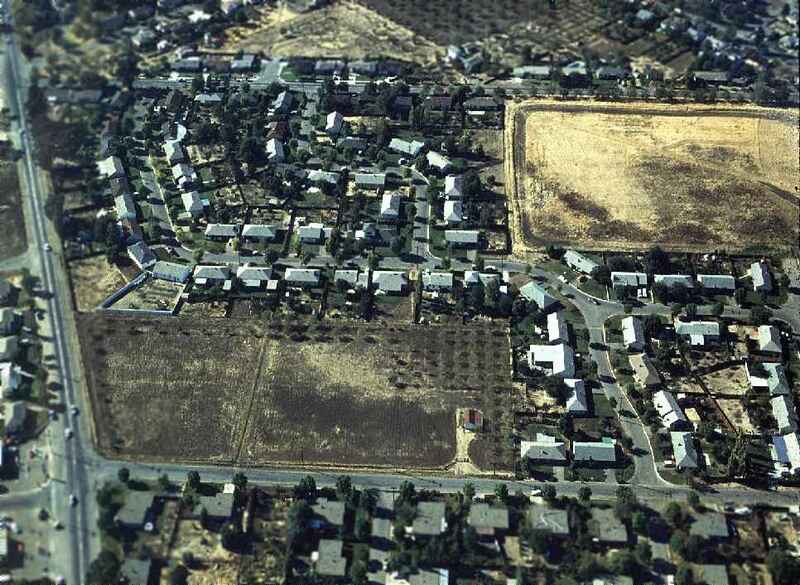 A 1987 aerial photo of the site showed that it had been completely covered by houses. 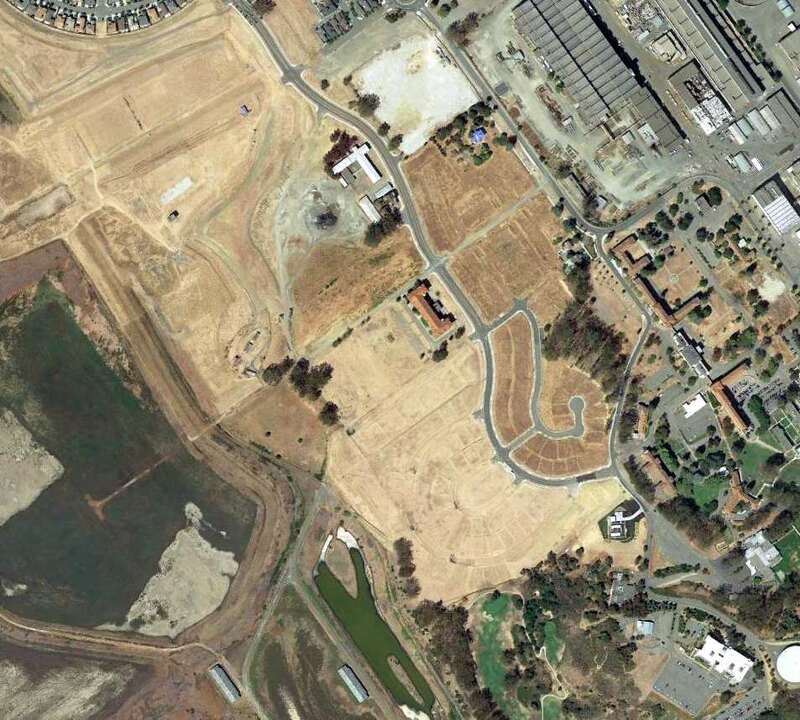 A 2016 aerial view showed the site of Vallejo Sky Harbor had been completely covered by houses, with not a trace remaining of the little airport. According to Dann Shively, the site of Vallejo Sky Harbor is located northwest of the intersection of Route 29 & Mini Drive. Sherman Field, as depicted on the September 1942 Sacramento Sectional Chart (courtesy of Ron Plante). was purchased by Chester Dickson in 1941. The initial airfield consisted of a 2,150' dirt runway. The field was named for Dr. Samuel Sherman, who helped finance the field. 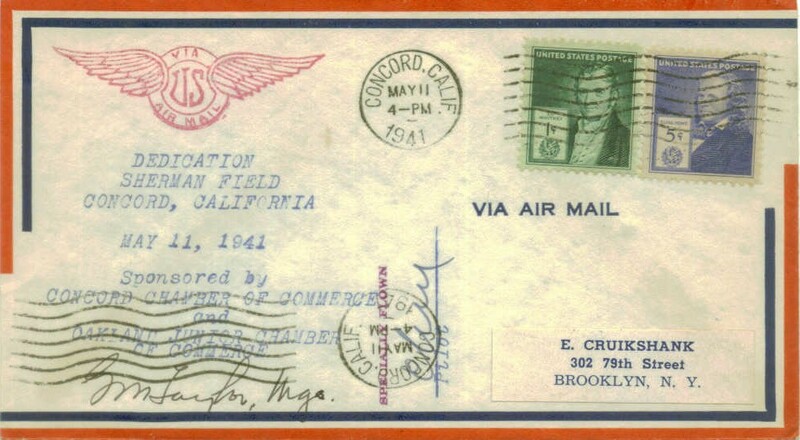 A postmark commemorated the 5/11/41 Dedication of Sherman Field. A collection of photographs has a picture of Sherman Field from 1941.
with 2 Stinson Reliants & a Waco VKS-7. which depicted Sherman Field as a commercial/municipal airport. 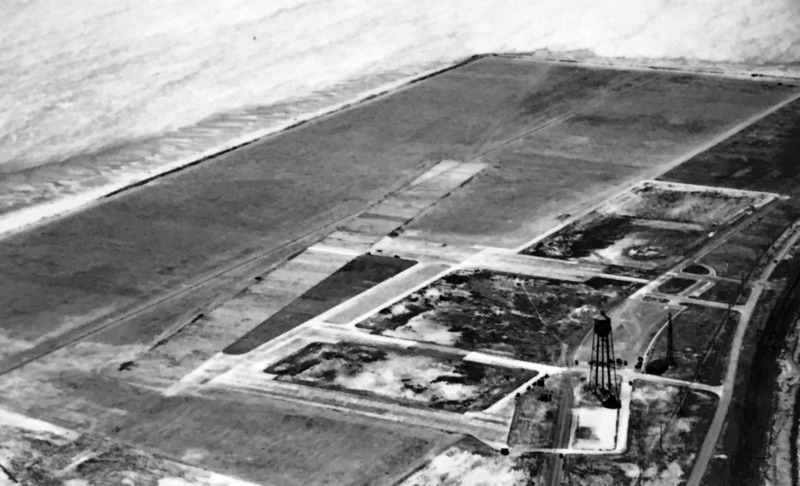 The earliest photo which is available of Sherman Field was a 8/5/43 aerial view looking north from the 1945 AAF Airfield Directory (courtesy of Scott Murdock). It depicted Sherman Field as having a single northeast/southwest unpaved runway, with 2 hangars along the southwest side. 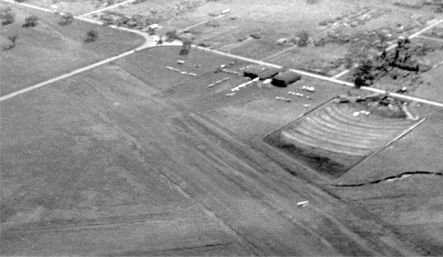 The use of Sherman Field by PAA for navigation & instrument flight training ended in 1944.
with 2 hangars & several aircraft on the southwest side of the field. What were the 6 circular items located in the grass in between the runways? and a ramp at the southwest corner with 2 hangars. to qualify for my civil ticket after discharge from USAF in 1947." (courtesy of Bill Larkins, who lives adjacent to the site of the airport). depicted Sherman as having a 2,800' unpaved runway. A 1949 aerial view showed that a drive-in movie theater had been squeezed in just to the west of the runway intersection. a dozen planes parked near the hangars, and one plane at the runway intersection. of Sherman Field was on the 1949 Sacramento Sectional Chart (courtesy of Kevin Walsh). It depicted Sherman as having a 2,600' unpaved runway. Sherman Field was still depicted on the 1949 USGS topo map. The guide described Sherman Field as having 2 runways: 3,000' Runway 10/28 & 2,800' Runway 18/36. It listed the manager as Phillip McManamy. Sherman Field was sold in 1950 for real estate development. as a March 1952 Thomas Brothers map (courtesy of Kevin Walsh) showed a grid of new residential streets had been covered the site. including one named Sherman Drive. and houses covered most of the property of Sherman Field. as it would eventually form the alignment for the 680 Freeway which would pass through the site in a few years. erasing any trace of the former Sherman Field. and not a trace of Sherman Field appears to remain. 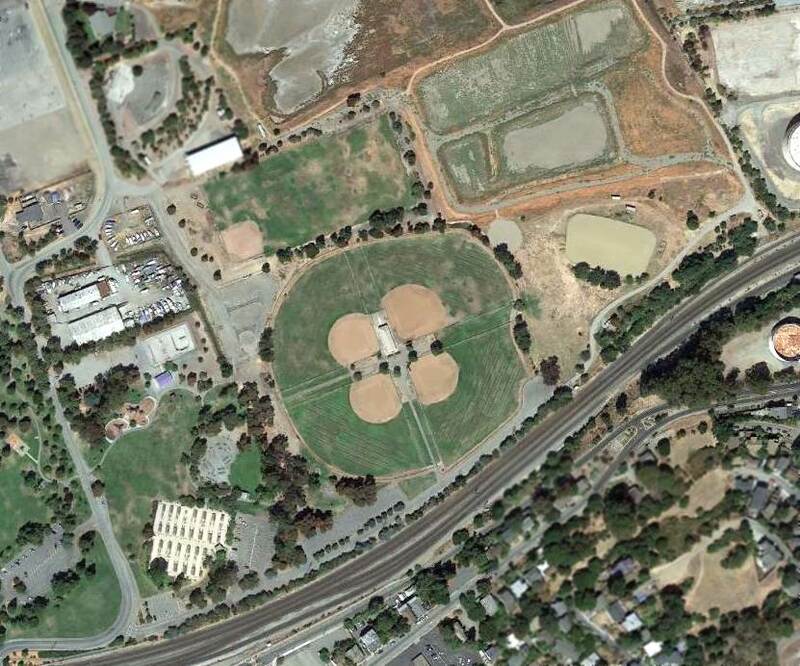 Sherman Field was located northeast of the intersection of Contra Costa Boulevard & Monument Boulevard. An undated aerial view looking south at the original Concord Airport by A.W. Stevens, from a 1926 magazine article (courtesy of Neil Hinckley). 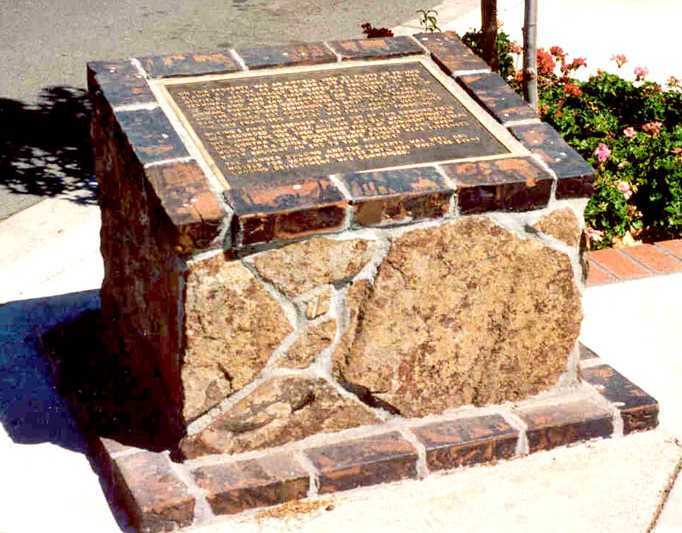 The caption read, “This is the main western terminus of the transcontinental Air Mail line. Eastbound mail leaves from this field. unless prevented from landing there by bay fog. The original airport for the town of Concord was located on the east side of the town. the airport was dedicated as the “Diablo Air Mail Terminal” on 2/7/1925. Concord was declared by the U.S. Postal Service to be the West Coast terminus for cross-country airmail flights. that was carried back & forth from San Francisco & Oakland on trains. in a story describing the new airmail service. Two 1926 photos of the new hangar at Concord Airport, when the Air Mail terminal was transferred from Crissy Field (courtesy of Kevin Walsh). 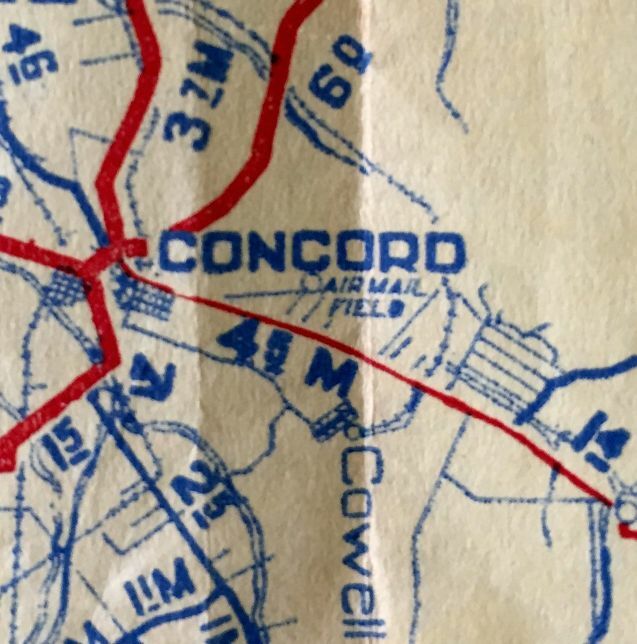 The Concord “Air Mail Field”, as depicted on the March 1928 CA State Automobile Association map (courtesy of Kevin Walsh). from the 7/19/26 Department of Commerce Aeronautical Bulletin (courtesy of Jonathan Westerling). It described the field as measuring 2,000' northeast/southwest by 2,000' northwest/southeast, with Air Mail hangars on the northwest side of the field. 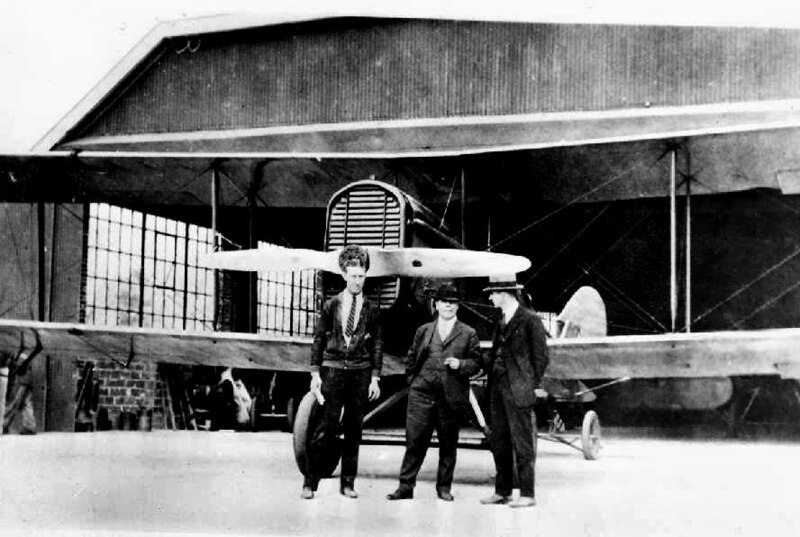 A circa 1920s photo (courtesy of Bill Larkins) of 3 unidentified men in front of a DH-4 & a hangar at the original Concord Airport. described Concord Airport as a “permanent” field, located 2 miles southeast of the city. It was said to consist o a 2,600' x 2,200' field, which permitted landings in any direction. Hangars were said to be located at the northeast corner. when new airmail contractor Boeing Air Transport moved the terminus to San Francisco. But even then Concord still saw some airmail use, as the San Francisco Airport was frequently fogged-in. As private companies were taking over the airmail service, it was possible for the same planes to begin carrying passengers. 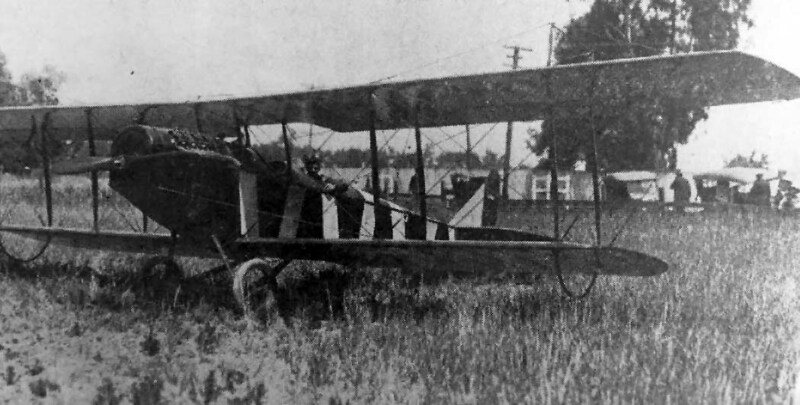 Boeing's 1st passenger flight out of Concord was recorded on 7/1/27 in a local newspaper. was on the 1929 Rand McNally Air Trails Map (courtesy of Chris Kennedy). It depicted an intermediate field just southeast of Concord. It was said to consist of an 80-acre earthen field, measuring 2,200' square, with 2 hangars on the northwest side. Clothidle Larkin recalled that the field was rededicated in the early 1930s. as the Department of Commerce's Intermediate Field Site 2A, along the San Francisco – Salt Lake City Airway. 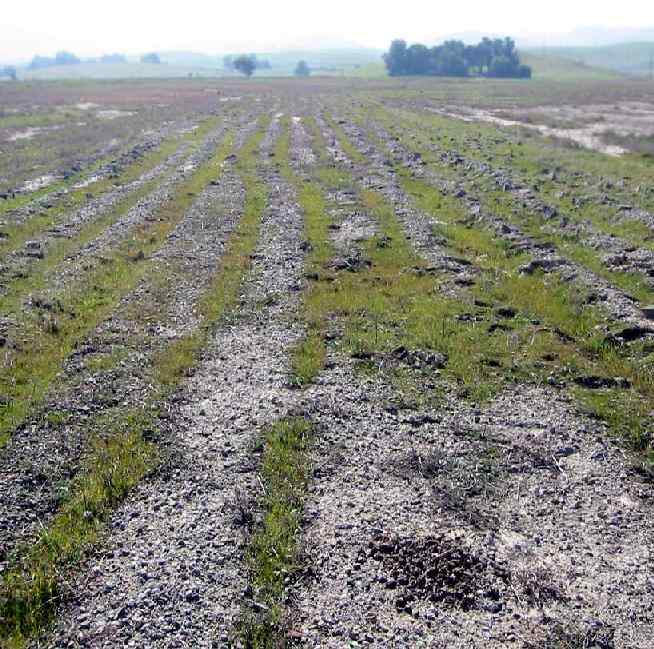 The field was said to consist of an 81-acre black loam field, along with hangars. 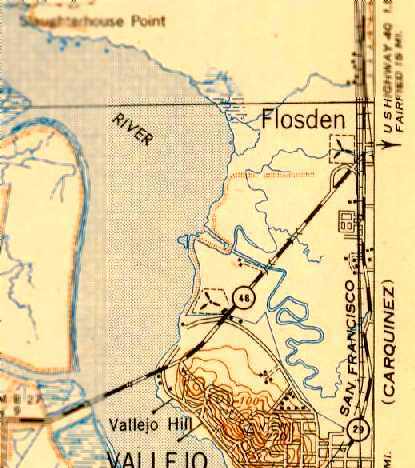 The 1933 San Francisco Airway Map (courtesy of Chris Kennedy) depicted Concord as Site 2A. or in The Airport Directory Company's 1937 Airport Directory (courtesy of Bob Rambo). However, the field was still being used in the “late 1930s”, according to Phil Cox, a charter member of the Concord Flying Club. in front of a Boeing 40A & a hangar at the original Concord Airport. Nick Lines recalled, “I attended Clayton Valley Elementary School in the late 1950s located on the Southeast border of the airfield. or on the 1942 USGS topo map. when the Sheriff removed the propeller from the Concord Flying Club's plane (due to wartime security concerns). The aircraft was stored in a barn for the next 4 years. 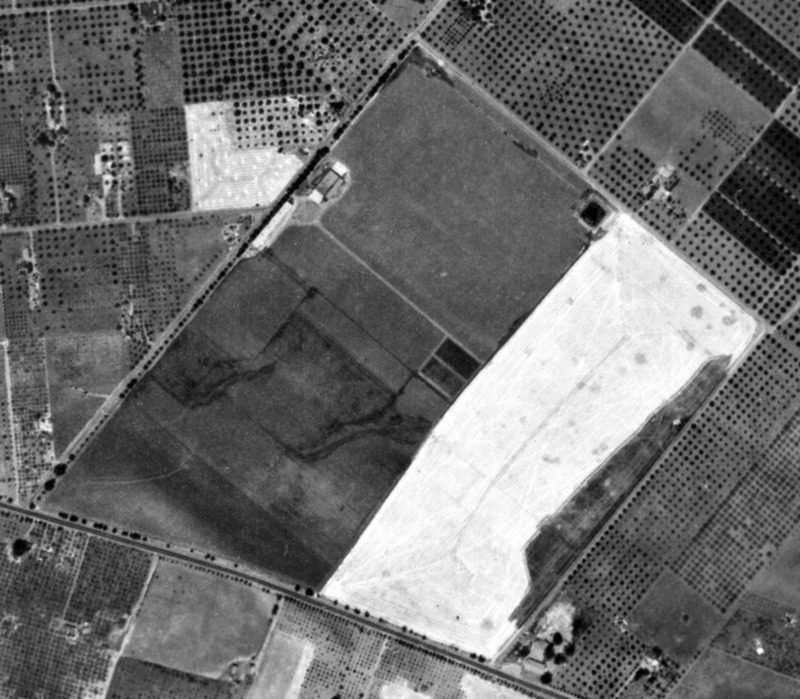 In a 1946 aerial view of Concord Airport the field was still clear, but there was no obvious indication if it was still operational as an airfield. The hangar was visible along the northwest side of the field. 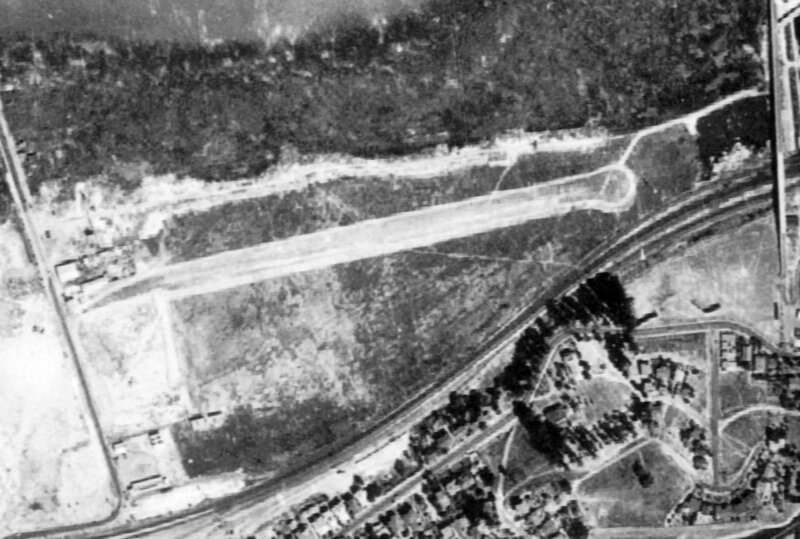 A 1949 aerial view showed the site unchanged from as seen in 1946, with the airfield remaining completely clear. Phil Beutel recalled, “I purchased Niagra Duplicator in 1950. The lease on the hangar came with the business & the owner was a Mr. Nulty. Neil Hinckley recalled, “Our (1950) housing development, 'Concord Village', was built over” the site of the airfield. 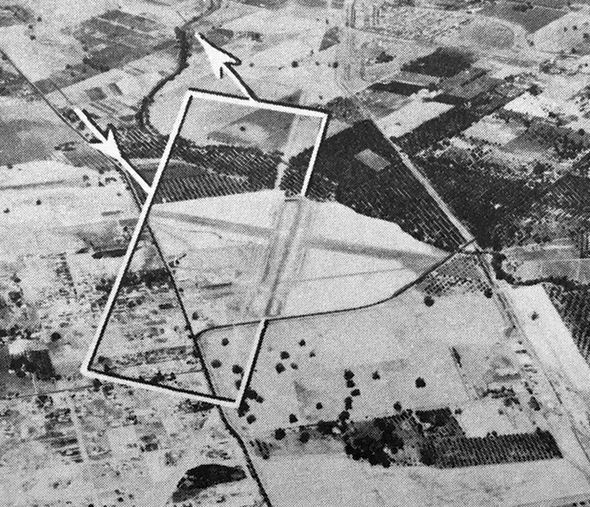 A 1958 aerial view showed that housing had covered about half of the site of the Concord airfield. 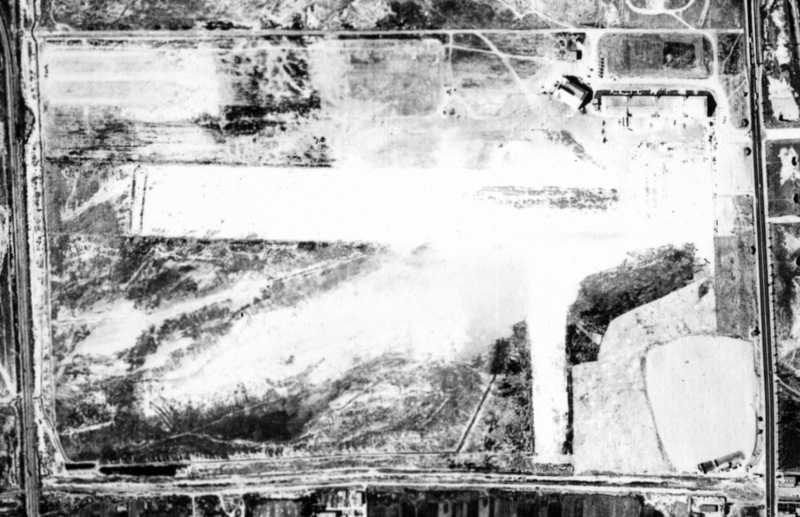 A February 1962 aerial view by Neil Hinckley looking northwest at the remains of the Concord Airfield. 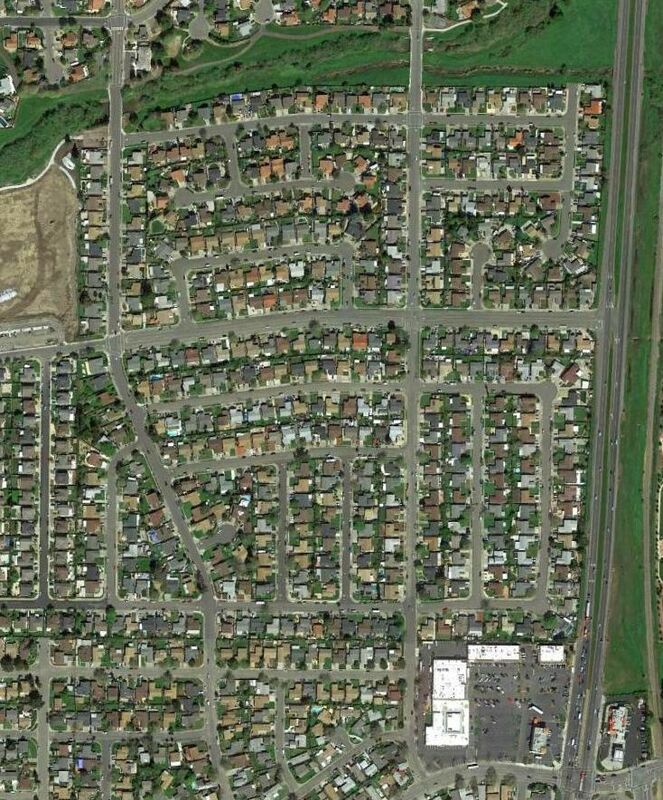 the encroachment of suburban housing units is almost complete. with the exception of the former hangar, which remained standing along the northwest side of the field. 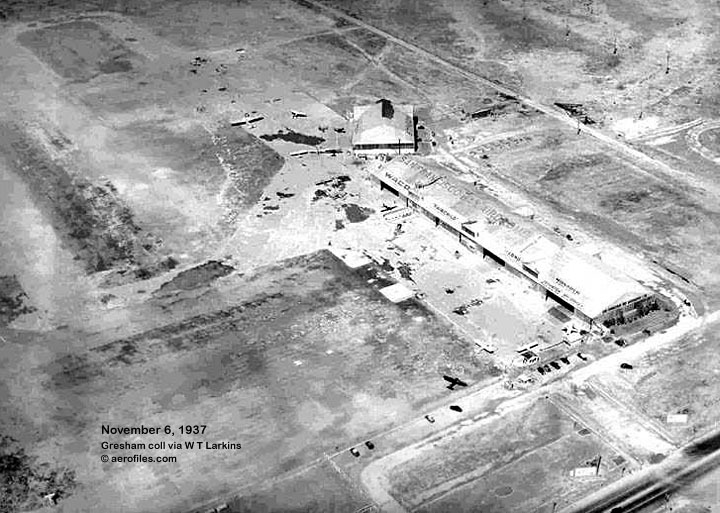 A 1979 aerial view showed the former Concord hangar was still standing. from a circa January 1986 article in the Concord Gazzette (courtesy of Phil Beutel). and was also used as a warehouse. However, it had fallen into disuse, and was the subject of complaints from neighbors. which was across the street from the hangar [of] the original airport of Concord. It was indeed dilapidated but was the home of 'California Battery X-Change' as indicated by a hand-painted sign. It the focus of much curiosity. At that time, there was still maybe 5 or 10 acres of undeveloped land behind it. and a 1993 aerial view showed that more houses had been built on the location. and not a trace appears to remain of the old airfield. A pre-2009 photo by Bill Larkins of the historical marker commemorating the original Concord Airport. on the east by Denkinger Road, and on the south by Clayton Road. A 1943 photo by Bill Larkins of a Grumman F6F Hellcat at OLF Concord. This military airfield was located on the southern edge of the Concord Naval Weapons Station. 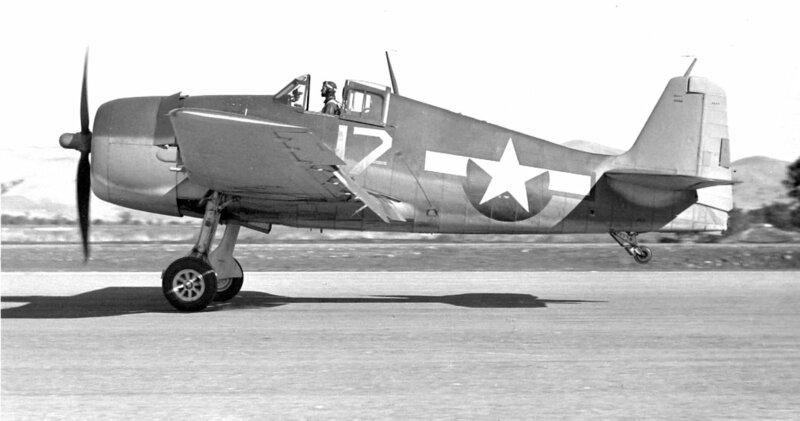 The earliest depiction which has been located of the NWS Concord Airfield was a 1943 photo by Bill Larkins of a Grumman F6F Hellcat. Bill recalled, "This F6F (BuNo 40198) was there one day in October 1943 when I was home on leave & hung out in the weeds with my Graflex. Other planes there that day were a Cessna JRC-1, North American SNJ-4, Beech SNB-1, Beech SNB-2C, Douglas SBD-5 & a Grumman F4F-3. Alameda operated the Outlying Field Concord for practice takeoffs & landings." A 1944 USN aerial view looking southwest at OLF Concord (courtesy of Bill Larkins). depicted the Concord Navy Airfield as an auxiliary airfield. as a 300 acre irregularly-shaped property having 2 asphalt runways, the longest being the 4,000' north/south strip. 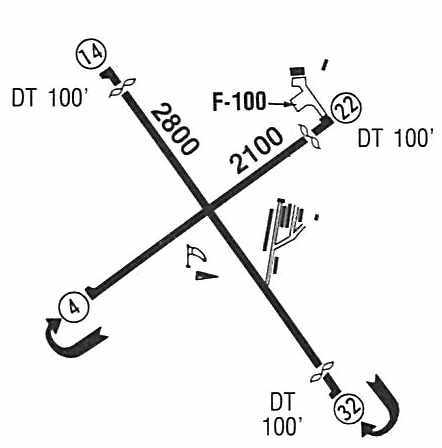 but its depiction on the chart had been downgraded to that of an auxiliary airfield. with a paved ramp on the southeast side. There were no buildings or aircraft visible on the field. It depicted “Concord” as having 2 paved runways, with the longest being 4,000'. so it is possible that it may have been (briefly) relinquished for civilian use. 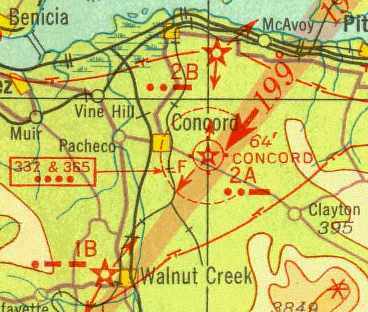 as it was no longer depicted as an active airfield on the 1949 Sectional Chart. and the north/south runway was being used for storage of trailers. but were being used for some type of non-aviation storage. but with the runways being used to store unidentified objects. which presumably means it was no longer an active airfield at that point. The Concord airfield was depicted as having 2 paved runways (the largest was 3,300' long), taxiways, and a ramp. A 1988 USGS aerial view looking north showed the majority of Concord NWS's runways & parking ramp still remained intact. with a residential development having been built at some point between 1988-93 over the northern portion of the former north/south runway. The Concord Naval Weapons Station itself was placed in a "reduced operation status" in 1999. The station is presently surrounded by dense residential development. A 2003 photo by Jonathan Westerling looking east along a remaining runway of the former Concord NWS airfield. 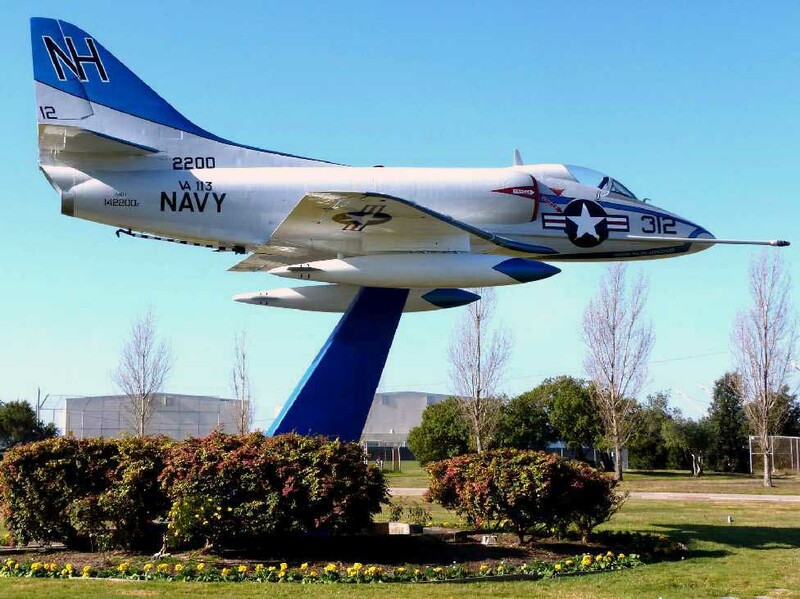 Jonathan reported, "The trees at the ends of the runways at the Concord Naval Weapons Station have grown to well over 35' high. 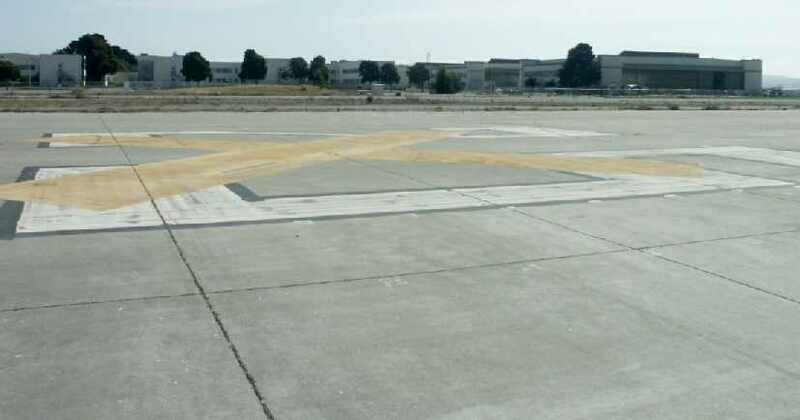 and fresh yellow X's have been painted on the asphalt runways. The east/west runway is in better condition than the north/south runway which is mostly overgrown. Near the runway intersection, a Naval housing complex 'Victory Village' was constructed, though the buildings are almost completely empty. No other present day reuse of the airfield is evident, though the property is completely fenced off. The runways can be easily seen from East Olivera Road." A 2003 photo by Jonathan Westerling looking south along a remaining runway of the former Concord NWS airfield. according to an Associated Press article by Michelle Locke (courtesy of Jonathan Westerling). the Concord Mayor is trying to clear the way for 13,500 new homes, planned for the property of the Navy base. due to concerns about low-level radiation contamination on other parts of the former Navy facility. A 4/2/18 aerial photo looking north showed the majority of the NWS Concord Airfield remained intact though deteriorated. A 6/23/18 aerial view by Roger Cain showed portions of the NWS Concord runways & ramps remained intact. A 6/19/30 aerial view looking northwest at the San Francisco Bay Airdrome (courtesy of aerofiles.com). the University of California received 458 acres of partially filled marshland on both sides of Webster Street. the UC Regents began construction of an airport. 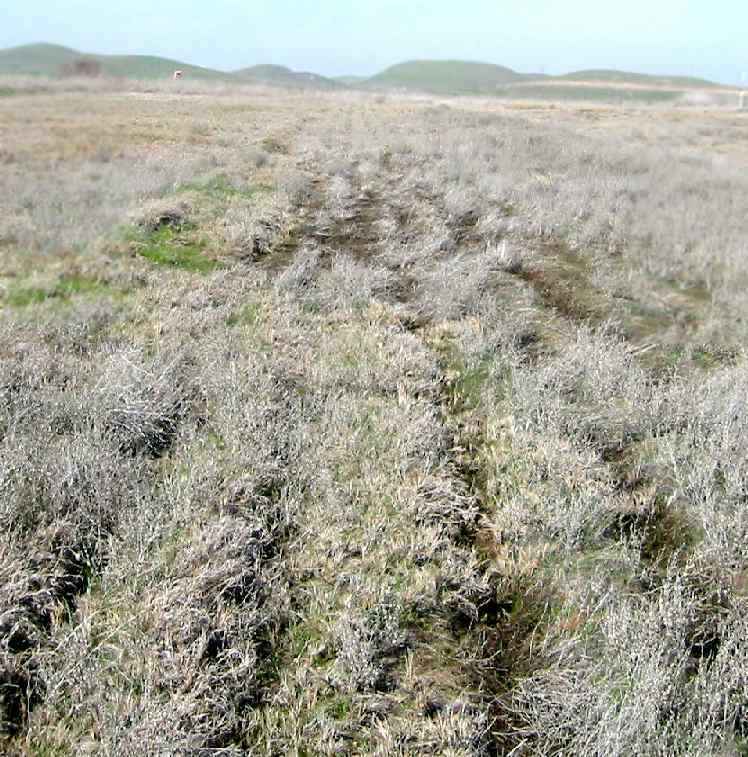 The marsh was drained by a network of ditches from which water was pumped. and the airdrome's business was housed in a single 53,000-square-foot hangar, constructed for $150,000. An undated photo of a large gathering in front of the San Francisco Bay Aerodrome hangar, possibly for its 1930 dedication. 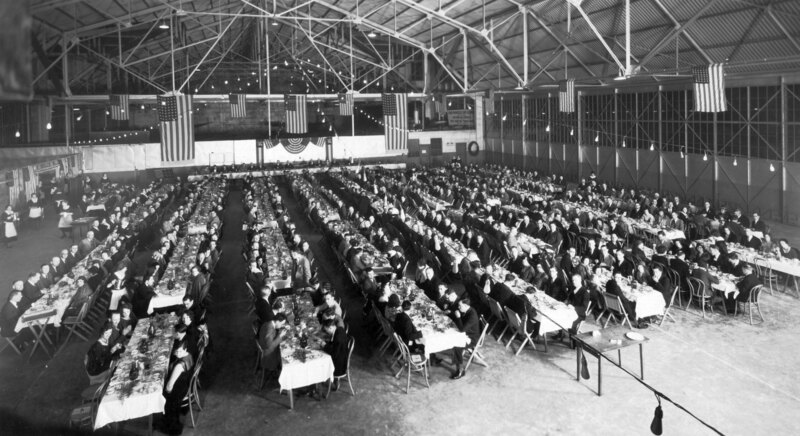 An undated photo of a large gathering inside the San Francisco Bay Aerodrome hangar, possibly for its 8/16/30 dedication. 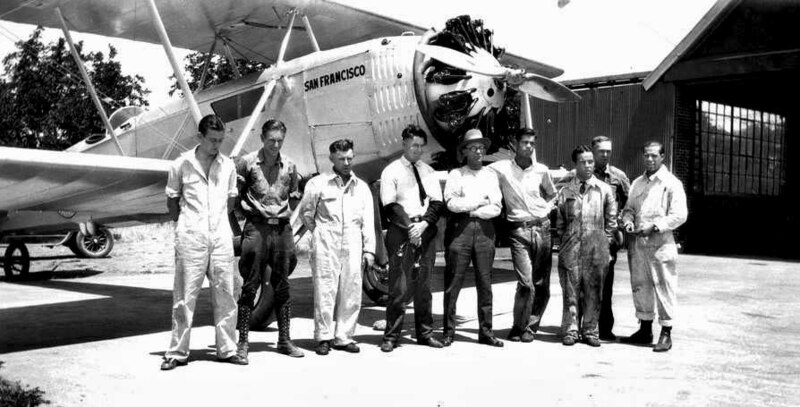 The San Francisco Bay Airdrome had its gala christening party on 8/16/30. Western Air Express, the transbay Air Ferries, and Boeing's Pacific Air Transport. described San Francisco Bay Airdrome as having 2 shell runways, with the longest being a 3,400' east/west strip. A 3,600' northeast/southwest runway was listed as being under construction, to be ready in 1931. San Francisco Bay Airdrome's success during 1930-31 led to a 160' addition to the original hangar & the first 160' of another one. Three more hangars were soon added, actually attached to the first, then a 5th one, separate & canted at an outward angle. was on a February 1931 CA State Automobile Association map (courtesy of Kevin Walsh). It also depicted the nearby Alameda Airport to the west. 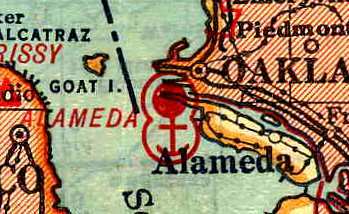 although the adjacent Alameda Airport was depicted to the west. on the 1933 San Francisco Airway Map (courtesy of Chris Kennedy). Note the aircraft in flight over the center of the field. oriented 3,400' east/west & 1,700' north/south. The field featured a "modern steel hangar", fueling, passenger waiting room, and "expert mechanical service". The manager was listed as R.U. St. John. along with the adjacent Army Air Base Benton Field, and Pan American Airways Inc.
with the longest being a 3,600' crushed shell northeast/southwest runway. A blimp anchorage was located on the southwest part of the field. 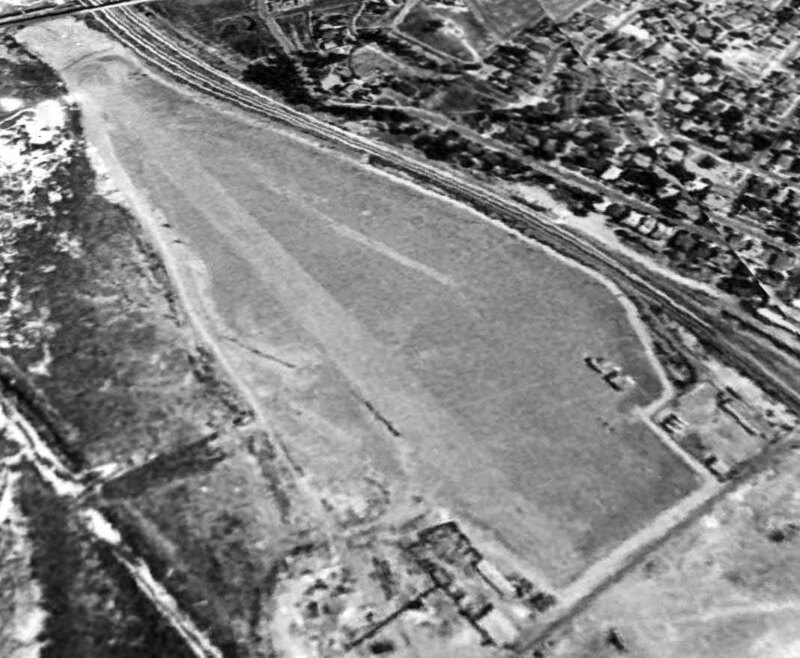 A 1937 aerial view of the San Francisco Bay Airdrome (courtesy of aerofiles.com). and an asphalt takeoff strip on the east/west runway. 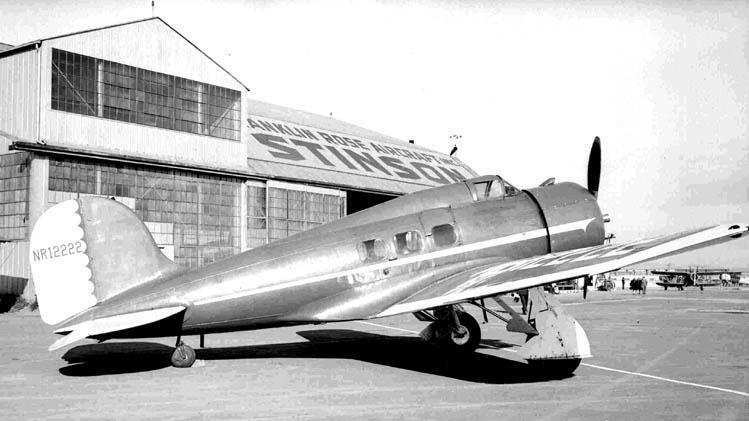 A 1938 photo (courtesy of Bill Larkins) of a Condor Air Lines Consolidated "Fleetster" 20-A in front of the boarding area at SFBA. Condor Air Lines started a route to Monterey with this plane. It's still in it's TWA red colors - it was repainted yellow the next year. An undated (circa 1930s?) photo of 2 monoplanes & a biplane in front of the SFBA hangar. A circa 1930s photo of several monoplanes & a biplane in front of the SFBA hangar. and the airlines soon departed to the San Francisco & Oakland Airports. and the business fleets of Standard, Mohawk, and Richfield oil companies. 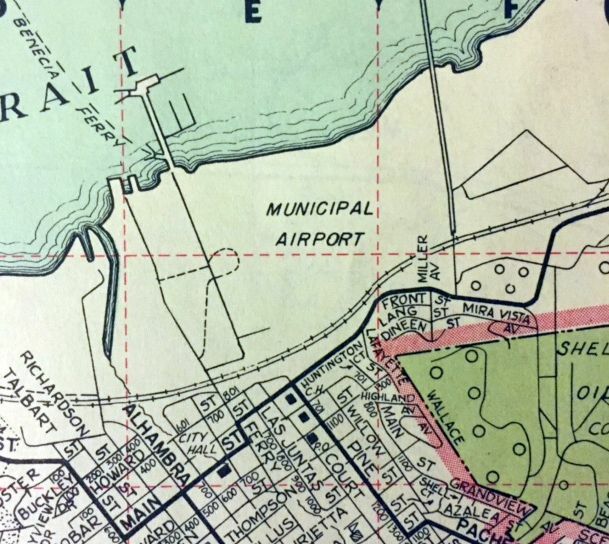 A 1938 street map (courtesy of Kevin Walsh) depicted “Alameda Airport & Seaport”, “Benton Field”, and “San Francisco Bay Airdrome”. A undated photo of Tex Rankin in his Grear Lakes biplane in front of the hangars at SFBA (courtesy of Bill Larkins). Aerial extravaganzas in 1938 & 1939 attracted tens of thousands of locals to their airfield. A program for the 11/4/39 Air Races at the “Bay Airdrome, Alameda”. from Berkeley all the way to Alameda after school let out & on weekends just to be around airplanes." with several light aircraft parked near the hangars on the northeast corner. A 1939 photo by Bill Larkins of Paul Mantz's Lockheed Orion 9-C at San Francisco Bay Airdrome. The last photo which has been located showing aircraft at San Francisco Bay Airdrome was a 1939 photo by Bill Larkins of Aeronca LB NC16561. Bill Larkins recalled, "It had unique hangars & in addition they were different in having advertising painted on the roofs. Sikorsky, Stearman, Stinson, Swallow, Taylor, Taylorcraft, Travel Air, Viking, and Waco. and the “Alameda Airport Inc.” on the west end of the peninsula. Two buildings were depicted along the northeast side of the San Francisco Bay Airdrome. was on the December 1941 San Francisco Sectional Chart (courtesy of Chris Kennedy). 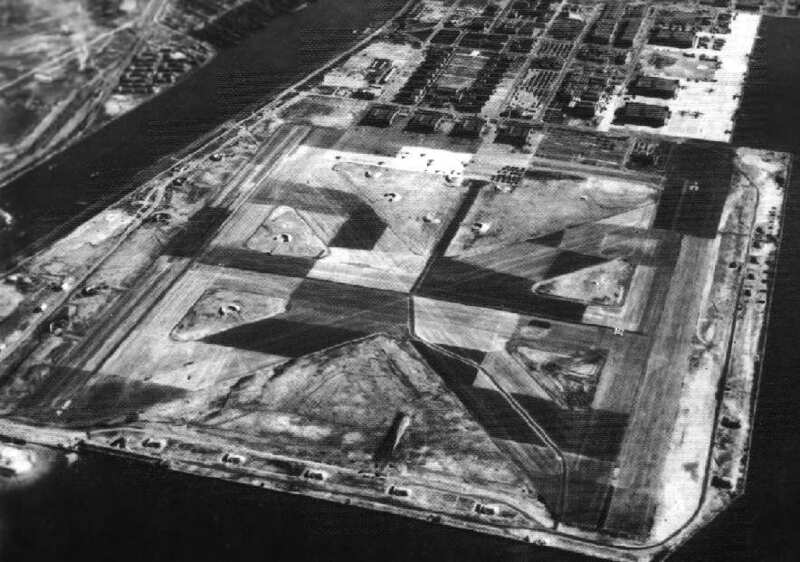 and the naval airfield's significant expansion soon spelled the end for the little civil airport. The Bay Airdrome was closed in 1941 when it was decided that its traffic interfered with operations at NAS Alameda. then ordered the abandonment of the Airdrome. This was omission was apparently due to security concerns during WW2. or the 1946 USGS topo map. but several buildings & parking lots had been constructed over its former airfield area. 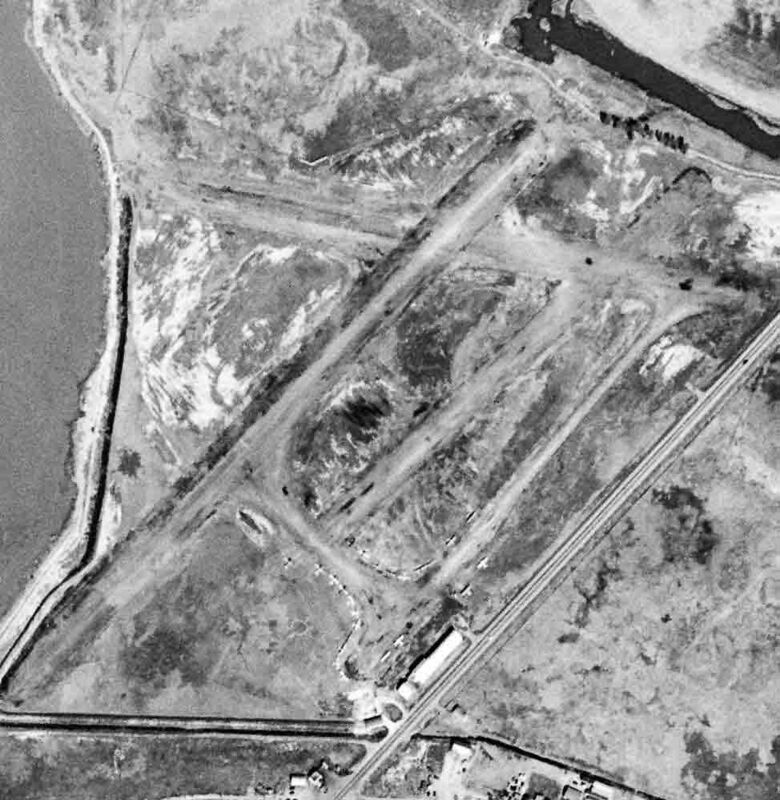 A 1947 aerial view of the site of the San Francisco Bay Airdrome (courtesy of aerofiles.com) showed that the hangars still remained standing. By the time of the 1949 USGS topo map, the open airfield area of the former Airdrome had been filled in with buildings. 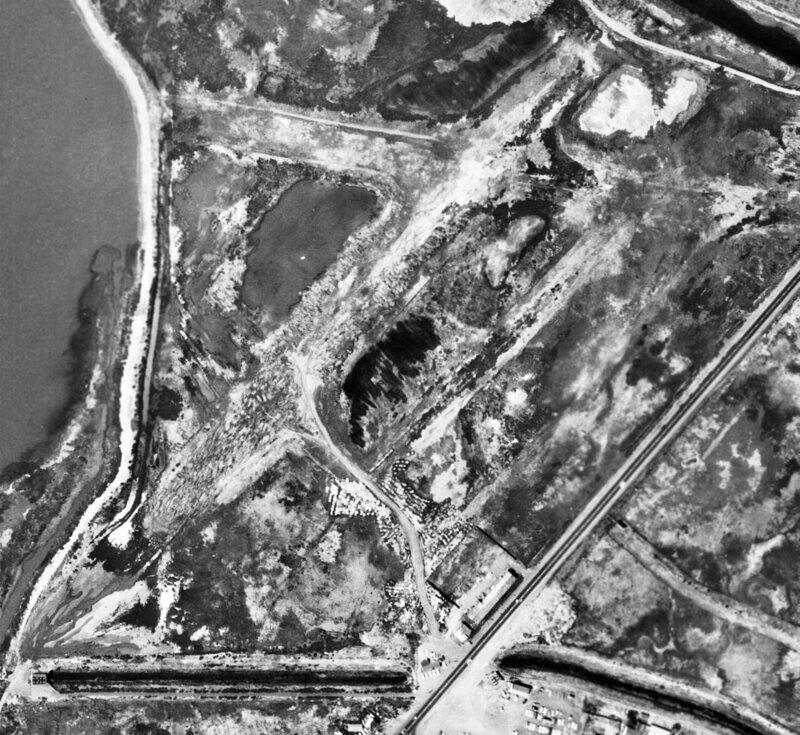 A 1958 aerial view showed that both former hangars from the former San Francisco Bay Airdrome remained standing. but the smaller hangar (on the west) remained standing. 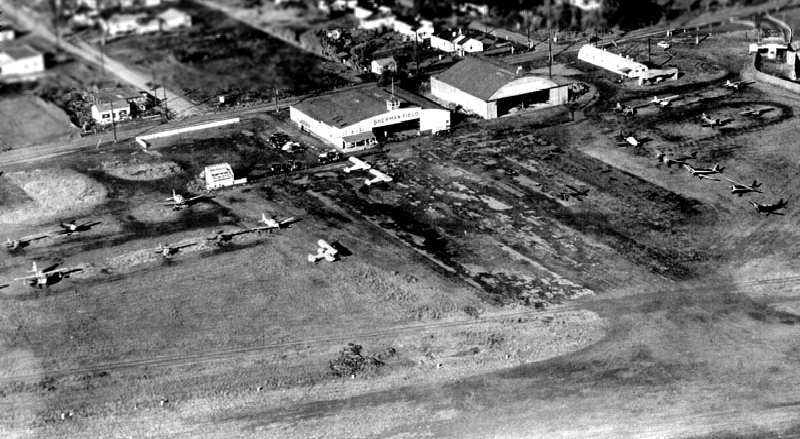 In 1970, the College of Alameda opened on the eastern portion of the former Airdrome property. 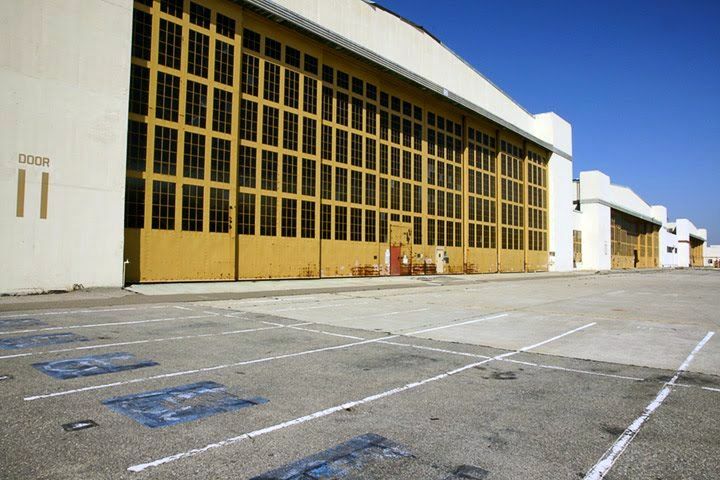 A 1993 photo by Bill Larkins of one of the former hangars of San Francisco Bay Airdrome. 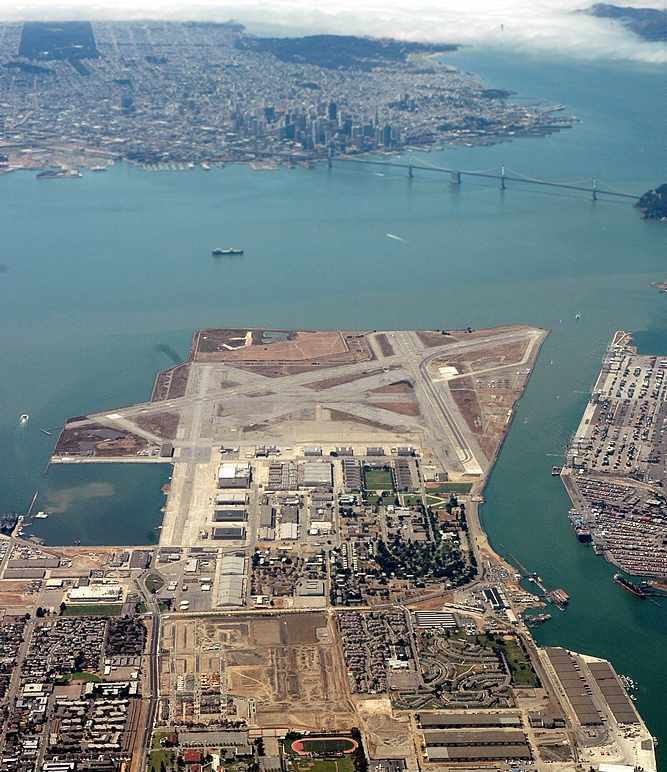 Bill Larkins reported that the former hangars of SFBA still existed as of 2003. "They were moved by the Navy & still belong to them. Most are abandoned but one is being used as a Navy medical supply warehouse." Rick Turner reported in 2003, "I went by today & the 2 hangars that had been moved are gone along with some other ex-Navy warehouses. It looks like some construction will start there soon but I don't know what. The one hangar that was still in it's original position is still there & appears to be being used for some sort of storage." 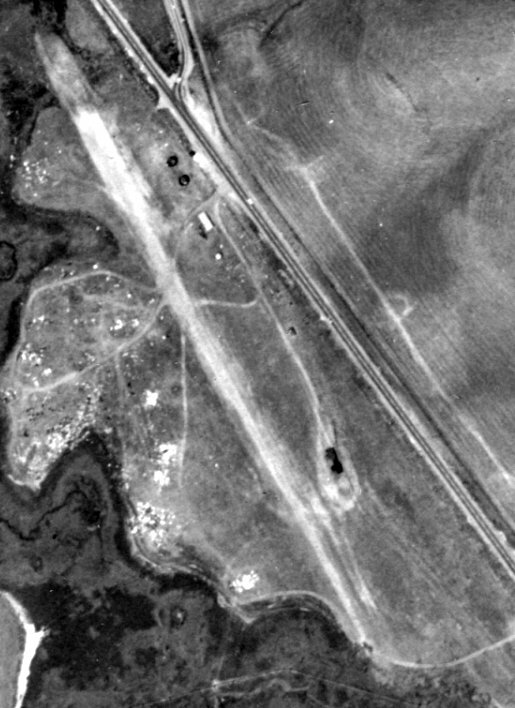 A February 2004 USGS aerial photo of the site of San Francisco Bay Airdrome. 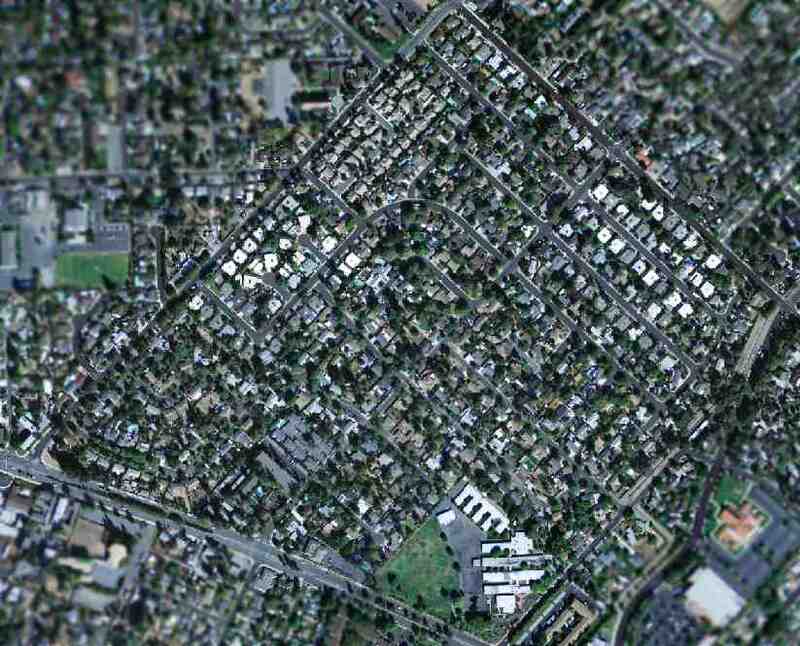 as a 2006 aerial photo showed that it had been replaced by new housing. A 5/11/16 photo by Kevin Walsh of the site of San Francisco Bay Airdrome. The site of San Francisco Bay Airdrome is located northwest of the intersection of Webster Street & Atlantic Avenue. 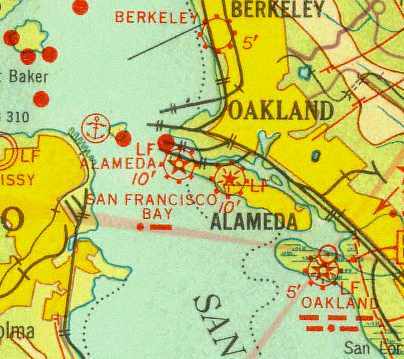 Alameda Airport & Seaplane Base, as depicted on the 1929 "Rand McNally Standard Map of CA With Air Trails" (courtesy of Chris Kennedy). an administration building, and a yacht harbor. described Alameda Airport as being operated by Curtiss Airport, Inc.
along with the comment, "Field to be enlarged to 5,400' x 3,400'." A total of 10 hangars, a repair shop, weather bureau, and a hotel were listed as being along the north side of the field. from the Richfield Oil Company's 1930 California Airports directory (courtesy of Kathy Vaughn). and listed the Manager as Captain W.H. Royle. 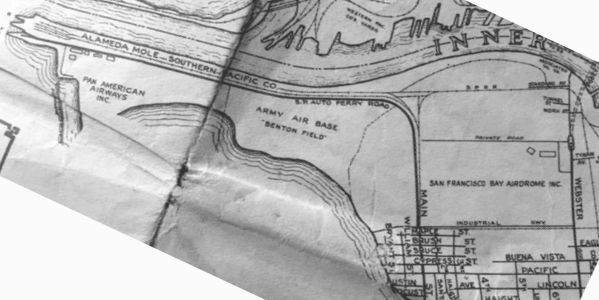 By 1930, the Army had established a 100 acre Benton Field adjacent to the east side of Alameda Airport. 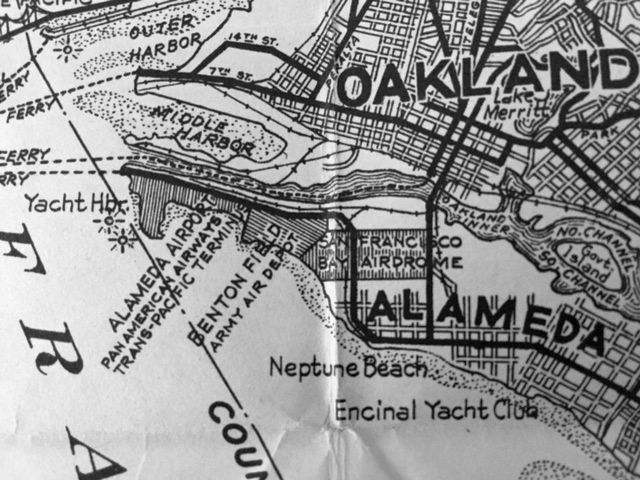 Alameda Airport was depicted on the February 1931 CA State Automobile Association map (courtesy of Kevin Walsh) as occupying a narrow peninsula. It also depicted the nearby San Francisco Bay Airdrome to the east. with the San Francisco skyline at the upper-left (courtesy of Bill Eaton). Bill observed, “Alameda Airport is at lower left along the south side of the Oakland estuary- the dark channel at lower left. Goat Island, later renamed Yerba Buena, is at center & the old Key System streetcar/ferry pier is at far right. No Bay Bridge yet in 1932 so the ferries crowd the bay. 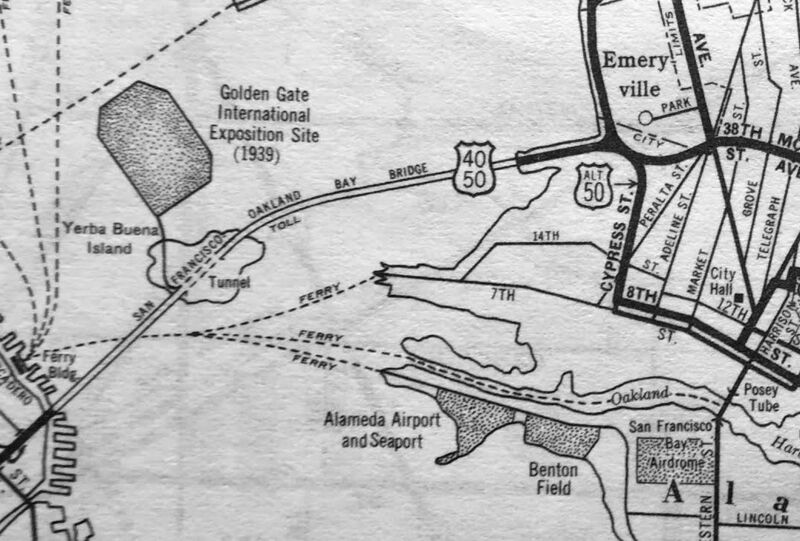 Alameda Airport, as depicted on a pre-1933 Bekins Van & Storage map, by Thomas Brothers Maps (courtesy of Kevin Walsh). An undated (circa 1930s?) photo captioned “Maddux Air Line - Alameda Airport, All steel building by Herrick Iron Works, Oakland” (courtesy of Kevin Walsh). 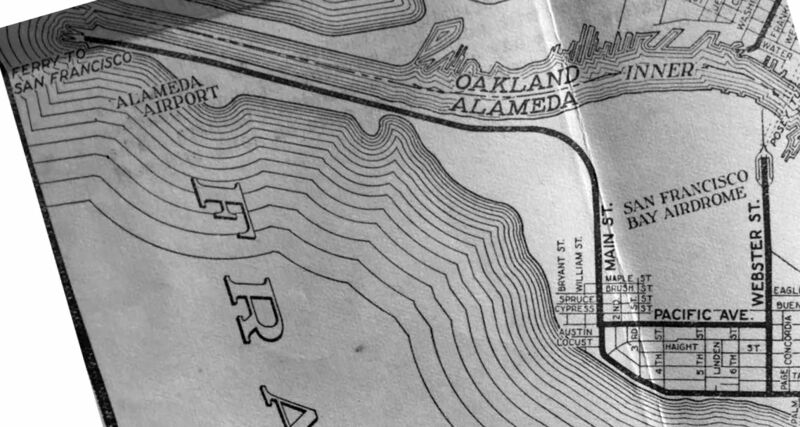 “Alameda” Airport, as depicted on the 1933 San Francisco Airway Map (courtesy of Chris Kennedy). 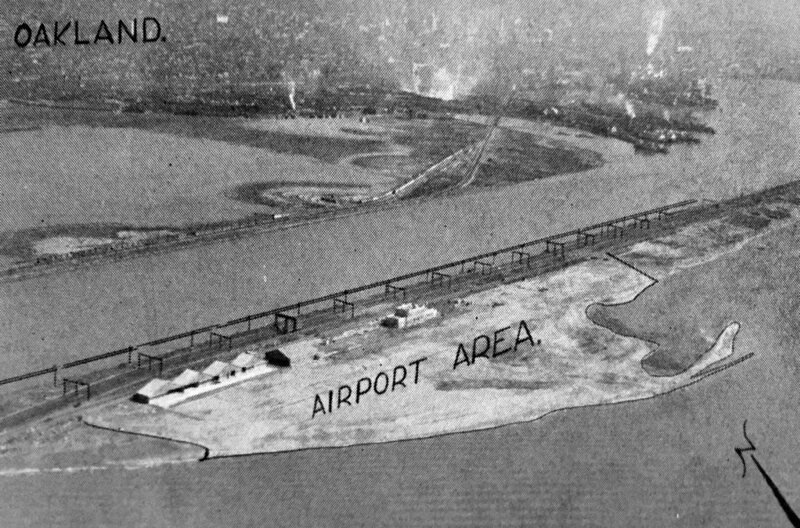 Over the next few years, the City of Alameda continued to expand the area of the airport by filling in land in the bay. and inaugurated flying boat service to Hawaii & the Orient. depicted the facilities of Pan American Airways Inc., along with the adjacent Army Air Base Benton Field, and San Francisco Bay Airdrome. and the Army turned over its facilities at Benton Field to the Navy. 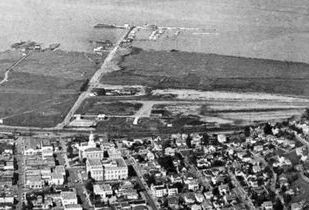 A 1937 photo of Alameda Airport (courtesy of Bill Larkins). 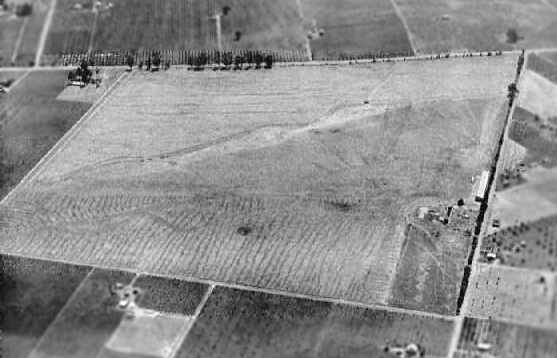 depicted Benton Field as having an unpaved rectangular airfield on the south side of the peninsula. 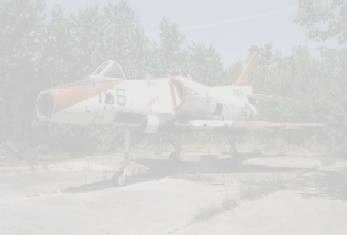 There did not appear to be any hangars or structures, other than a water tower. An undated aerial view looking northeast at Alameda Airport from The Airport Directory Company's 1938 Airports Directory (courtesy of Jonathan Westerling). which also had an asphalt takeoff strip. 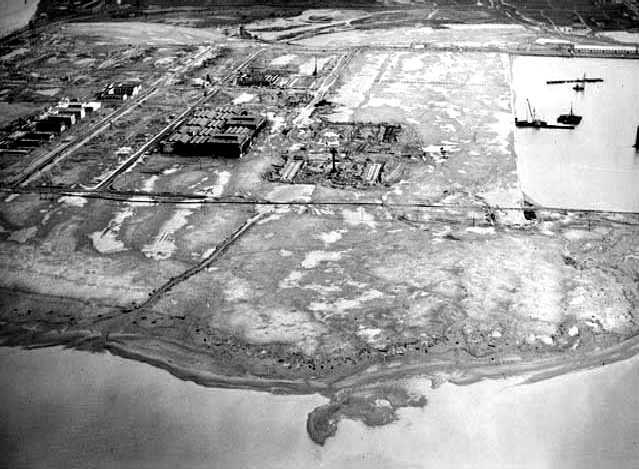 Congress appropriated $10 million for the development of a Naval Air Station at the site in 1938. Pan Am moved its operations to Treasure Island in 1939. 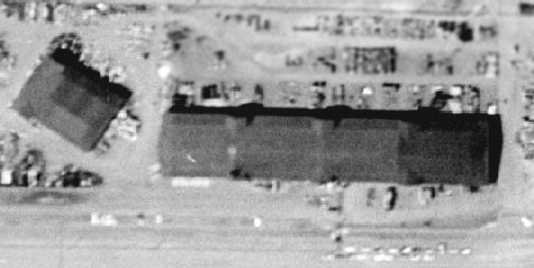 An 8/4/39 USGS aerial view (from the UCSB Library) depicted the hangars of Alameda Airport (at top-left) & the airfield of Benton Field (at bottom-right). and the “San Francisco Bay Airdrome Inc.” to the east. 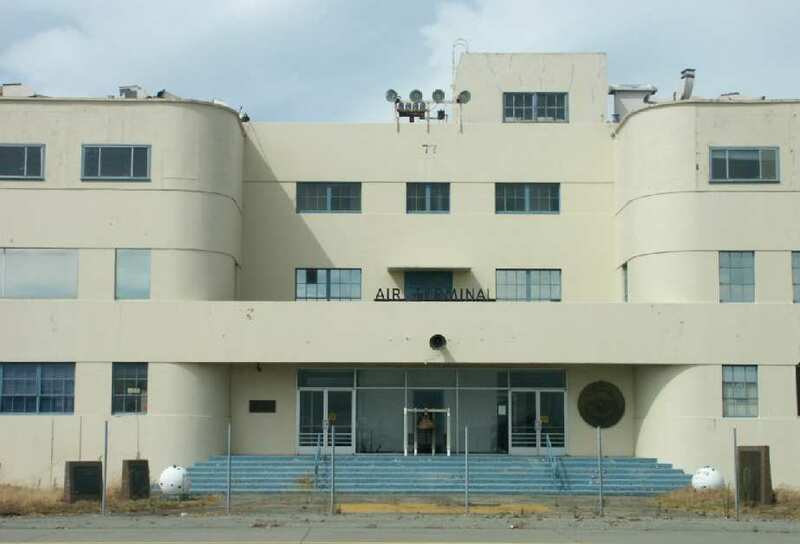 A total of 5 buildings were depicted along the northwest side of the Alameda Airport. 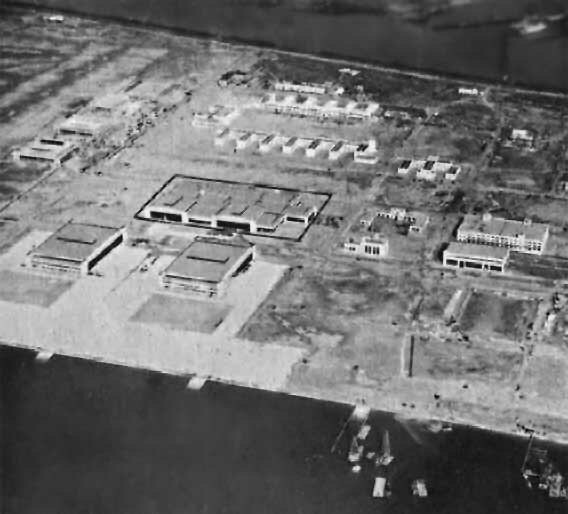 A 1940 aerial view showing NAS Alameda under construction. The new Naval Air Station was commissioned in 1940. 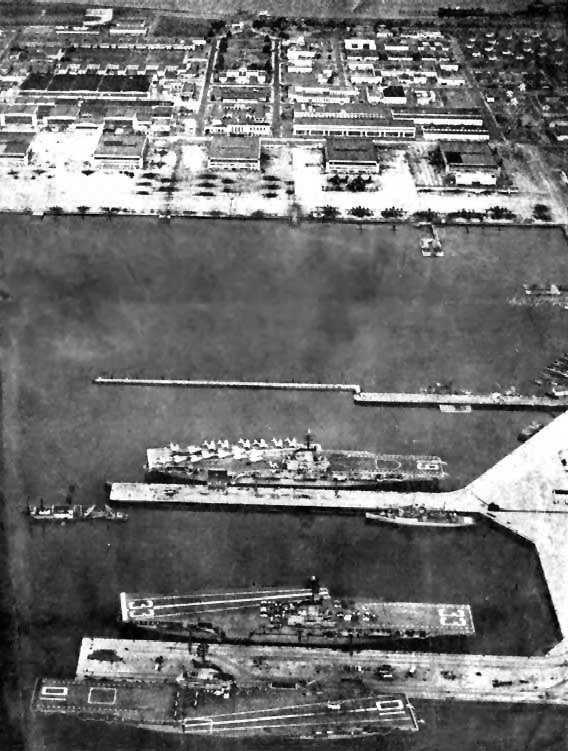 A January 1941 aerial view looking north at the hangars & buildings of NAS Alameda. A 1941 photo of a NAS Alameda hangar under construction (courtesy of John Voss). on the December 1941 San Francisco Sectional Chart (courtesy of Chris Kennedy). showing the disruptive camouflage pattern painted on the runways. 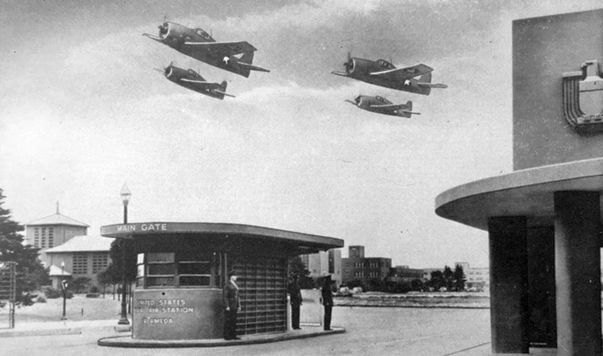 A WW2-era postcard of 4 Grumman F6F Hellcats overflying the NAS Alameda main gate (courtesy of Kevin Walsh). (from the 1965 Open House program, courtesy of Bill Eaton). Numerous PBYs, Consolidated Coronados, Martin Mariners, and C-47s (R4D?) were visible. as well as Grummans, possibly Avengers, on the water side of the ramp. & 2 aircraft carrier piers, with a total of 2,720 acres. 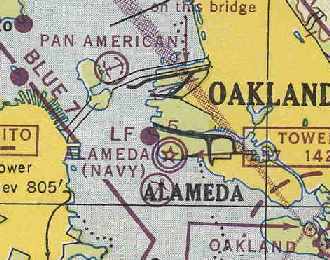 NAS Alameda, as depicted on the March 1945 San Francisco Sectional Chart (courtesy of Chris Kennedy). NOLF Clear Lake (seaplane only), OLF Tulare Lake (seaplane only), and OLF Paso Robles. operating with SOSU-3 approaching NAS Alameda's seaplane ramp. headed north on San Francisco Bay on its way to Hawaii. 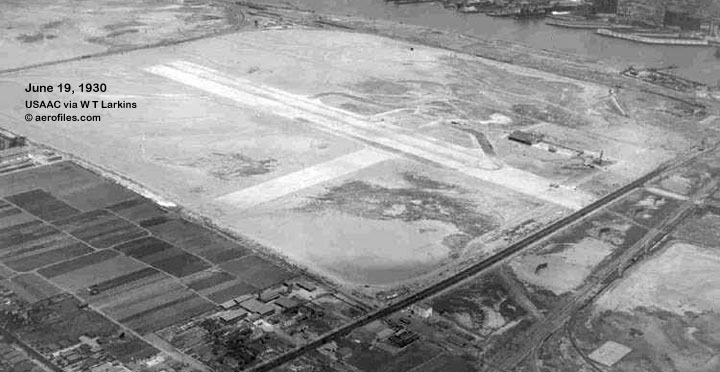 A 1946 aerial view of NAS Alameda, showing the 5 paved runways & large number of hangars. 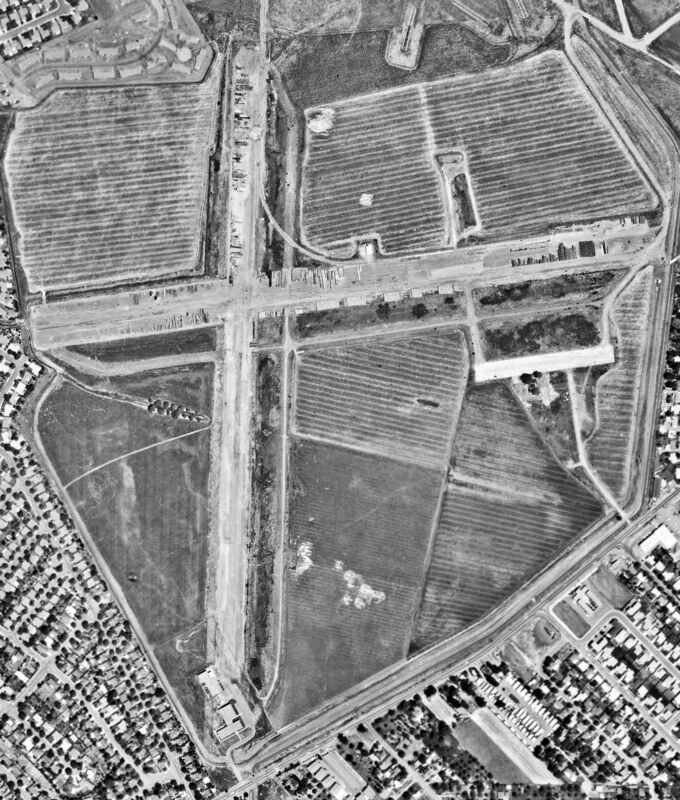 A 1946 aerial view looking south at NAS Alameda (courtesy of Kevin Walsh). A 5/5/47 aerial view by Bill Larkins of an amazing array of over 400 F6F Hellcat fighters on the west side of NAS Alameda awaiting overhauling or scrapping. 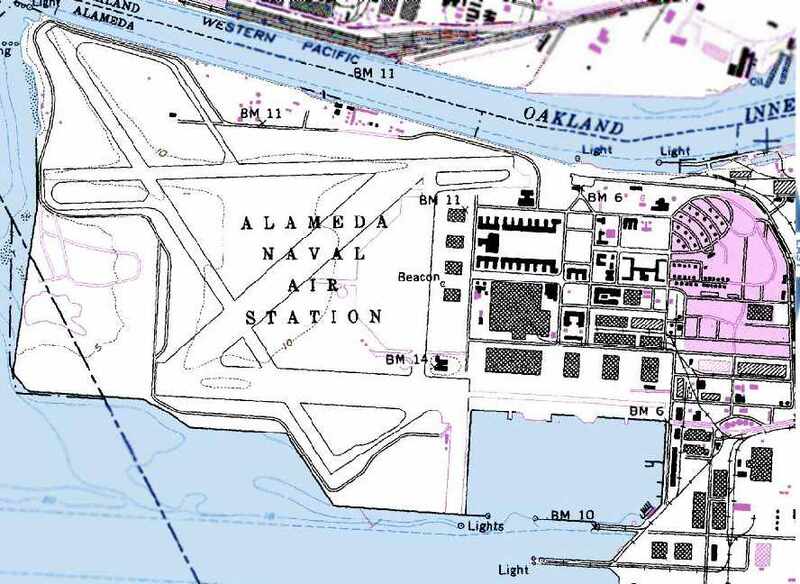 The 1949 USGS topo map (courtesy of Kevin Walsh) depicted Alameda “Naval Reservation” as having 5 runways. Al Brown recalled, "I was stationed at Alameda in 1953-54. I was a crew member on the JRM Mars seaplane. We flew to Hawaii & returned twice a week. Travel time was 16 hours flying at 10,000 feet." A 1955 USN photo of a sporty FJ3 Fury in front of NAS Alameda's Hangar 20 (courtesy of John Voss). Compare to the photo of the same building, 48 years later, several paragraphs below. A circa 1955 photo of a row of Martin P5M-2 Marlin flying boats at NAS Alameda. A 1955 photo of the JRM-1 Marshall Mars on display for civilian visitors at NAS Alameda (courtesy of John Voss). with a F7U-3 Cutlass in the center (courtesy of John Voss). Lanny Giorgi recalled, “I grew up just outside of the NAS Alameda & had the opportunity to go there often in the 1950s, 1960s & 1970s. The carriers used to have air operations while docked & we were right under their final approach. 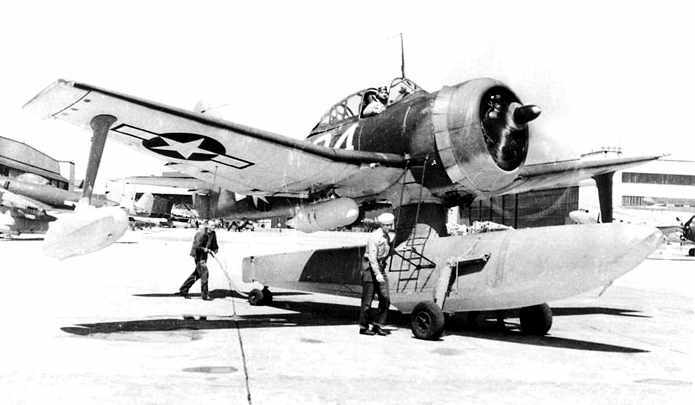 of VR-2 leaving the seaplane docks at Alameda (courtesy of Bill Larkins). (from 11/1/57 issue of The Carrier newspaper). at NAS Alameda after they were retired & put into storage. 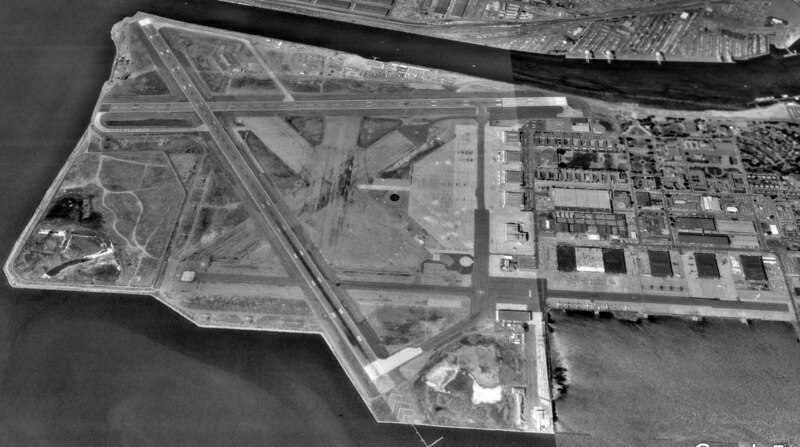 An 8/12/58 USGS aerial view (from the UCSB Library) of the extensive Alameda airfield. and large numbers of supersonic jet aircraft on the ramp at bottom right. 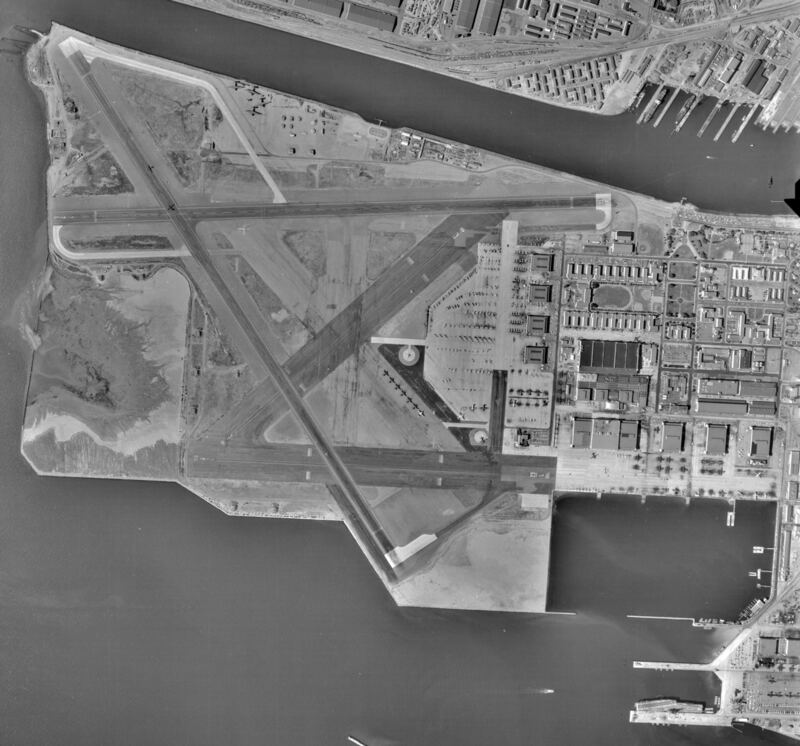 depicted NAS Alameda as having 4 paved runways, with the longest being 8,000'. A July 1963 photo by William Larkins of a Curtiss C-46F, N69346 at NAS Alameda. 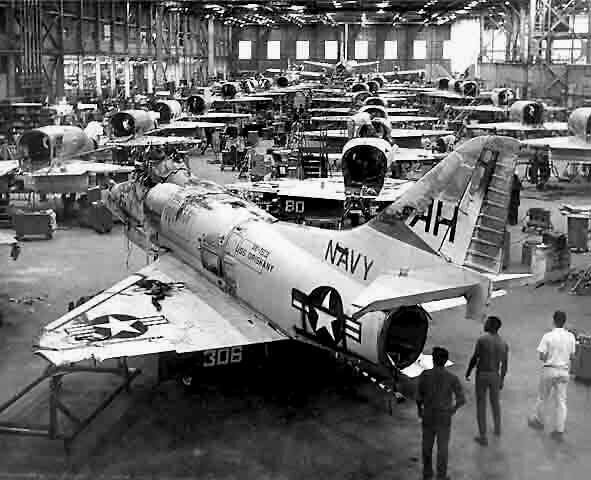 An undated photo of A-4 Skyhawks in the Alameda Naval Air Rework Facility. a depot for various naval aircraft. 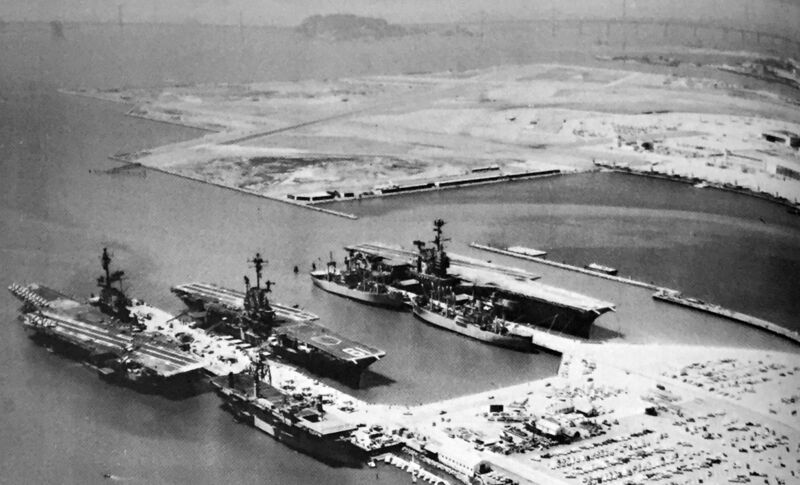 A wide variety of Navy & Marine Corps aircraft units were stationed at Alameda. from a 1973 base directory, with NAS Alameda behind them. with piers large enough to accommodate the largest carriers in the fleet. from a 1973 base directory, with rows of planes on the ramp in the background. A May 1967 photo of an all-black RA-3B Skywarrior on a wet Alameda ramp. A 4/20/68 aerial view of Alameda. with the longest being 8,000'. An undated (circa 1960s-70s?) 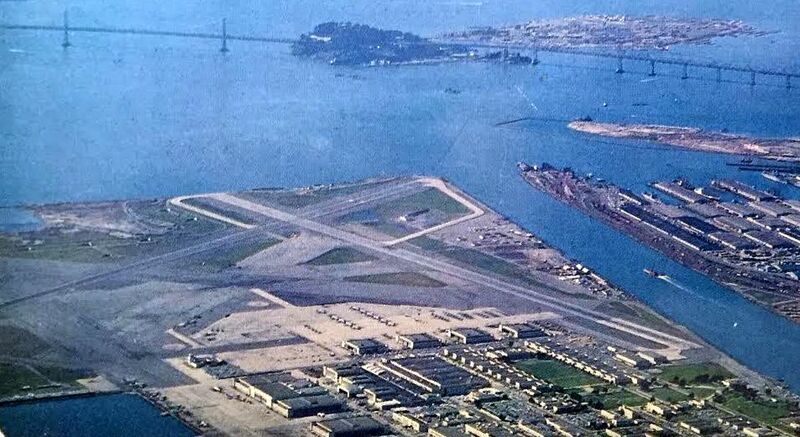 aerial view looking west at NAS Alameda, with Treasure Island also visible in the background (courtesy of Kevin Walsh). 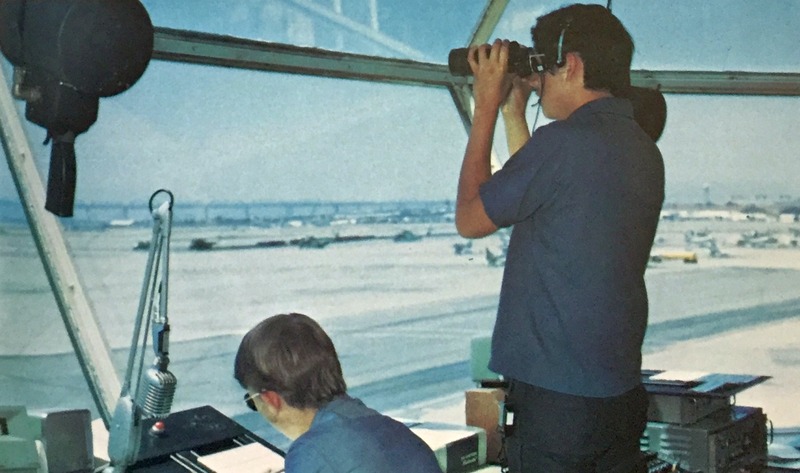 An undated US Navy photo by Matt Perez (courtesy of Kevin Walsh) from a 1973 base directory, looking out from NAS Alameda's control tower. 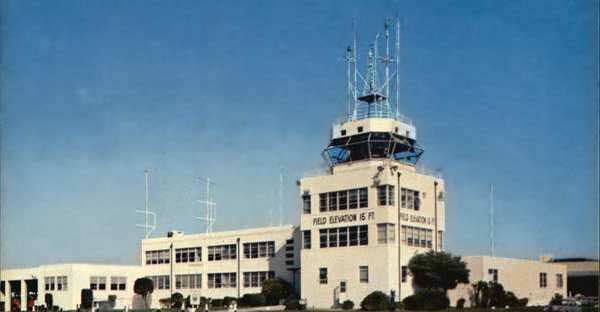 An undated photo of NAS Alameda's control tower. A November 1977 photo of BuNo 147656, a Douglas KA-3B Whale of VAQ-308 at NAS Alameda. 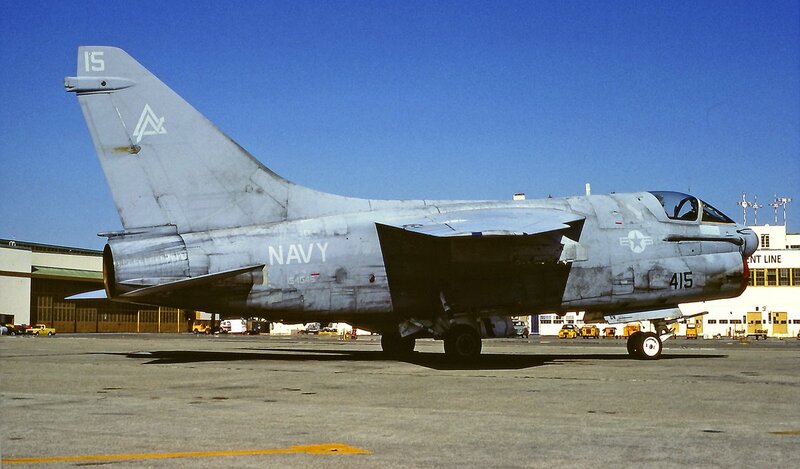 An August 1983 photo of BoNo 154545, a tired-looking Vought A-7E Corsair II of VA-304 at NAS Alameda. as well as P-3 Orions along the former seaplane ramp along the east side. 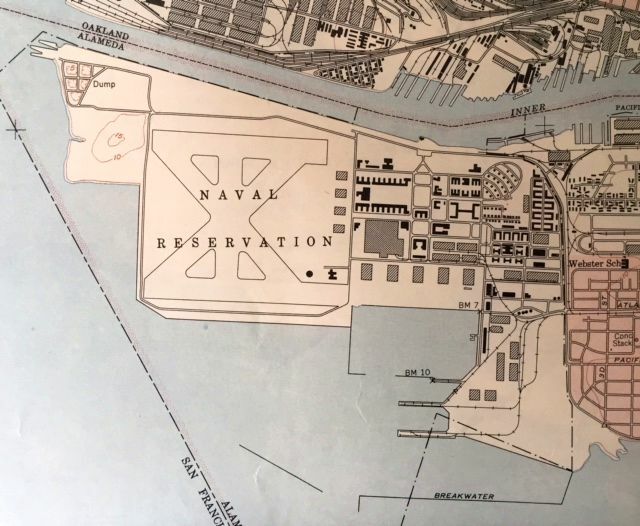 A 1988 airport diagram of Alameda NAS. 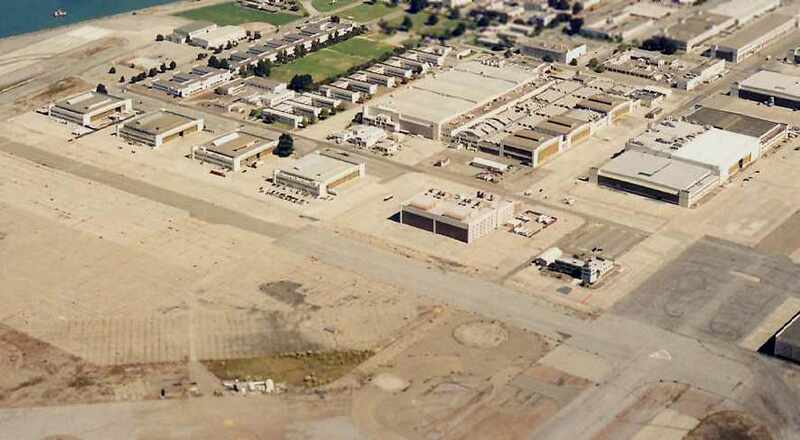 A January 1989 DOD aerial view looking southeast at NAS Alameda. 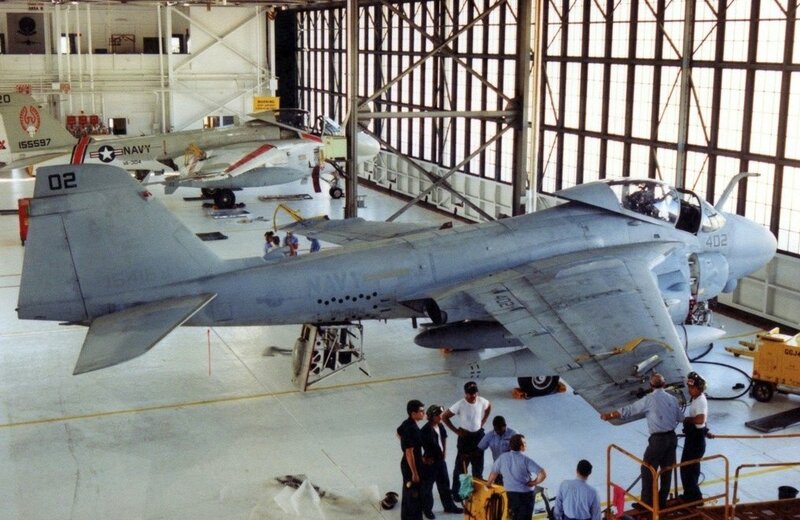 A 10/17/90 photo of 2 Grumman A-6E Intruders inside an NAS Alameda hangar. after having taken off from Alameda, with the base visible below. 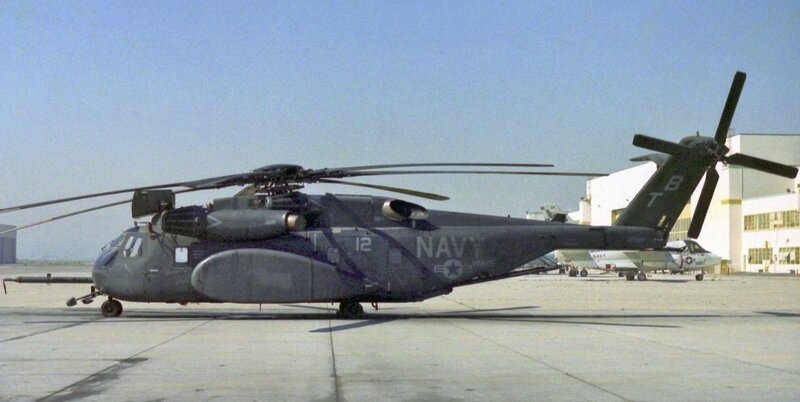 A 3/10/91 photo of a Sikorsky MH-53E Sea Dragon & a Lockheed S-3B Viking in front of an NAS Alameda hangar. 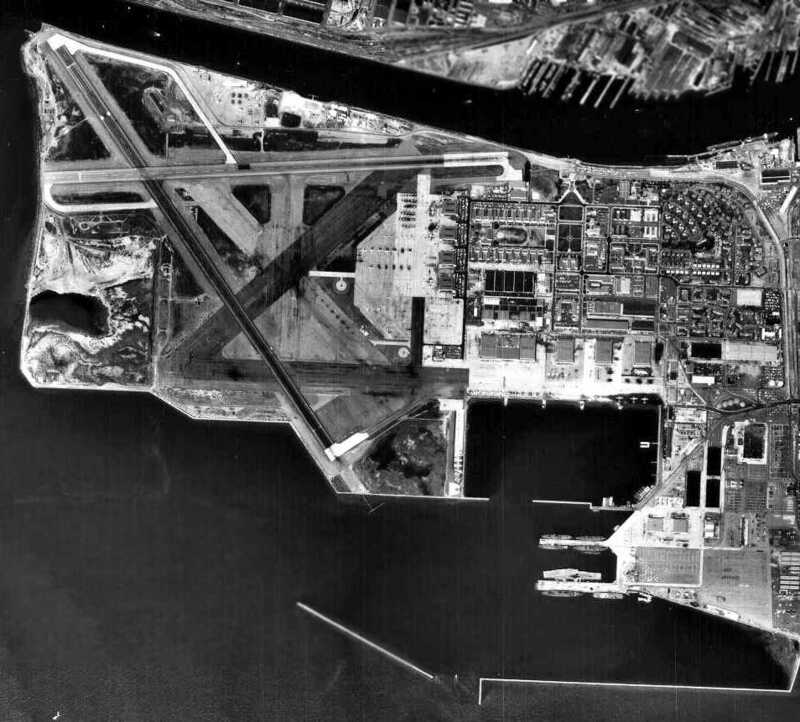 The last photo showing NAS Alameda still in use as an airfield was a 1993 USGS aerial view looking north, only 4 years before it closed, showing a few aircraft still on the ramps. 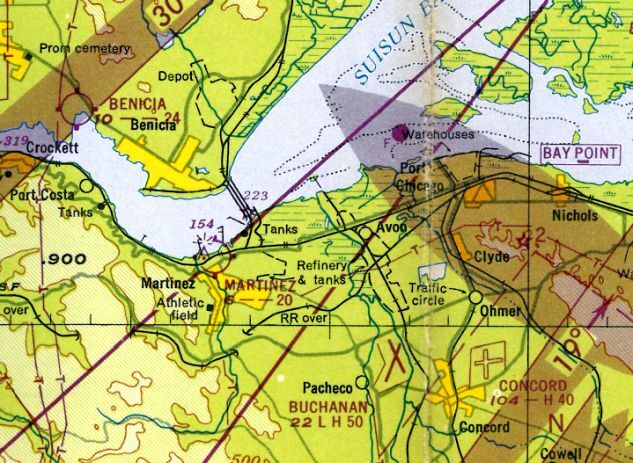 The 1996 USGS topo map depicted the massive airfield infrastructure of the Alameda NAS. 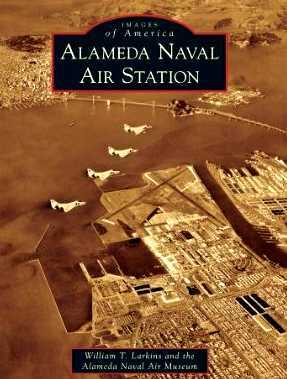 Alameda NAS was closed on 4/25/97 as part of the Base Closure & Realignment process. At the time of its closure, 2 asphalt runways were still maintained (the largest, 5/31, was 8,400'). 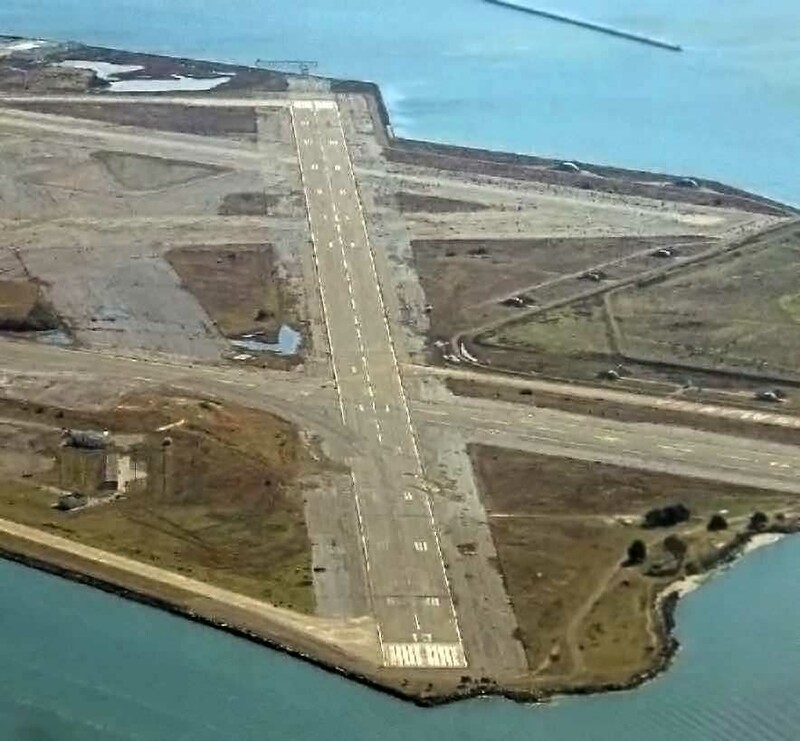 Civil reuse plans did not include any aviation uses of the massive NAS Alameda airfield. 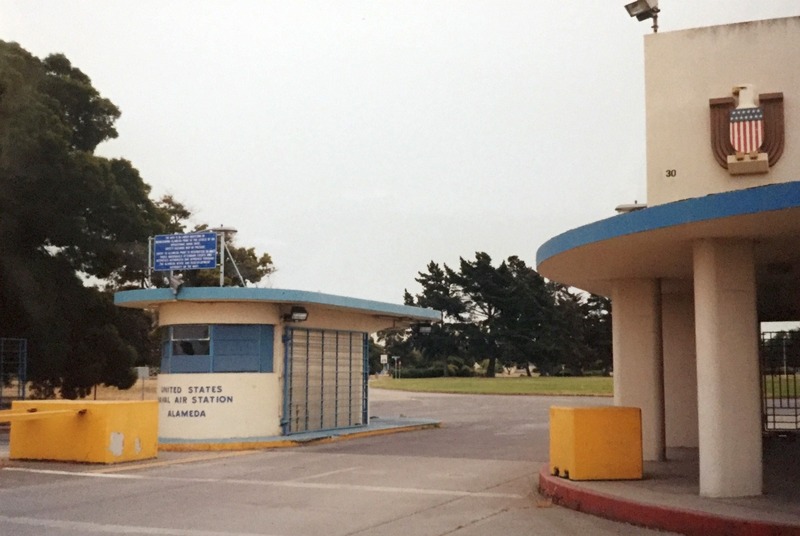 A 2000 photo by Kevin Walsh of NAS Alameda's Art Deco gate. in 2001 as a movie set for the film "The Matrix Reloaded" (courtesy of Eric Barbour). 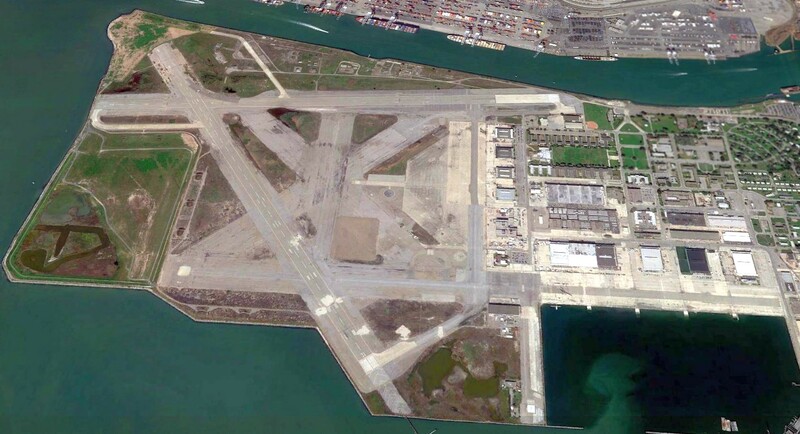 According to Eric Barbour, the former runways at Alameda were used in 2001 to film part of the movie "The Matrix 2". 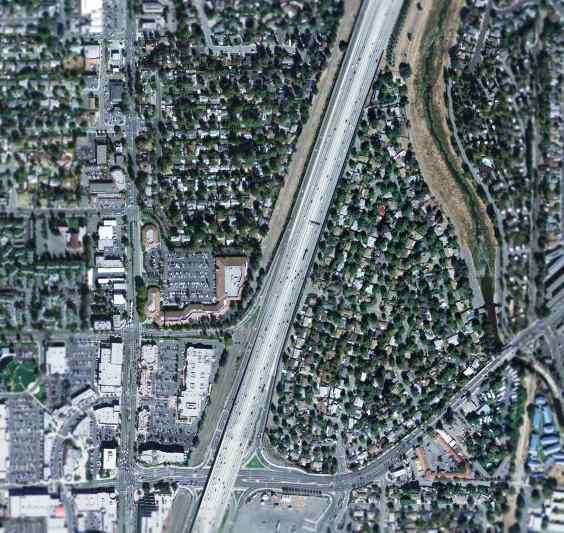 An entire 3-mile-long section of freeway was constructed on part of Runways 13 & 25.
but the layout of the roadway sections were still perceptible on the runways. A March 2003 photo by Kevin Walsh looking north at the NAS Alameda control tower. A March 2003 photo by Kevin Walsh looking east along the NAS Alameda runways, with the San Francisco skyline & the San Francisco Oakland Bay Bridge in the background. A beautiful 2003 photo by Erick McCarthy of the San Francisco skyline behind the remains of the runways at NAS Alameda. with the hangars & control tower of NAS Alameda visible on the left. A 2003 photo by Bill Larkins of a Douglas A-4 mounted on a pylon at Alameda. 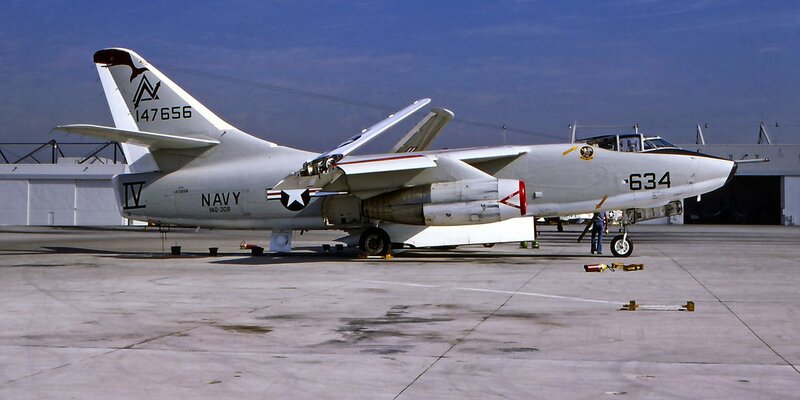 A 2003 photo by Bill Larkins of a loaded Vought A-7, mounted on a pylon at Alameda. 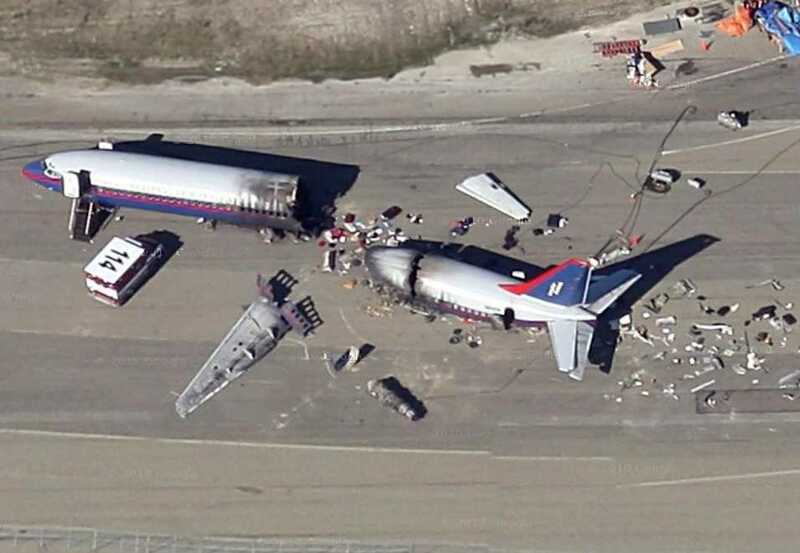 A 2003 photo by Tim Tyler of Building 77 at Alameda - still marked as the "Air Terminal". Tim Tyler visited the former NAS Alameda in 2003.
the ramp area in front (south) of the former NAS Alameda Building 77 - the old Air Terminal Building. with the newer ATC/Terminal Building being on the west end. The newer ATC building is actually the corner, as the hangars & ramp area basically form an 'L' shape." with several former Navy ships in the background. (including one that seemed to have been converted from a barge), the faded helicopter LZ markings, and 4 major hangars. Three in a row & then one located right behind Building 77. NAS Alameda is now known as Alameda Point, and is pretty much owned by the city of Alameda now. if some companies have just chosen not to put any signs up on their doors or something." mounted on the wall next to the doors at the old Air Terminal." with 'Air Terminal' lettering on the ramp-side of it. and a large NAS Alameda emblem is still up on the wall next to the doors. and they were anxious because they had a 2001 opening date. but not dirty or showing any signs of vandalism. Apparently the museum group suffered from a variety of mismanagement, and was short-lived. moored several hundred yards away." "The Pan American Airways System artwork is on the side of one of the old hangars behind the old Air Terminal building. I'm assuming it was a hangar used by Pan Am Clippers back in the day." Tim Tyler continued, "The hangar behind the Air Terminal is Hangar 41, the 'AIMD' [Aircraft Intermediate Maintenance Department] Hangar. and an old cipher lock on the personnel door, located in between the 20'x40' Quonset hut & the hangar." A 2003 photo by Tim Tyler of NAS Alameda's Hangar 40. "The next major Hangar, number 40, is now the Bladium Sports Club, at 800 West Tower Avenue." is involved with helping design, build & ship exhibits for trade shows. The south side of this hangar is at 37-46.9 N / 122-18.19 W.
this hangar had been used by Navy Helicopter Squadron 85." but from all external appearances, it seems unused these days. However, in peeking through a window, I did observe a 2003 calendar on the wall of a work area. which seemed to provide some power & liquid receptacles for parked aircraft. Building 12 is a very large hangar, perhaps 700' long on it's south side. It has several street addresses - 1090 & 1190 West Tower Avenue. The '12' numbers are on the hangar doors on the east end of the building. but the doors on the number side indicate it is Hangar 11." 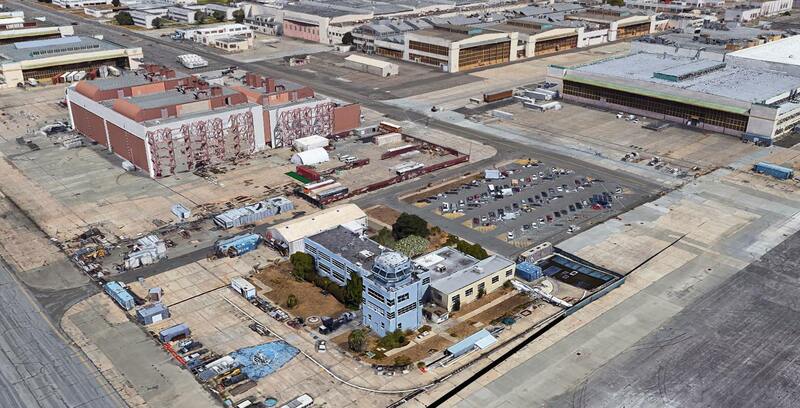 Tim continued, "Hangar 25 is a newer (at least 1970s) hangar & is on the opposite side of the ramp from the ATC Tower. It had 3 separate bays to it, and the east end is at N 37-46.83 / W 122-18.60. It seems mostly to be used these days for indoor antique shows & flea markets. It was used to remove the canons from aircraft, which would then be taken to nearby Building 29.
with several storage bays that have newer cars in them." Tim continued, "A couple hundred yards South of Building 494 is Building 29.
and seemed to have old CCTV camera mounts in all 4 corners of the fenceline. It's a fairly modern poured concrete building, with a variety of ventilation ducts on the roof. The entrance door was hardened, and next to it is a 10'x15' equipment door. this building is now used by Rosenblum Cellars. and was hardened in case of misfires or explosions." is the ATC Tower at 2175 Monarch Street. which to me indicates it became the new Air Terminal facility. the name of the entity in charge of redeveloping the former NAS. built in Detroit, Michigan in the 1940s." painted onto the gray concrete ramp area in front the runway-side entrance to this building. 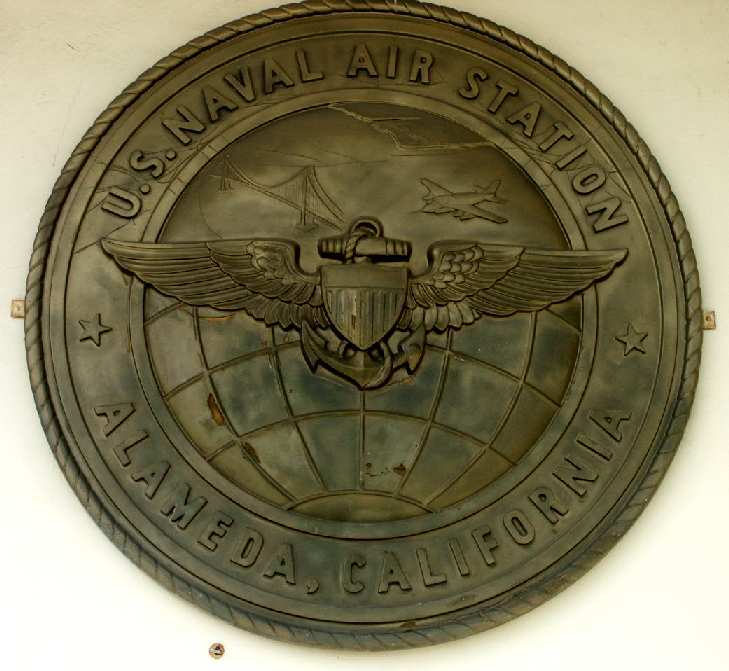 but it read 'Naval Air Station Alameda California' & had a red, white & blue shield in the center." Tim continued, "Continuing north on the ramp area past the ATC/Terminal Building puts you on the other part of the 'L' shape. indicating that the area is now a California Least Tern nesting area. This was the site in particular I was hoping to be able to access with my bike. Off in the distance, near the bay I can see 2 munitions igloos near the southwest corner of the runway area. More towards the center is a series of several small concrete buildings & one Quonset hut structure. A couple of cars & a motorhome are parked in their vicinity. perhaps it was a generator or transformer building for the airfield lighting system? to re-use some of this valuable bay-front land with spectacular views of the San Francisco skyline. General Motors has leased the grounds to provide demo rides of their products, etc." and is a modern hangar with a lot of heavy-duty ventilation on the roof. It's now used by Coach Specialties Inc. and is the former aircraft painting facility. Coach Specialties uses it to paint large buses." Tim continued, "The North end of it seems to be used by another firm. There were about a dozen strange looking 4 door cars known as 'Cayenne Turbos' but no manufacturer name or logo. Turns out they're a new Porsche product, brought in to test driven by Bay Area Porsche enthusiasts his weekend." "The next hangar north is number 23, now apparently used by 'WCN' company. Next is Hangar 22 at 2501 Monarch Street, now used by Creative Technology. Hangar 21 is/was used as a factory by Kitz Direct Seal Valves, but sure looks like it is unused now. On the runway side of Hangar 21, 'Welcome from the Firebirds' is still easily legible along the roofline. These hangars were formerly home to Marine Corps aviation squadrons." A 2003 photo by Tim Tyler of NAS Alameda's Hangar 20. Compare to the photo of the same building, 48 years before, several paragraphs above. but it is occupied by Ocean Systems Inc, Protector Boats, Juniper Ridge, and Edge Innovations. Protector Boats is a series of harbor patrol type RIB/RHI boats, and several were stored outside. 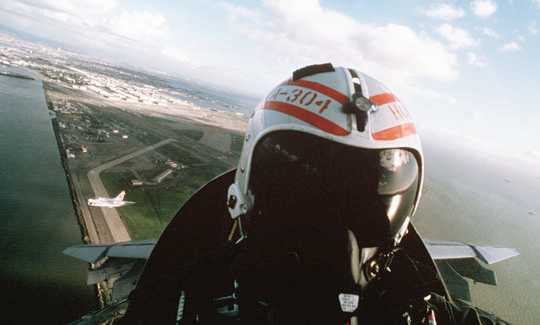 the F-3J 'Fury' aircraft was parked when the photo [several paragraphs above] was taken. It's kind of eerie to be parked in that exact spot right now, while I look at that photo from 1955. The tower cab is no longer up on the end of the hangar. and then an active Port of Oakland commercial shipping area beyond that." 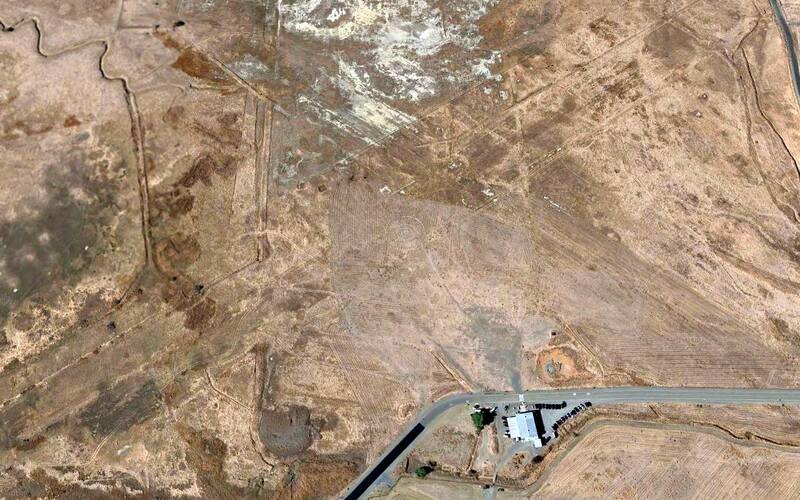 Tim continued, "On the west-northwest side of the runway area is the former modern WSA for 'special' weapons. That portion of the base also had a small arms firing range, and south of this area, I spotted the field's tetrahedron." with lots of areas to explore, however in this visit & report, I'm tending to focus on the aviation-related aspects. because they're set back behind others & not up against the flight line." 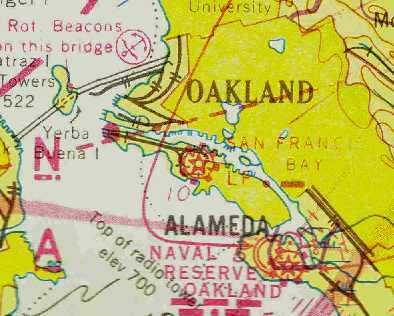 during the time the Vinson's home-port was NAS Alameda. allowing me to revise some tentative wording in this Situation Report to something definitive." which is located in Alameda's former Hangar #20. "This is an old helo hangar. There are still diagrams on the wall of the different types of helos... size, dimensions etc. (very cool)." in the old Air Terminal Building in Alameda Building 77 of the old Naval Air Station. It is open on the weekends & features the local history. As you come through the gate on Atlantic Ave when you reach the fork it is on your right." A 2004 photo by Tim Tyler looking east at Alameda's abandoned hangars. 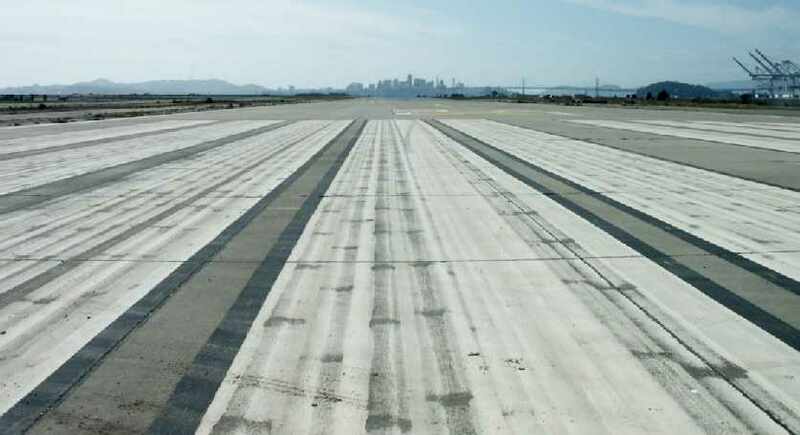 A 2004 photo by Tim Tyler looking west along one of Alameda's abandoned runways, with the San Francisco skyline in the background. 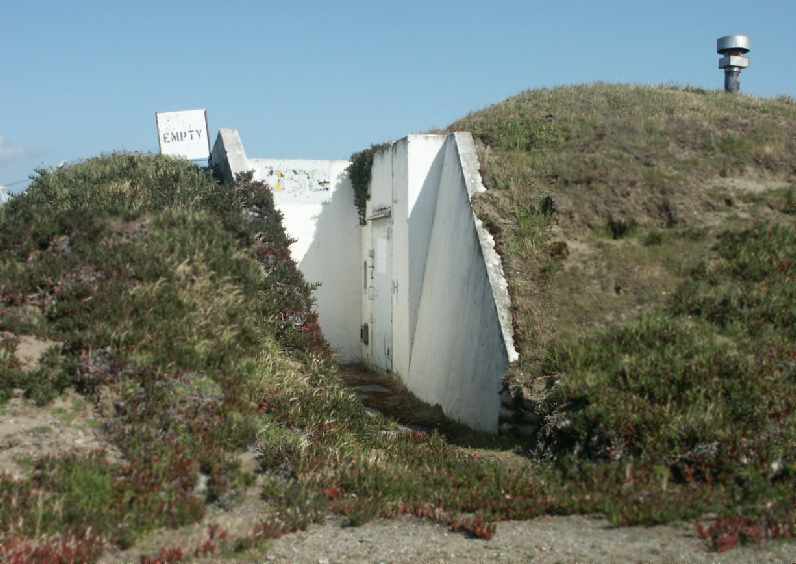 A 2004 photo by Tim Tyler of one of Alameda's abandoned former munitions storage bunkers. 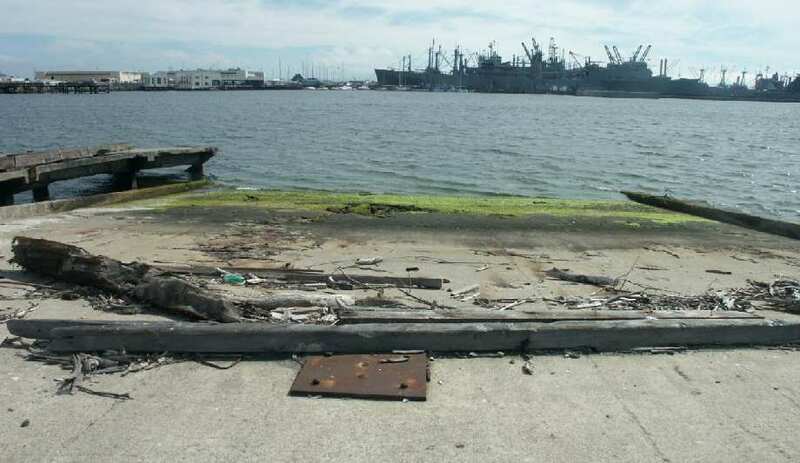 Tim Tyler visited the abandoned NAS Alameda again in 2004.
and I was able to drive around this portion. and then an adjacent compound that had been guarded by a contingent of Marines, and stored nuclear weapons." 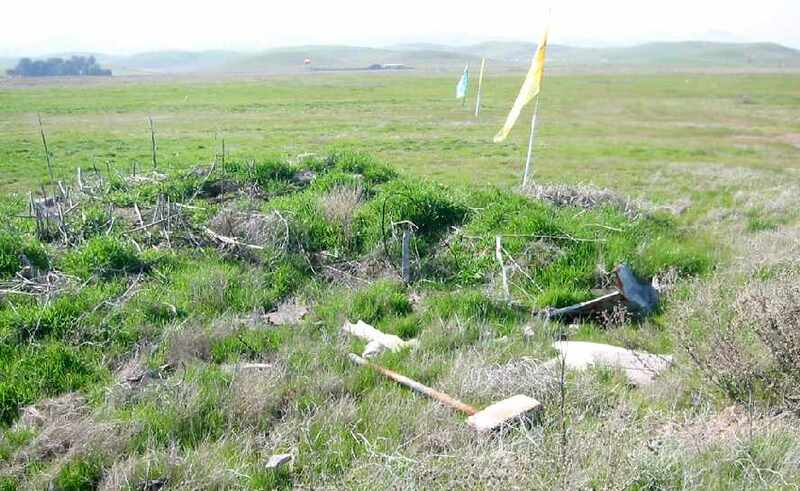 Tim continued, "There was another fence running East/West & cutting the airfield in half. though there was some sort of truck driving around there. the old shooting range, windvane, and a couple other miscellaneous buildings." and the skyline of San Francisco in the background. 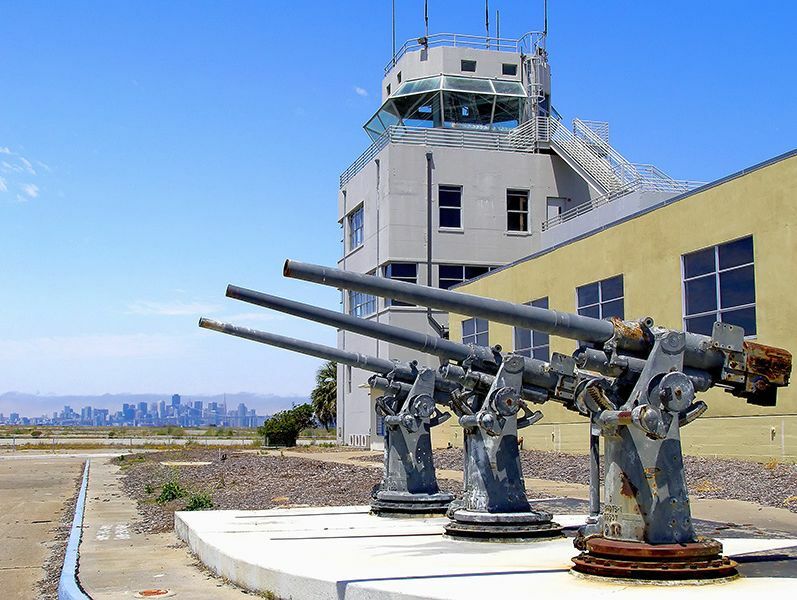 A 6/23/06 photo of 3 Mk.22 naval guns mounted in front of Alameda's former control tower. 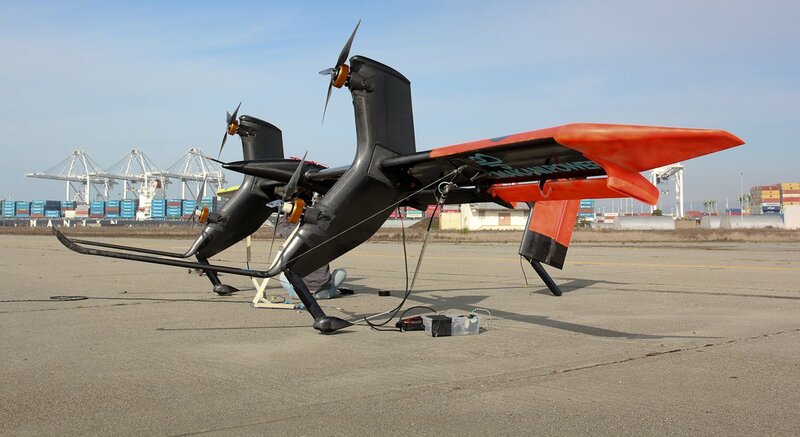 According to Jonathan Westerling, “Around 2006, a startup called Makani moved into the control tower building at Alameda NAS. They were developing a kite to generate wind power more efficiently. For years Makani flew the flight tests for the various kite designs on the wide open NAS runways. 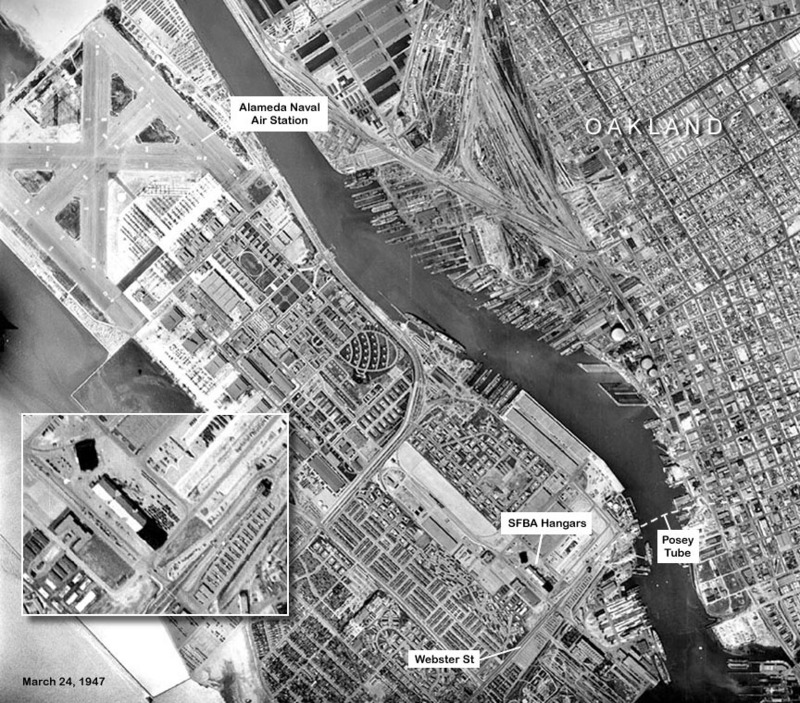 A 2006 aerial view by Bill Larkins looking northeast at the Alameda ramp, hangars, and control tower. A December 2006 aerial view by Ian Carisi looking southeast along Alameda's Runway 13. A November 2007 aerial view by Ian Carisi looking south at Alameda's former control tower. 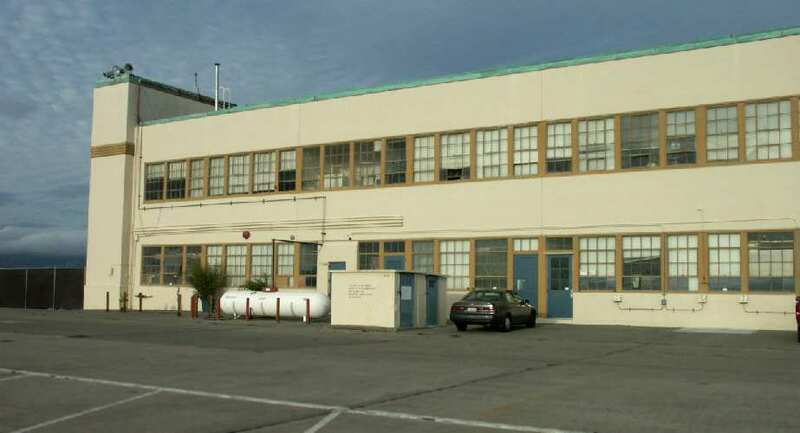 A circa 2008 photo of the hangars of Alameda's Naval Air Rework Facility. 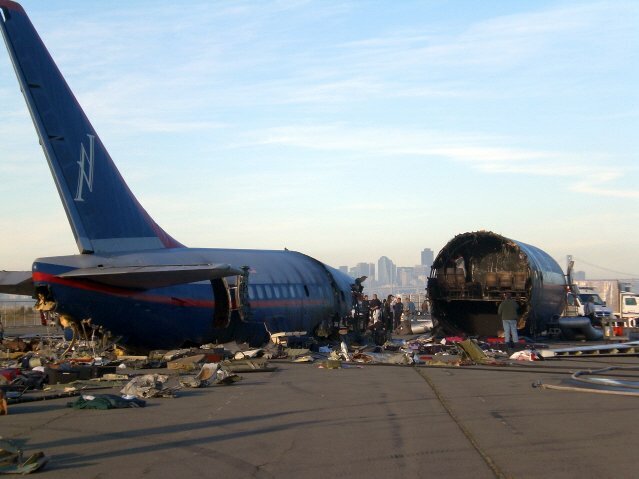 A circa 2009 aerial view looking north at the “wreckage” of a Boeing 737 on Alameda's Runway 7/25. According to Richard Yokley, this was used to shoot the 'Coming Home' episode of the NBC TV series 'Trauma', which originally aired November 2009.
used to shoot the 'Coming Home' episode of the NBC TV series 'Trauma', which originally aired November 2009.
on the cover of Bill Larkin's 2010 book “Alameda Naval Air Station”. In June 2011 Alameda's A-4 was seriously damaged when it toppled over when a crane was attempting to re-mount the A-4 on its display pylon. Tim reported in December 2011, “After only 2 months & 26 days all the damage that occurred in June 2011 was repaired &/or fixed. A 1/1/12 photo by William Larkinns of “the beautiful A4D-1 is now mounted at the main entrance to the old NAS Alameda - now called Alameda Point. (© Makani/Andrea Dunlap used with permission, courtesy of Jonathan Westerling). A 9/21/12 photo of the Space Shuttle on top of the Shuttle Carrier Aircraft 747 overfling the NAS Alameda control tower (copyright Makani/Andrea Dunlap used with permission, courtesy of Jonathan Westerling). 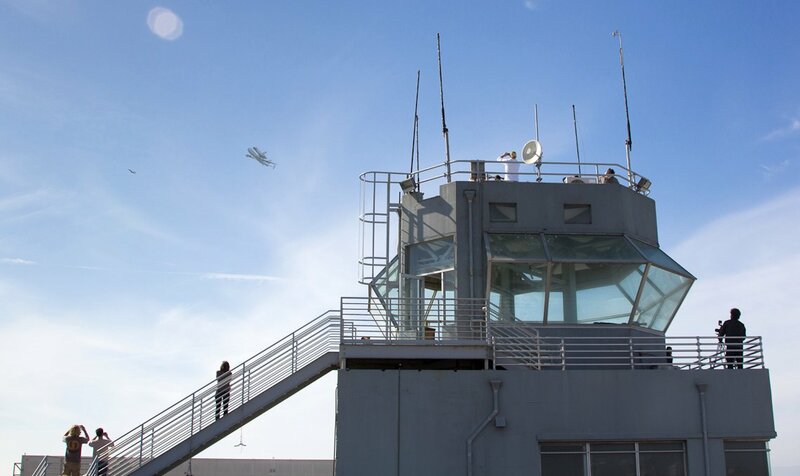 A 2/20/13 photo of the NAS Alameda control tower, now the headquarters of the Google Makani project (copyright Makani/Andrea Dunlap used with permission, courtesy of Jonathan Westerling). 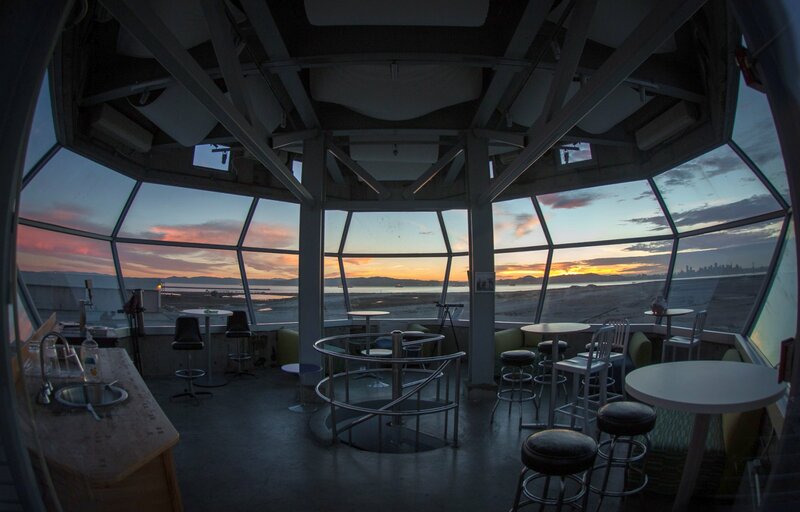 A 2/13/14 photo of the interior of the NAS Alameda control tower, reused as a meeting room (© Makani/Andrea Dunlap used with permission, courtesy of Jonathan Westerling). 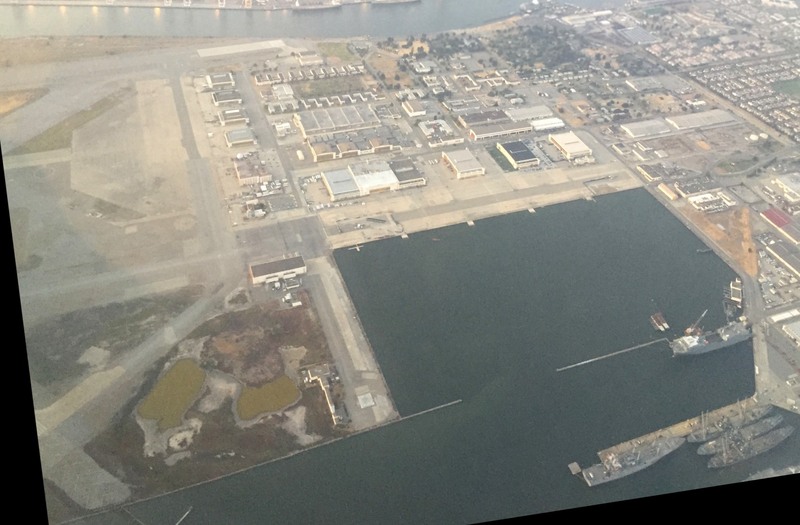 A 4/13/15 aerial view by Dallam Oliver-Lee looking southwest at NAS Alameda. What a shame to see such a massive amount of aviation infrastructure going to waste. 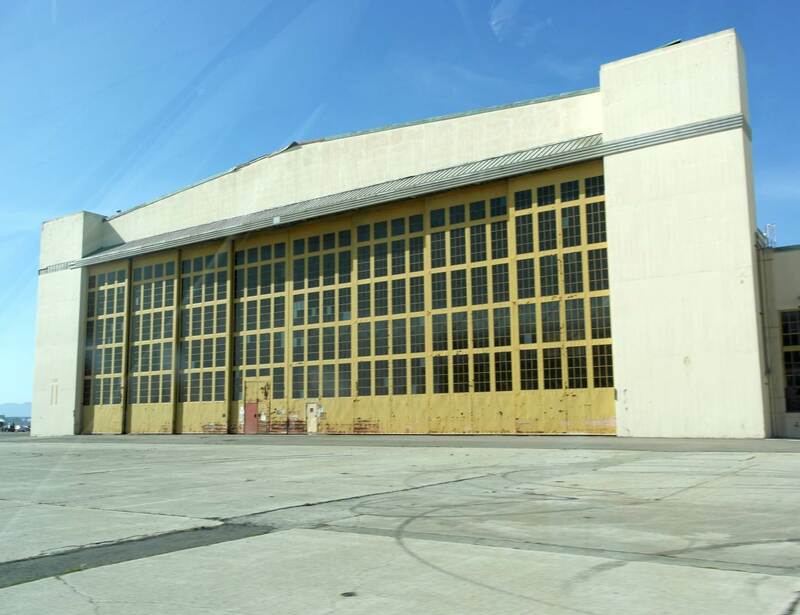 A 4/13/15 photo by Dallam Oliver-Lee of a former NAS Alameda hangar. A 4/13/15 photo by Dallam Oliver-Lee of the massive NAS Alameda ramp. 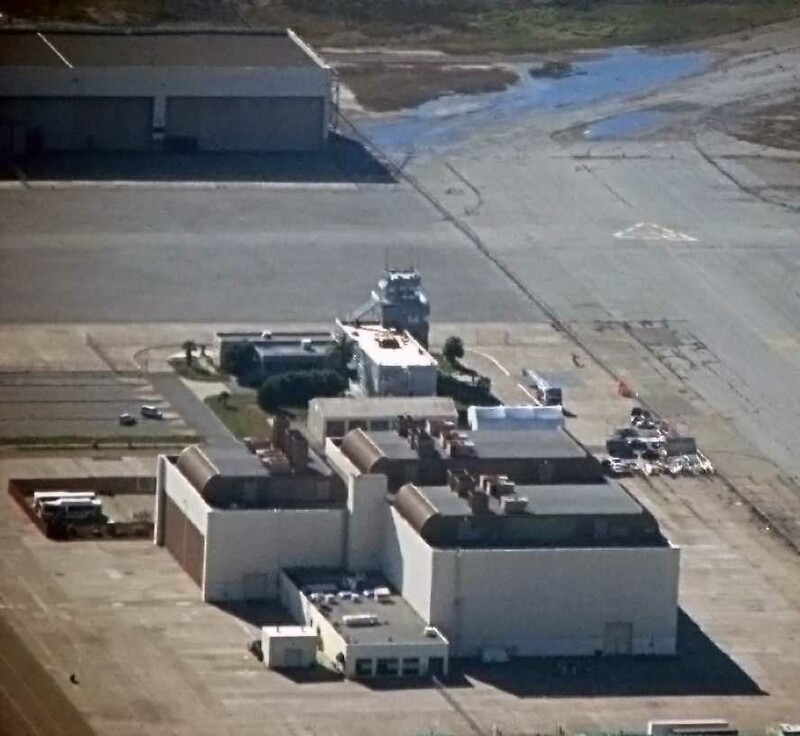 A circa 2015-2018 3D aerial image looking northwest at the NAS Alameda control tower & hangars. A 5/11/16 photo by Kevin Walsh of the heavily-loaded Vought A-7 mounted on a pylon at Alameda. A 10/27/16 photo (courtesy of Kevin Walsh) of the last plane to land (for now) on the NAS Alameda runway - a Cessna 172 which made an emergency landing. At least all of this extensive infrastructure is still being put to some aviation use. A 7/1/17 aerial view by Ian Carisi looking northeast at the massive aviation infrastructure which remains at the former NAS Alameda. 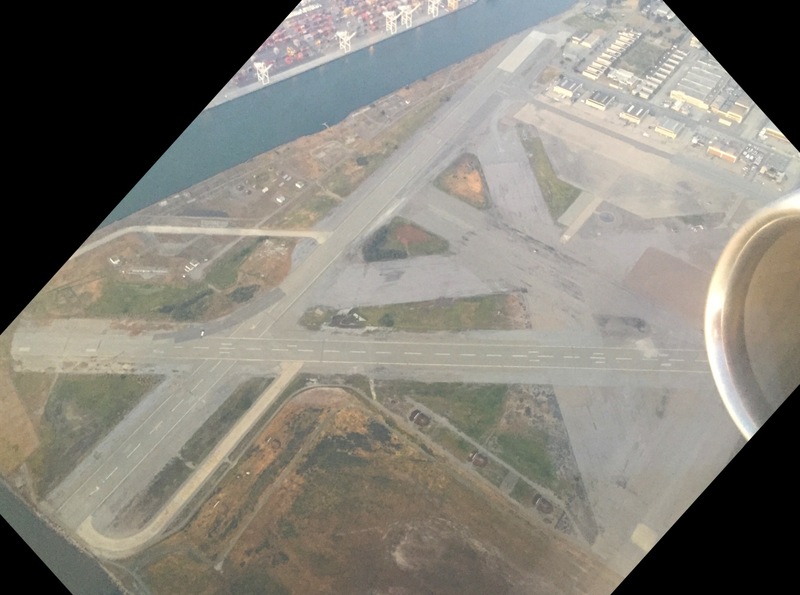 A 4/2/18 aerial view looking north shows the NAS Alameda airfield remained almost completely intact, with an extensive network of runways, taxiways, large ramp areas & numerous hangars. What a shame to see so much aviation infrastructure, paid for by the taxpayers, going to waste. 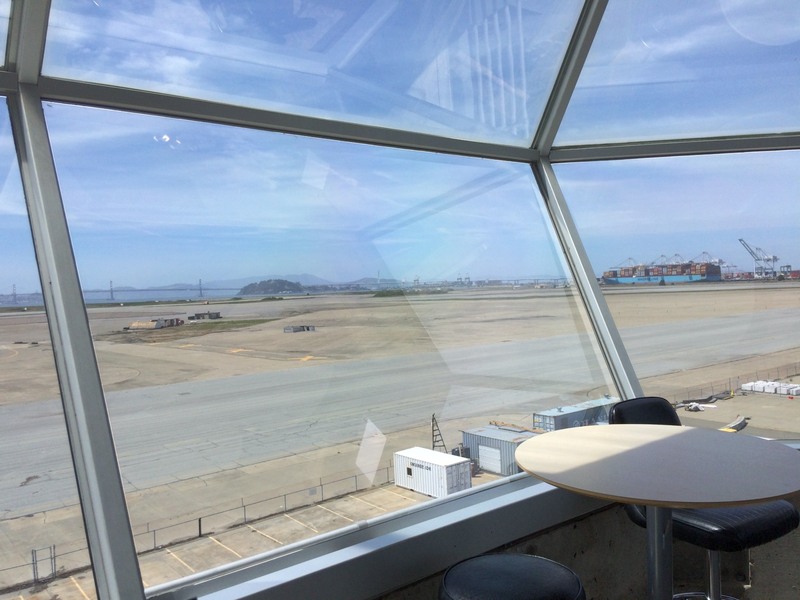 A 5/10/18 photo by Jonathan Westerling looking out from the NAS Alameda control tower, showing the same perspective as the 1973 photo. 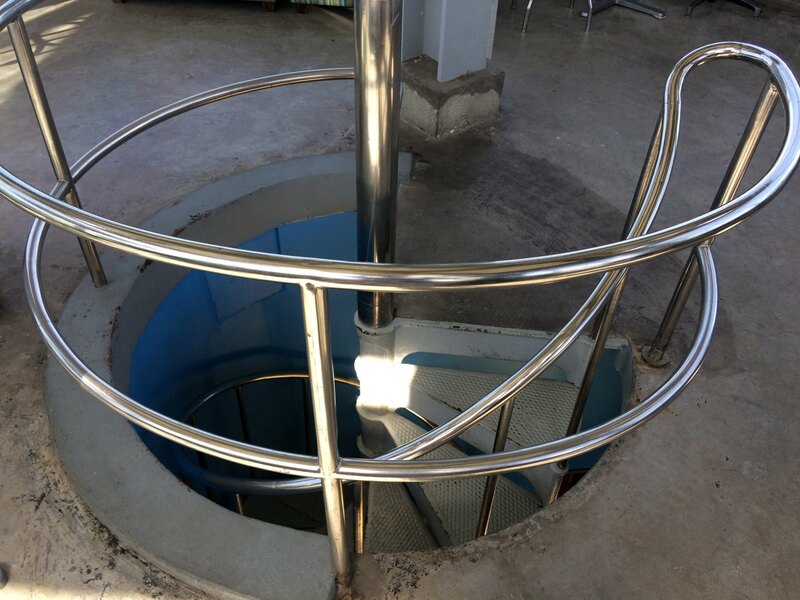 A 5/10/18 photo by Jonathan Westerling of the spiral staicase leading down from the NAS Alameda control tower. 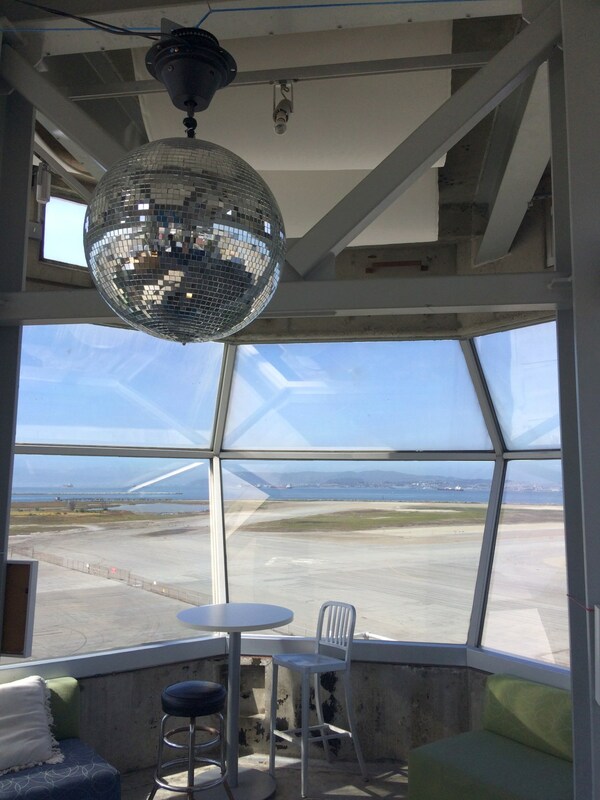 A 5/10/18 panoramic photo by Jonathan Westerling of the NAS Alameda control tower, ramp, runways, and hangars. A 6/7/18 aerial view by Kevin Walsh looking northeast at the former NAS Alameda hangars & ramps. A 6/7/18 aerial view by Kevin Walsh looking northeast at the former NAS Alameda runways.